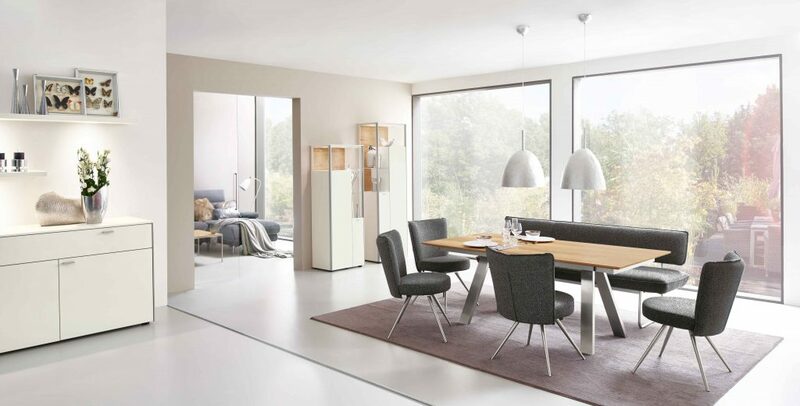 Our Spring Sale gives you the opportunity to buy at our best prices. All our prices are regularly checked against our competitors to make sure our prices are always good value and you will not be disadvantaged to on line prices. 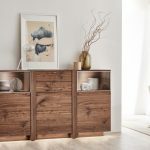 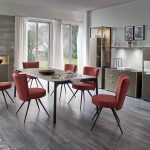 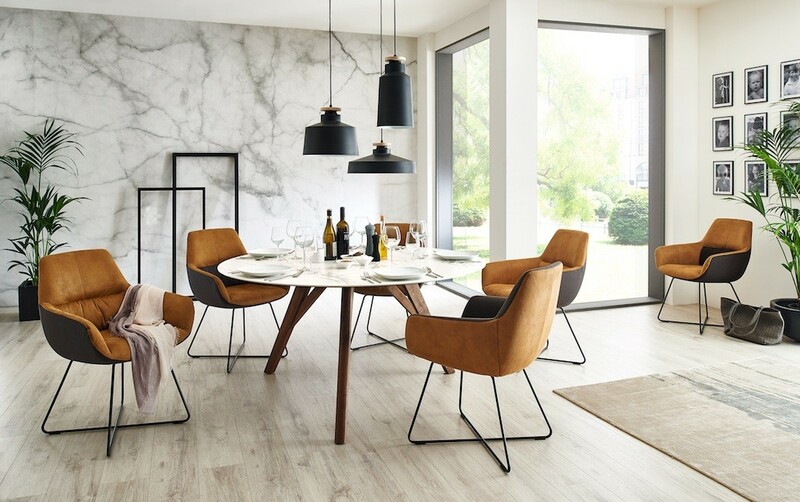 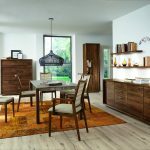 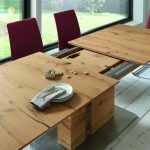 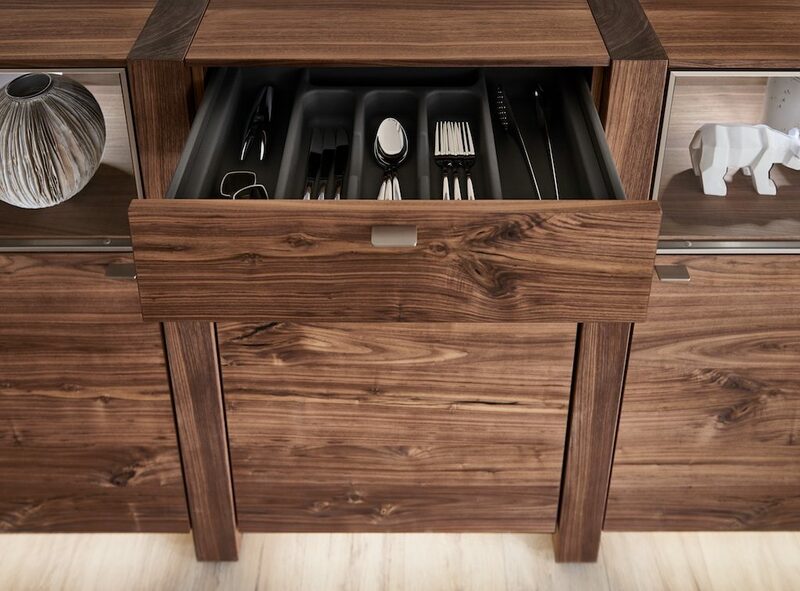 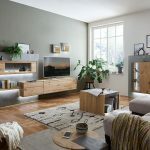 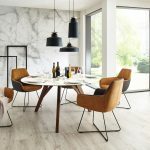 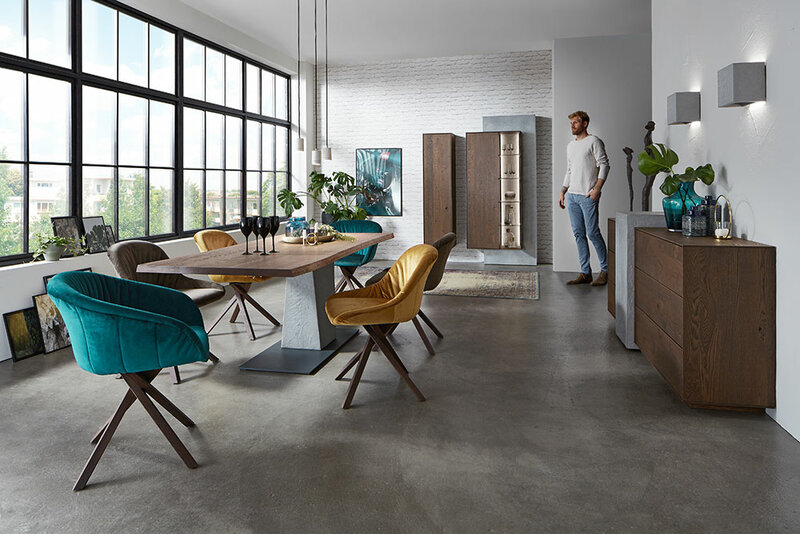 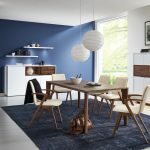 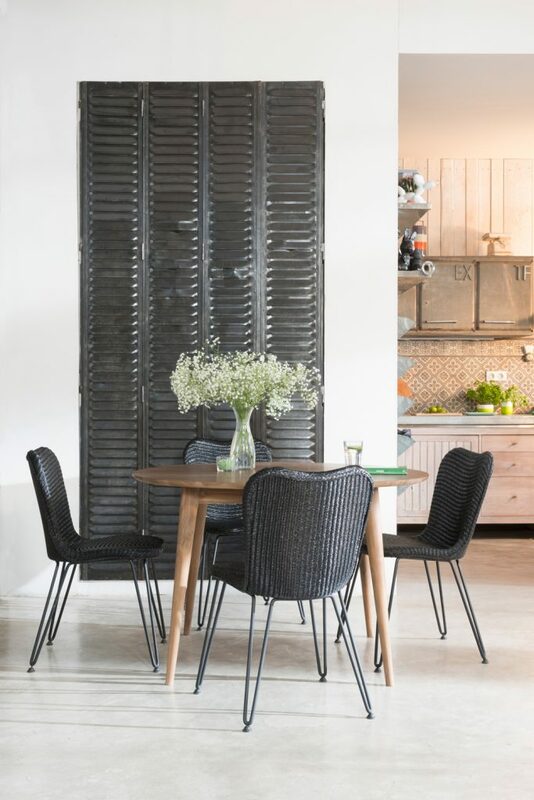 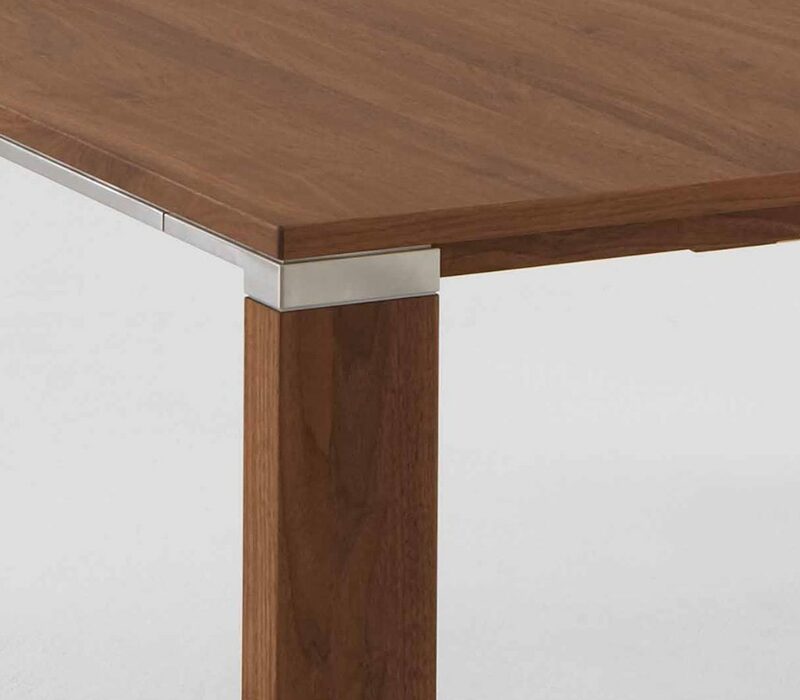 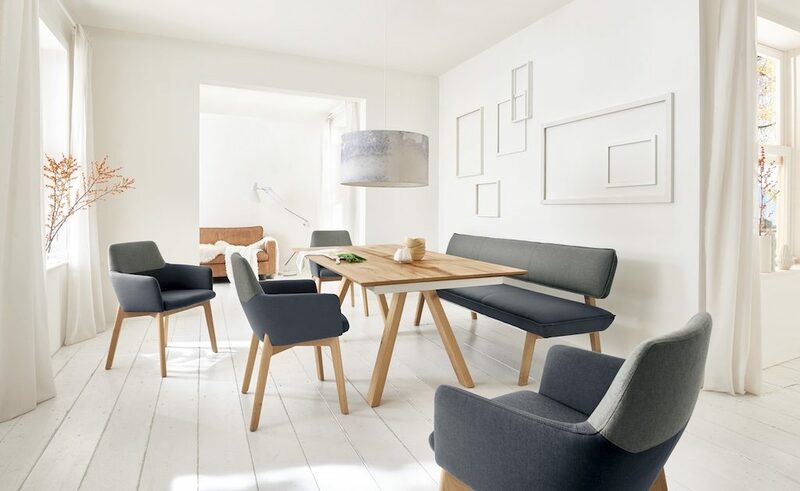 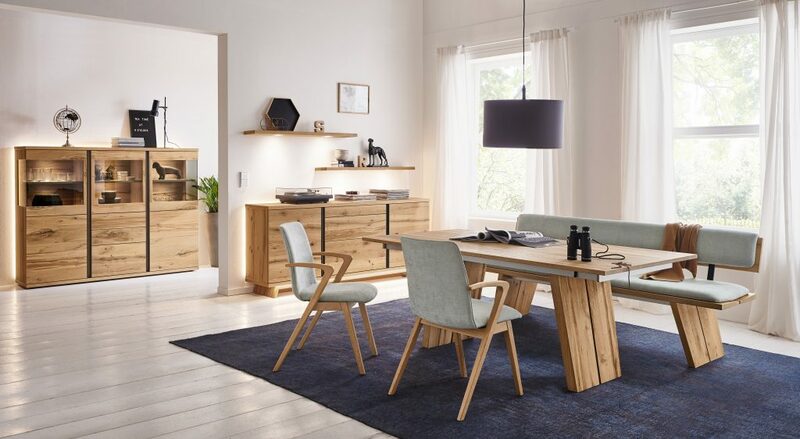 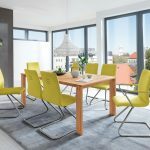 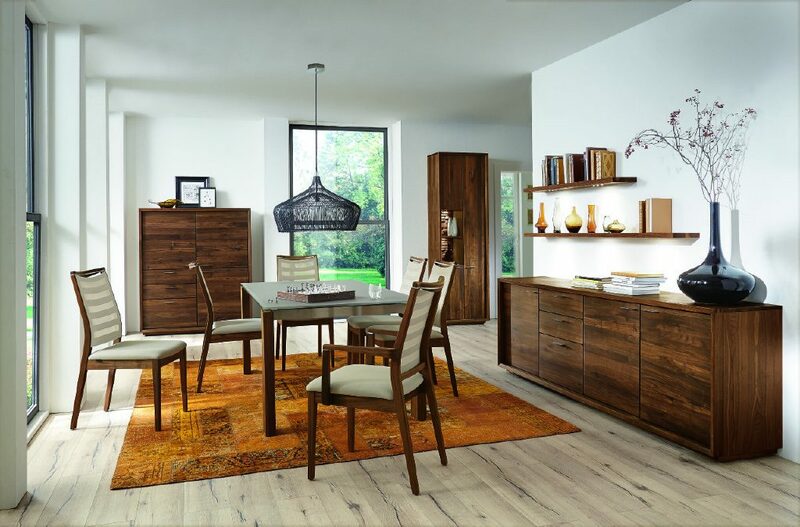 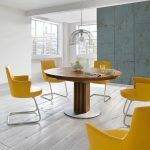 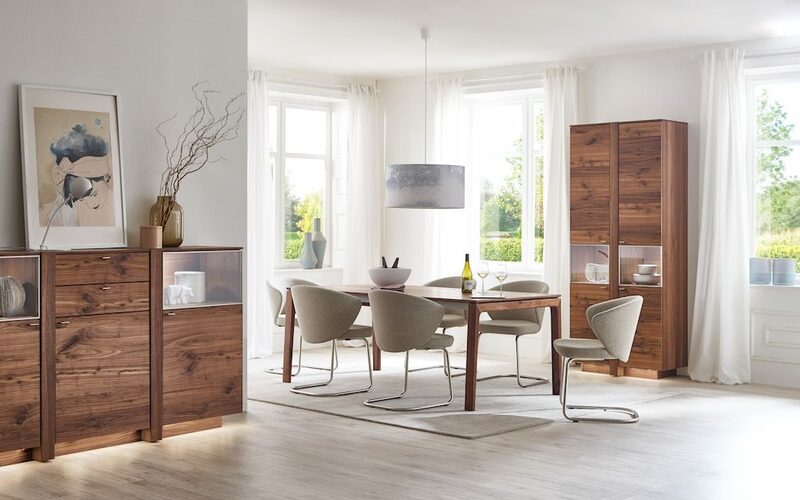 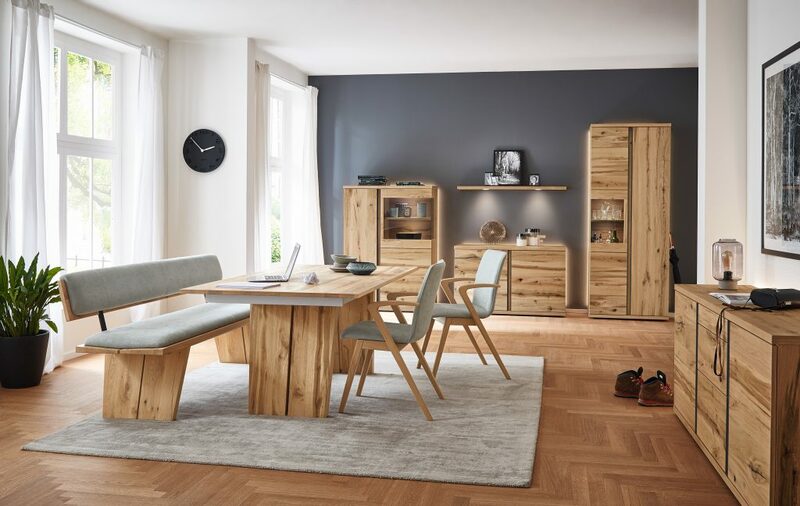 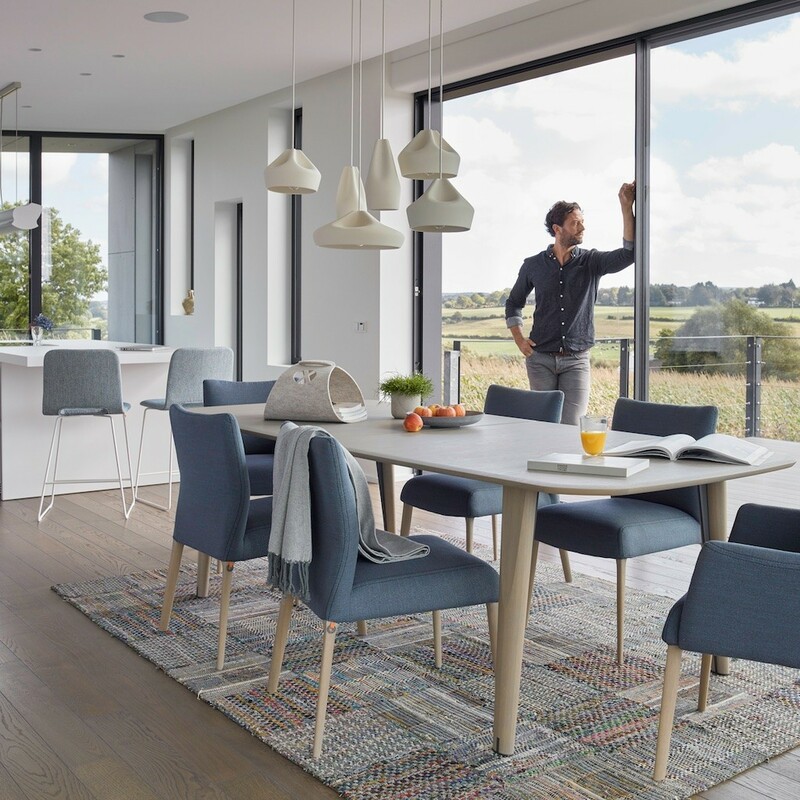 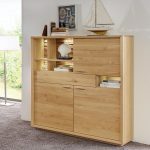 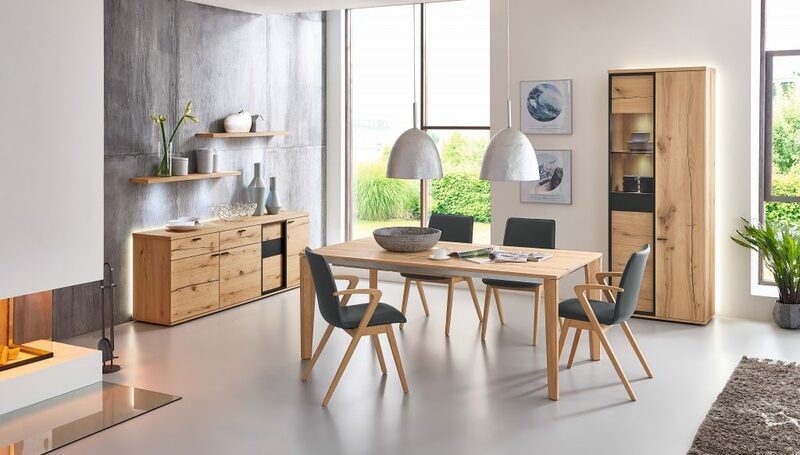 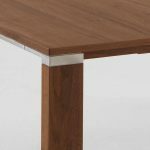 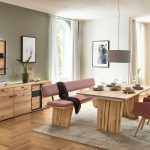 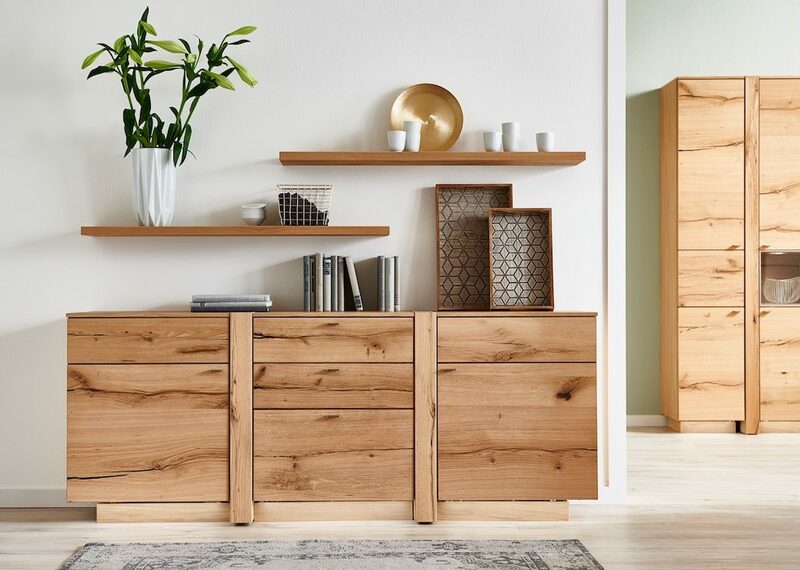 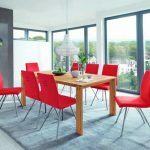 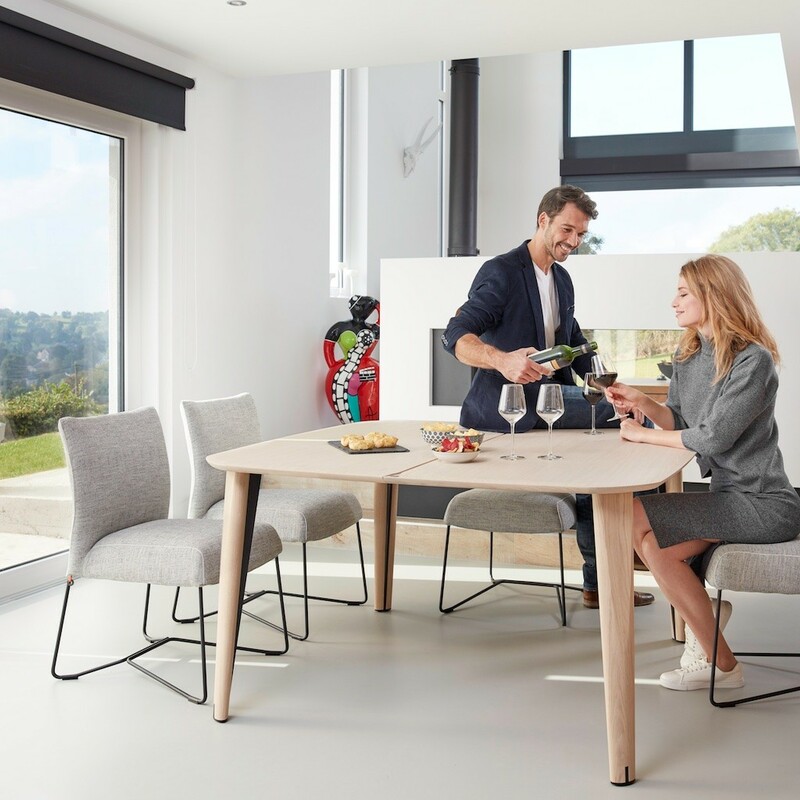 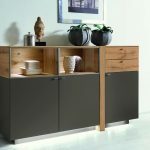 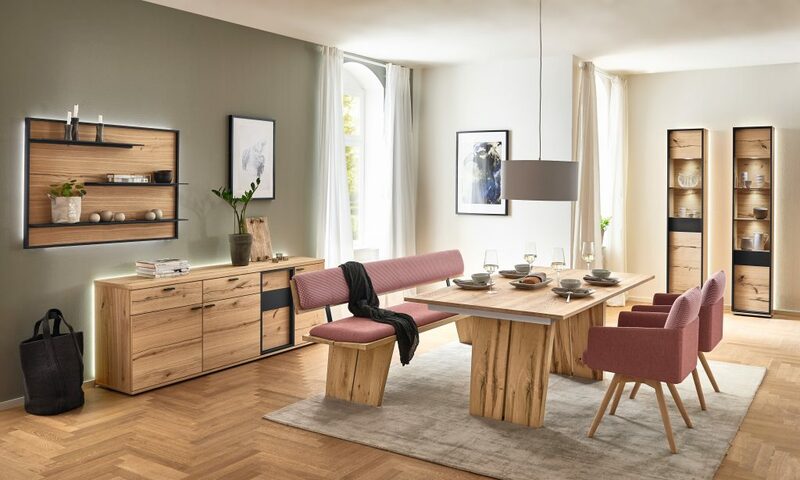 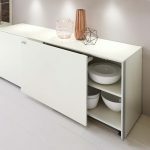 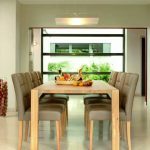 Our dining and cabinet furniture is exclusively sourced from ethical European suppliers, who manufacture original designs of high quality and good value. 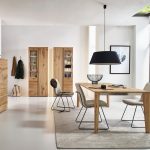 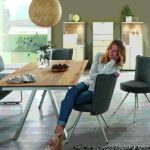 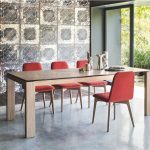 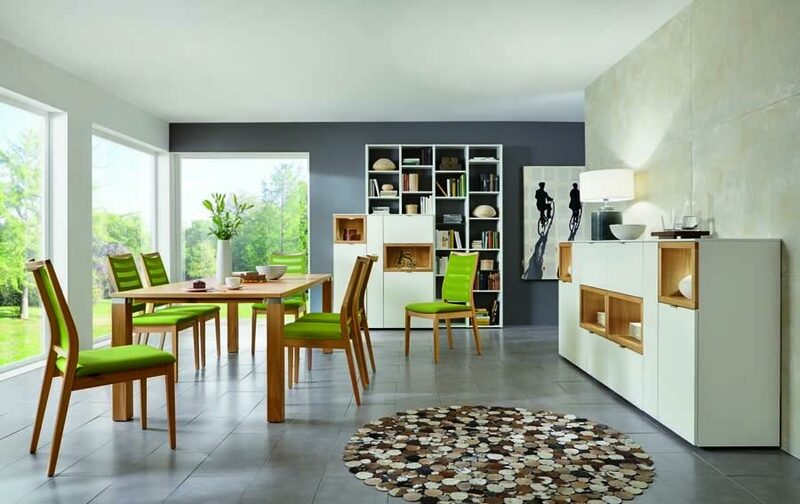 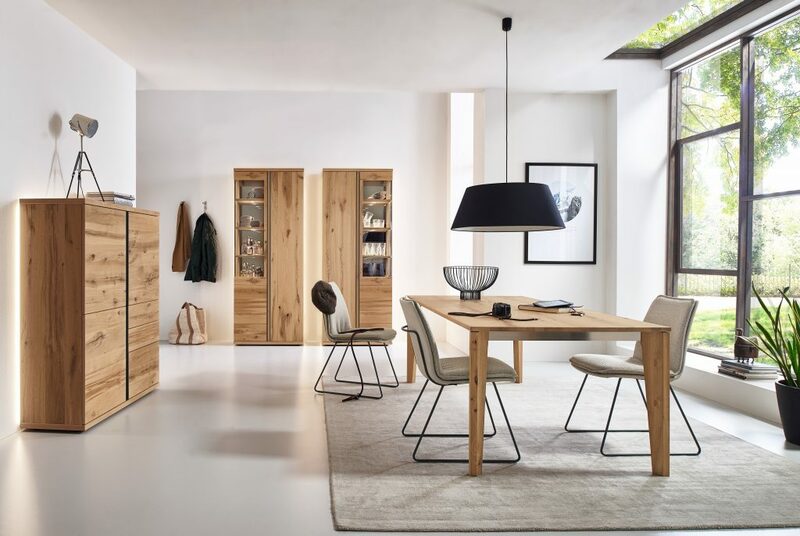 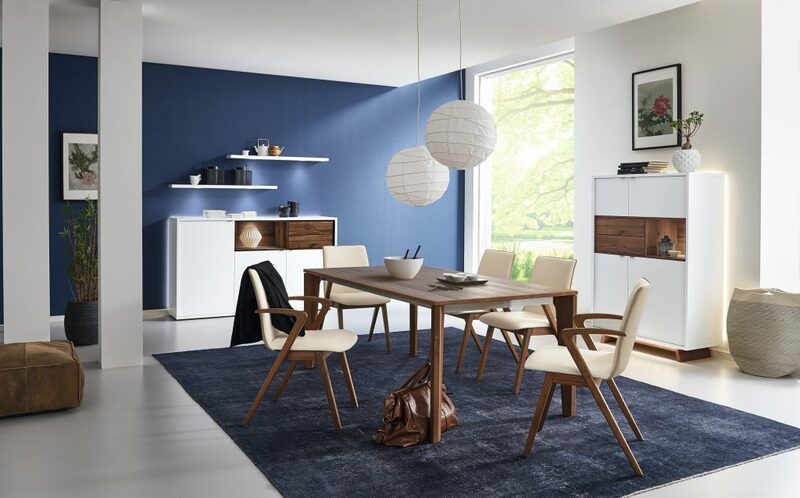 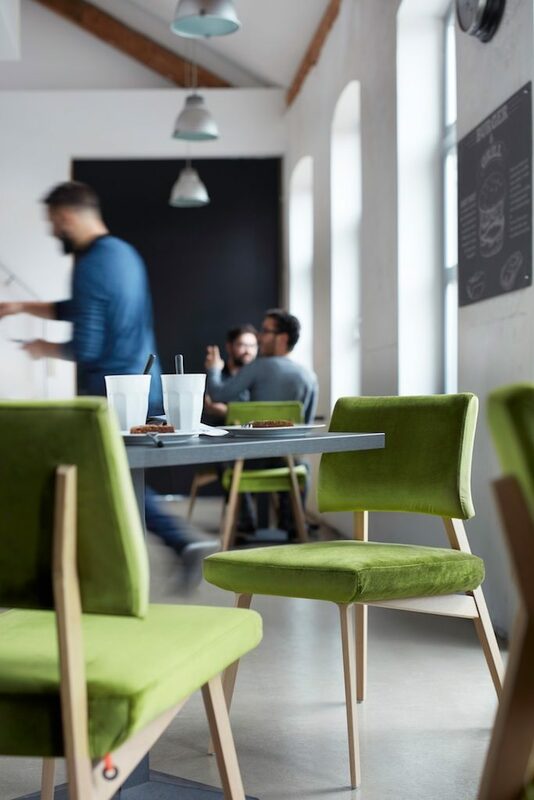 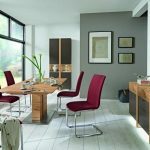 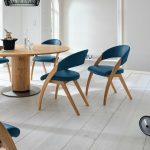 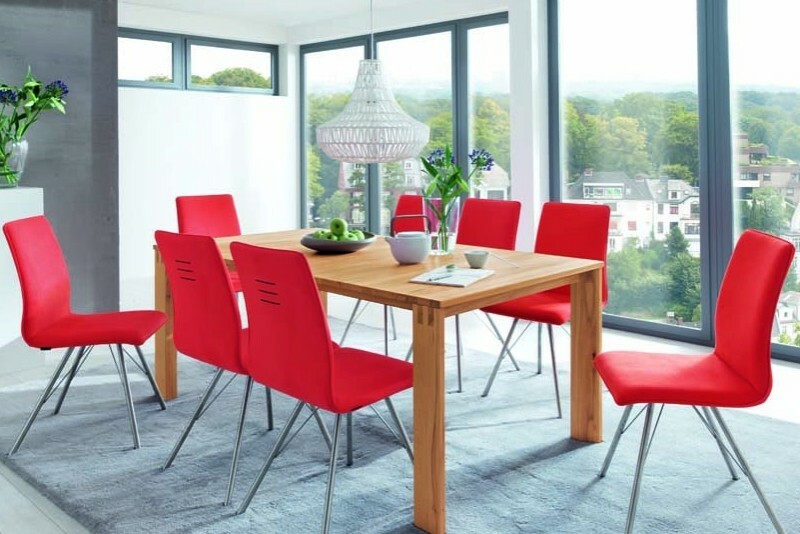 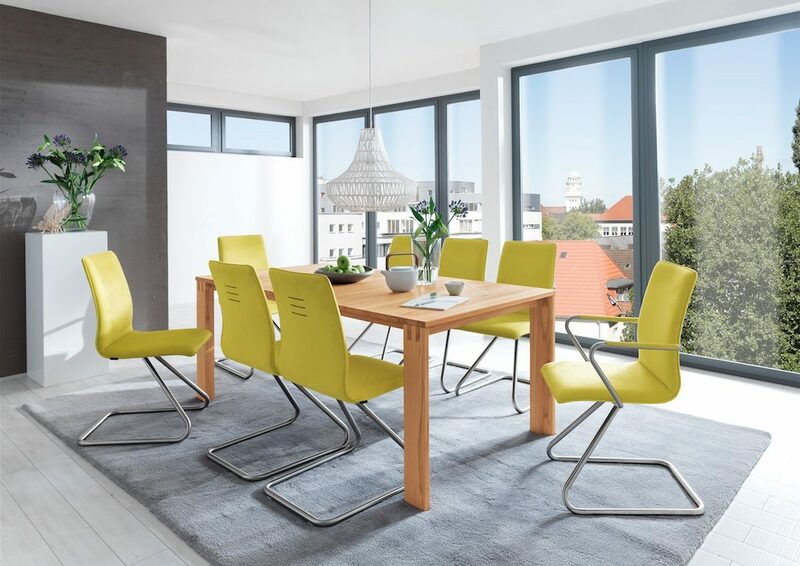 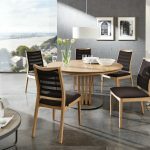 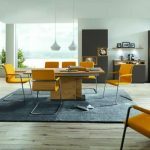 You can choose from modern German designs, contemporary Italian tables and chairs, chunky solid oak tables and many others. 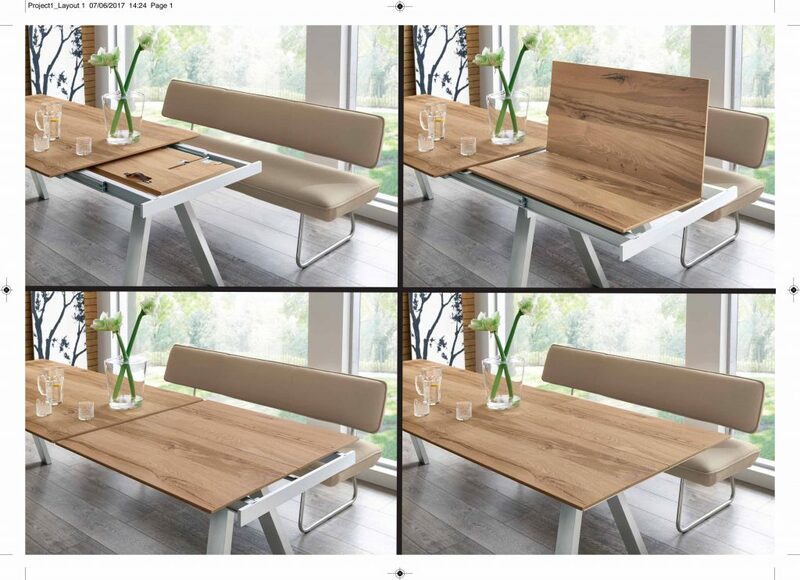 Please see our ranges below. 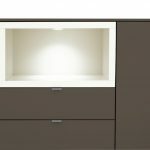 Every range has a huge selection of sizes and different options including colour. 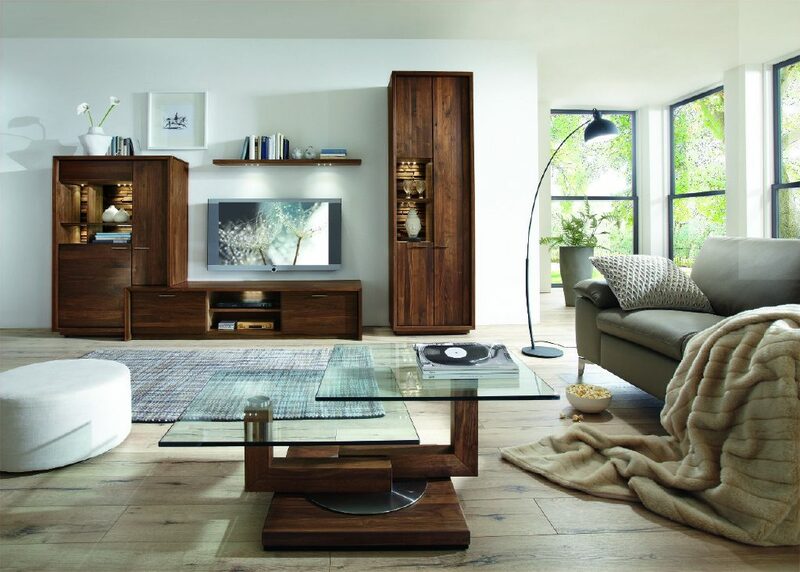 Please come and see us or telephone for a chat about any range you like. 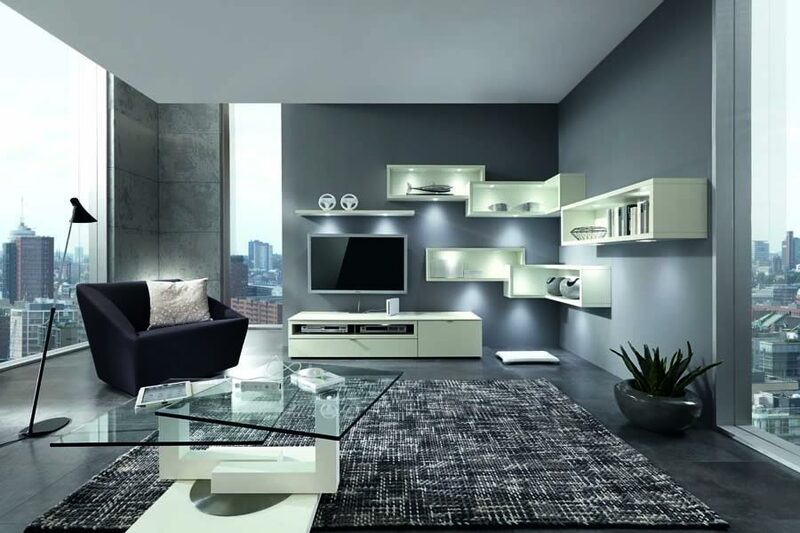 Call 01435 863921. 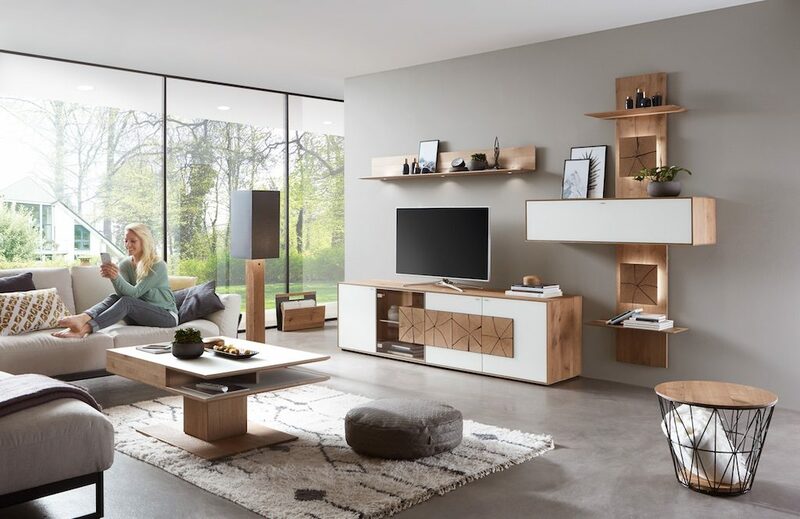 BRAND NEW RANGE by Hartmann of Germany. 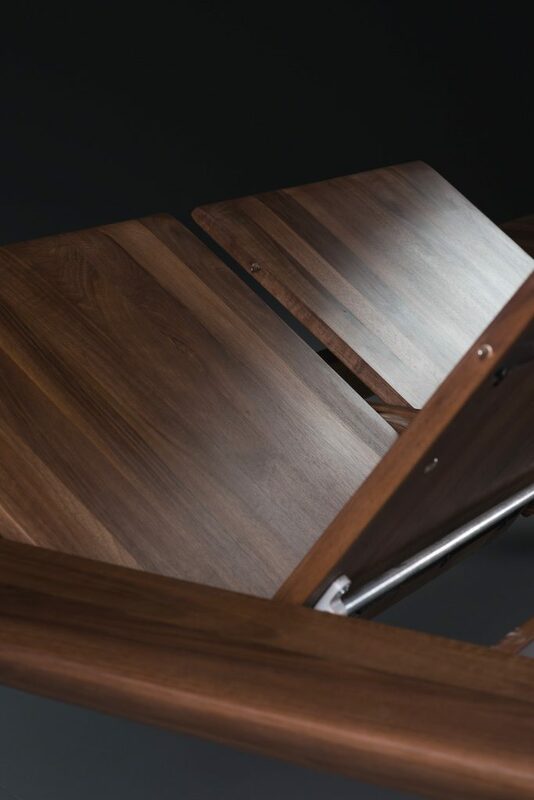 ARRIVING SOON. 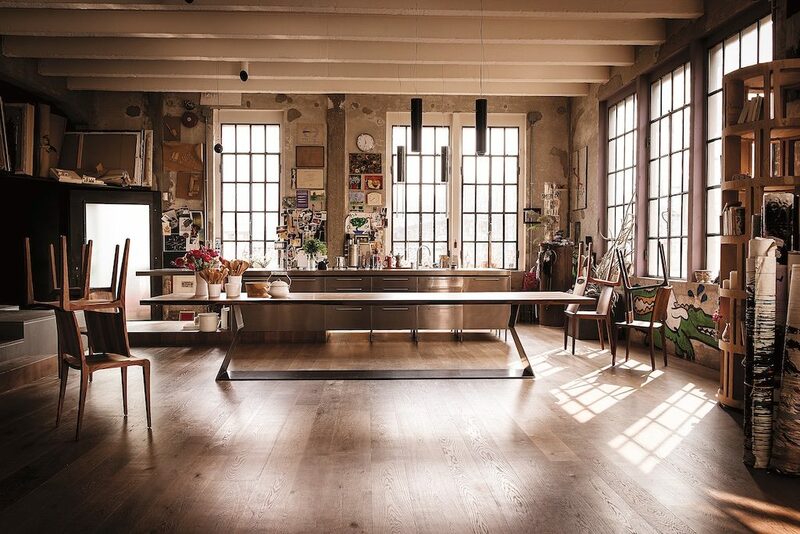 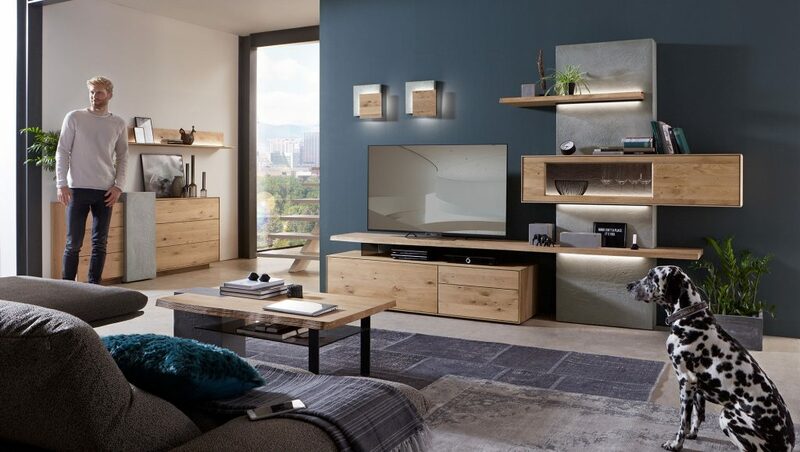 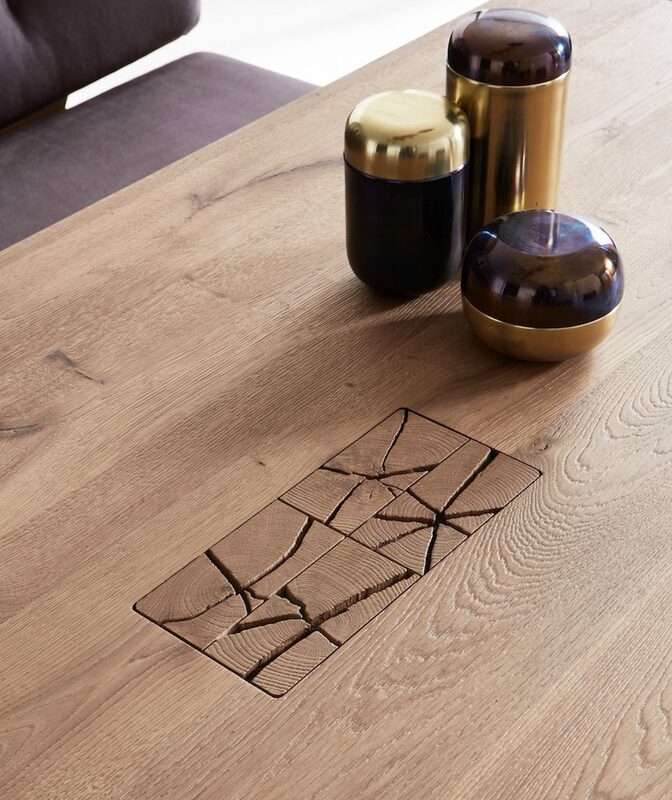 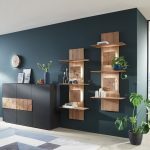 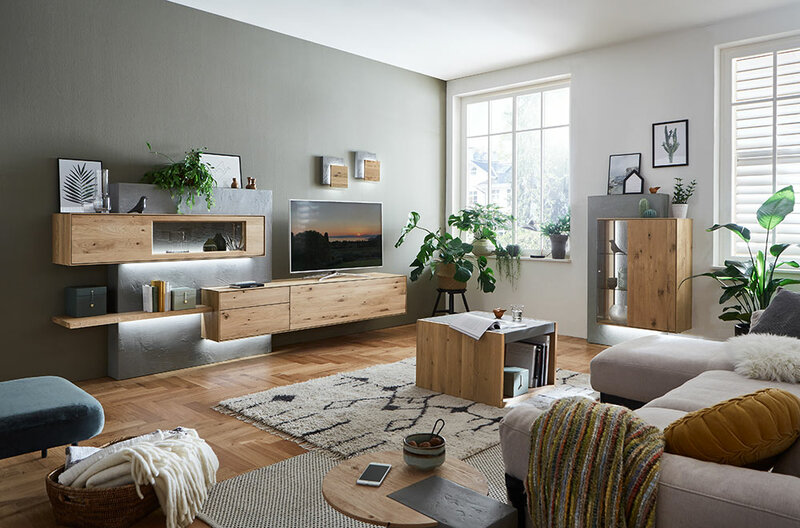 Brik is a mixture of oak and concrete finishes to give an extremely modern, cutting edge look. 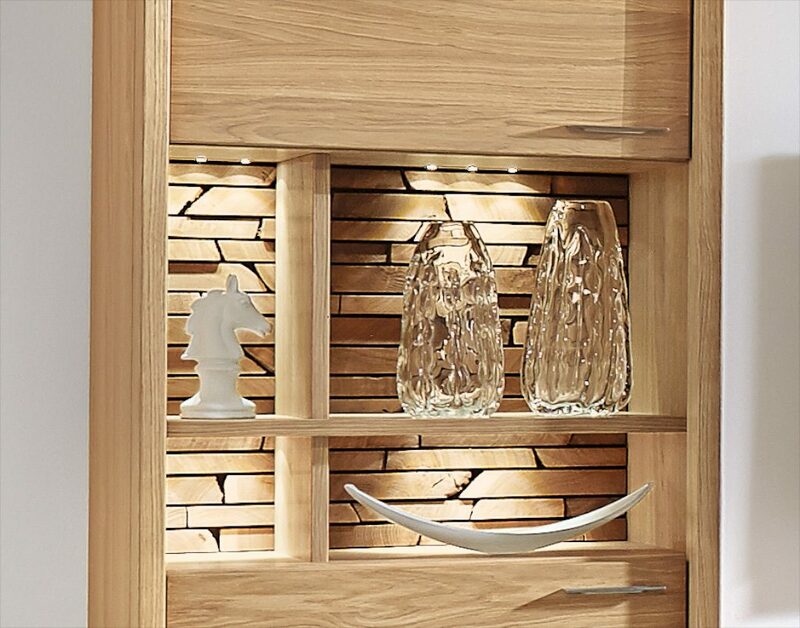 Only solid oak heartwood is used in this range to give the very figured and charachterful look. 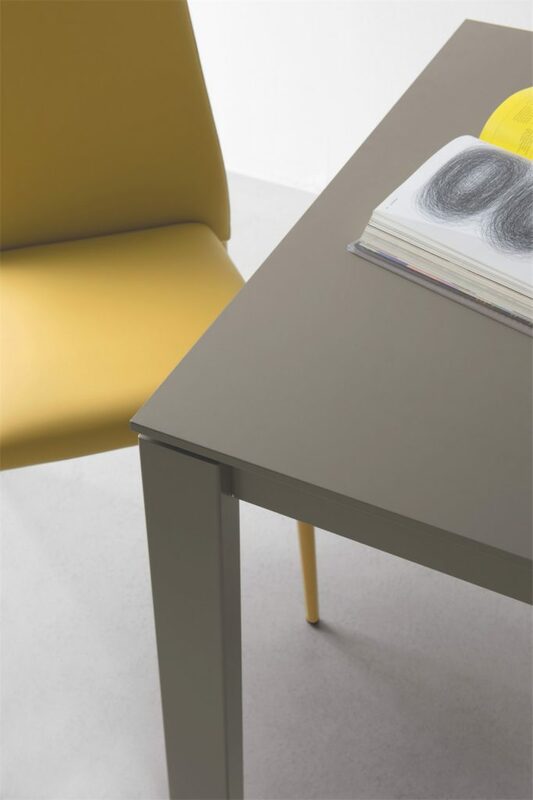 There are two colours, natural and tabaco. 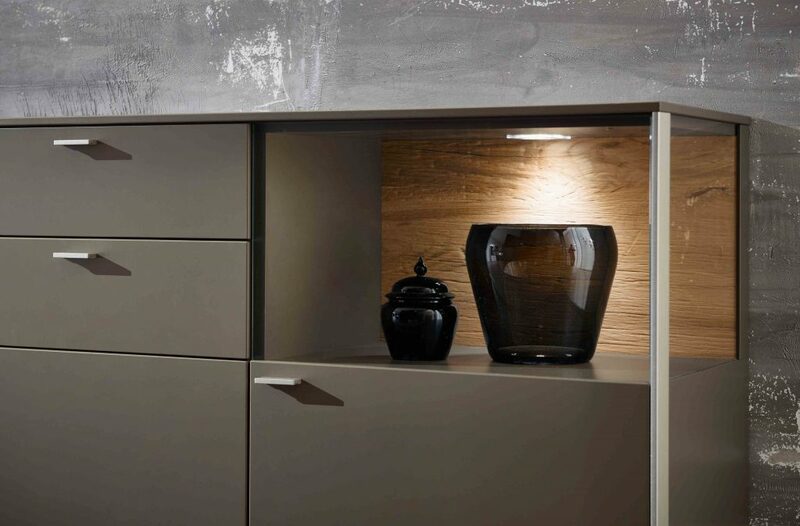 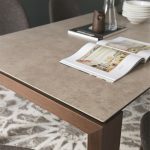 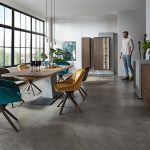 The concrete finish is built up in layers over a wood base and the result is a very tactile feel and authentic look. 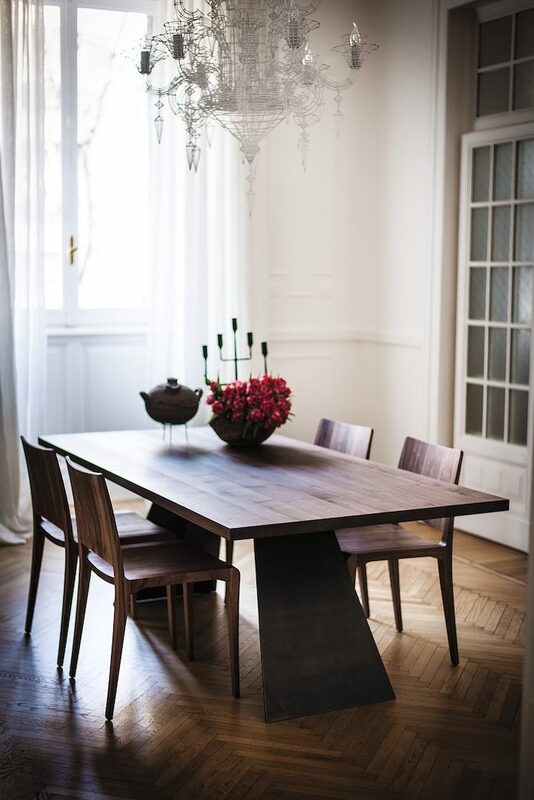 The off set base of the dining room table gives a cantilevered look. 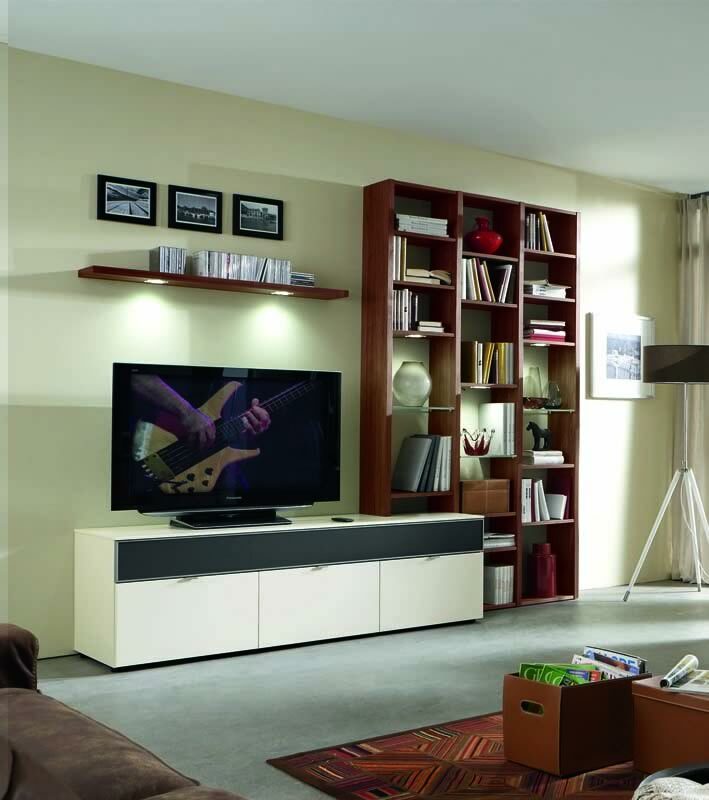 It comes in two sizes, 190cm and 240cm long x 95 wide. 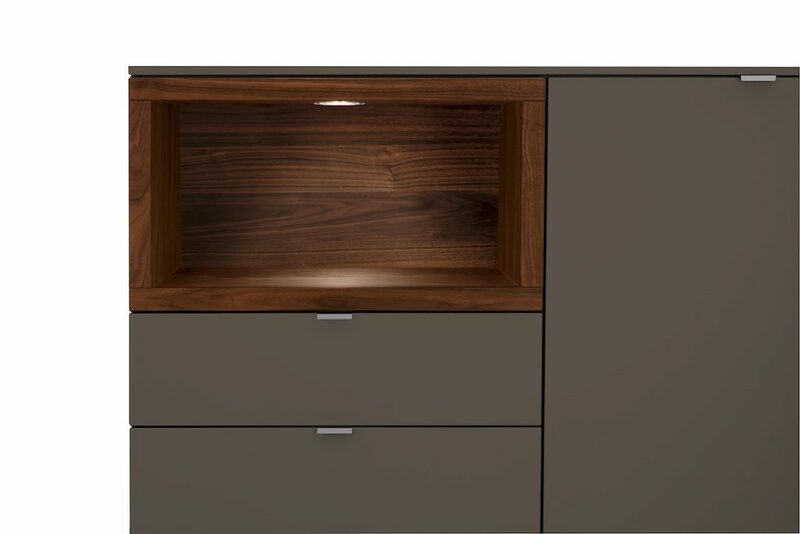 See the gallery to see some of the options, including cabinets for the lounge/TV area. 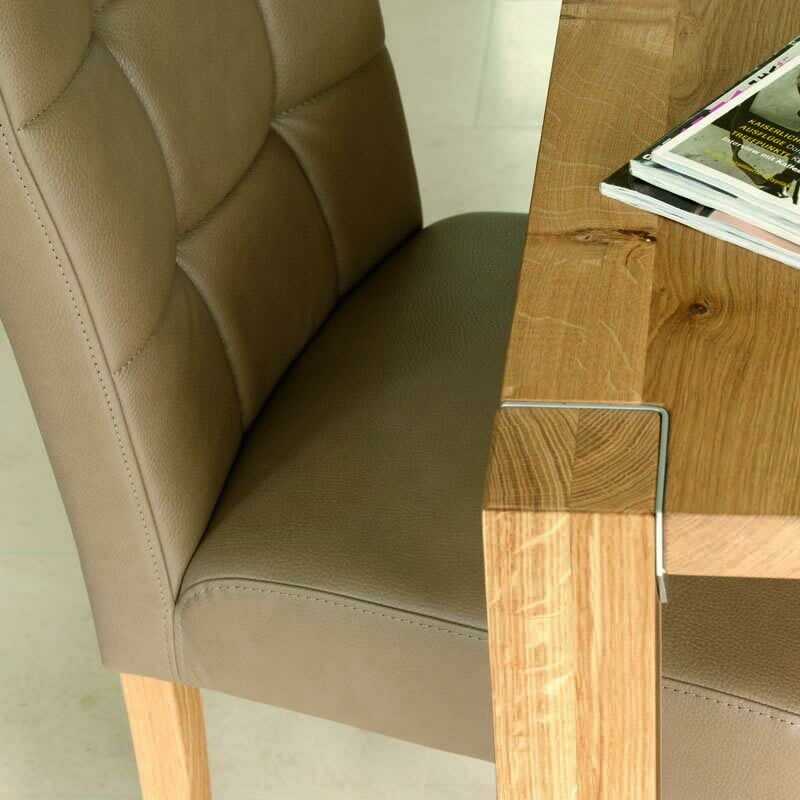 BAROLA is a superb blend of furniture design expertise and the finest craftsmanship. 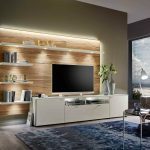 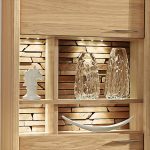 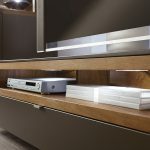 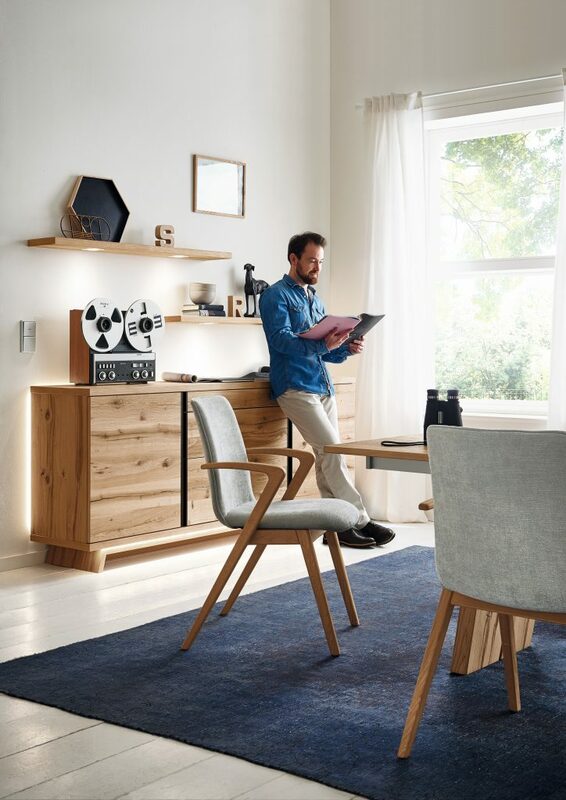 The elegantly formed wooden underframe is remarkable in itself: gently angled at the sides and set back slightly under the furniture, it creates an extraordinary feeling of lightness when combined with a concealed LED light strip. 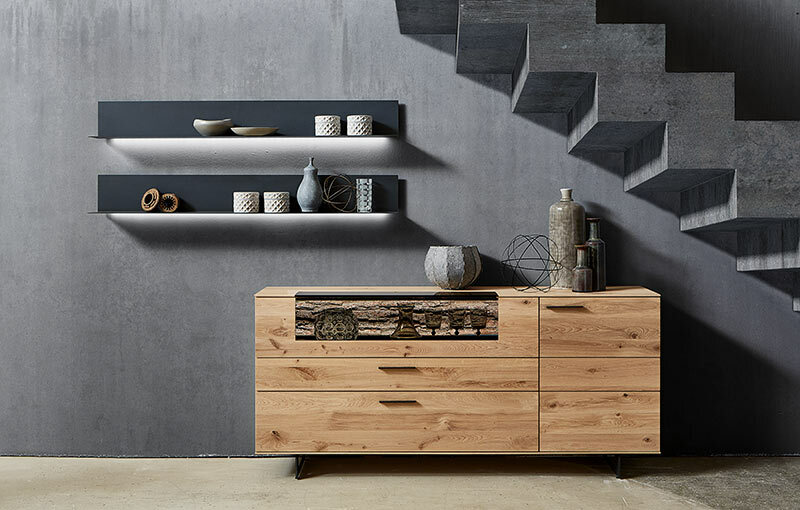 Barola uses an oak finish of immense character, very grainy and textured and with anthracite metal detailing. 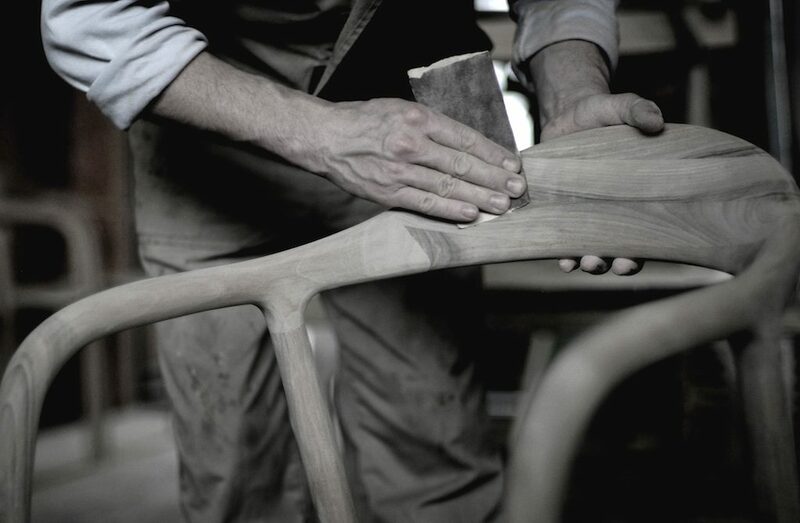 The craftsmanship: so authentic with such attention to detail. 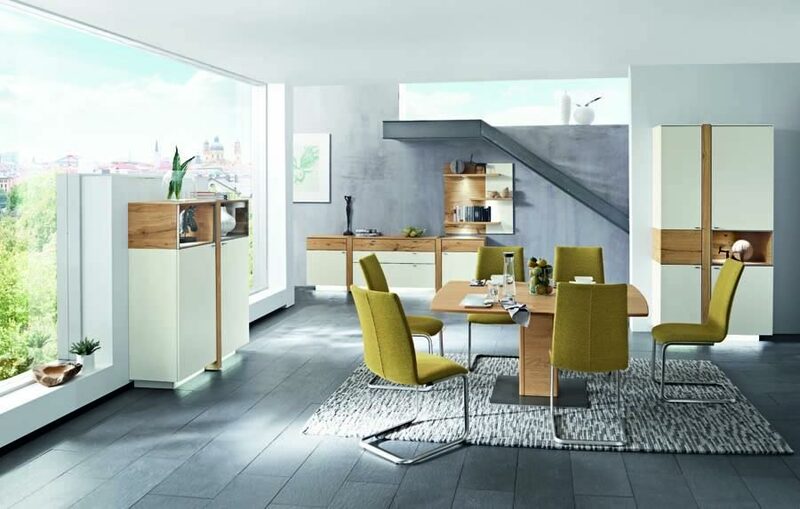 The options: so varied and individual. 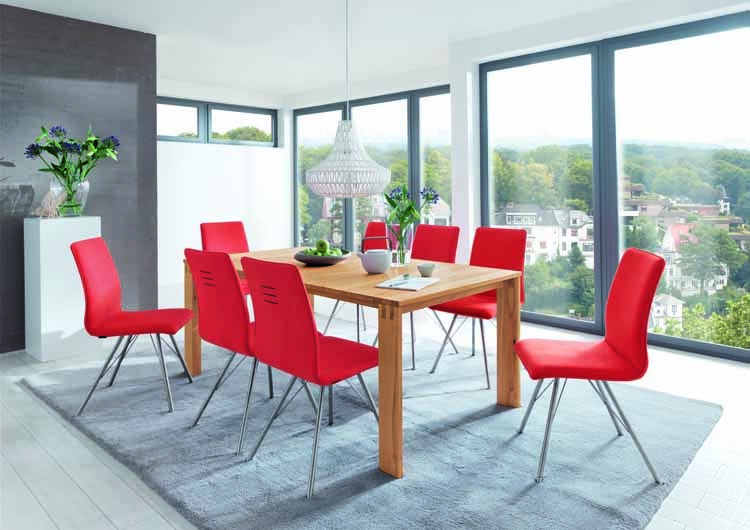 You can download the brochure here. 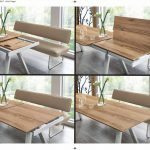 The brochure does not show every piece as the range is extensive. 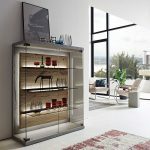 Please visit us to see the whole range. 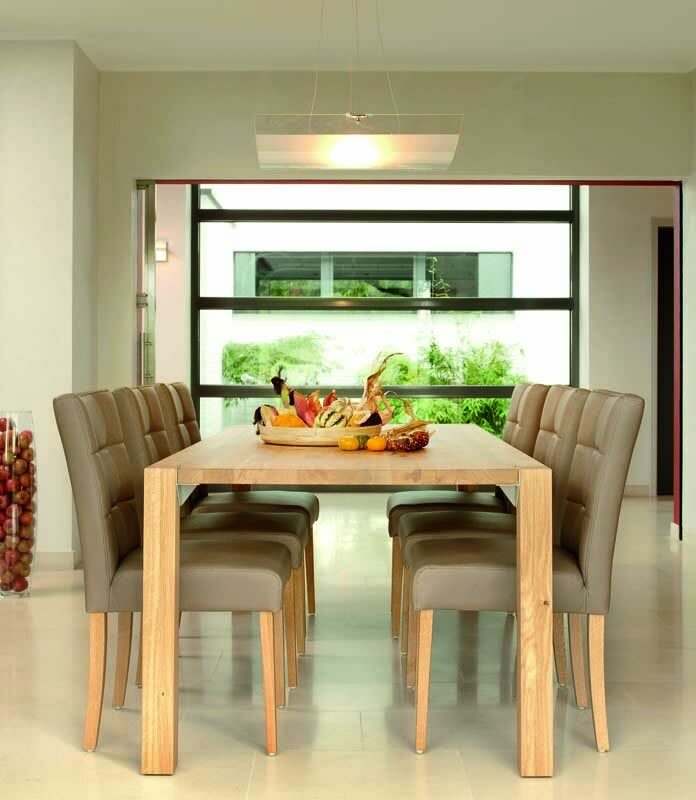 Bring some measurements and we will be pleased to advise on design schemes. 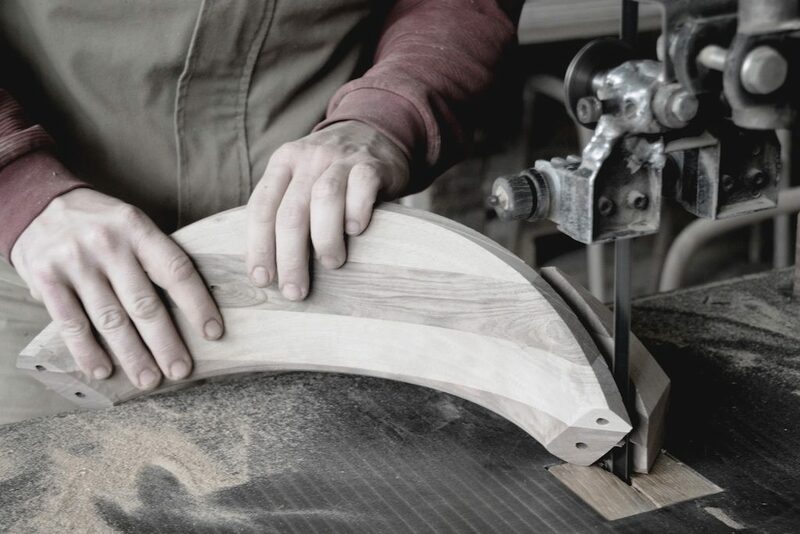 VENJAKOB was founded in 1935, by a master carpenter: Alfons Venjakob. 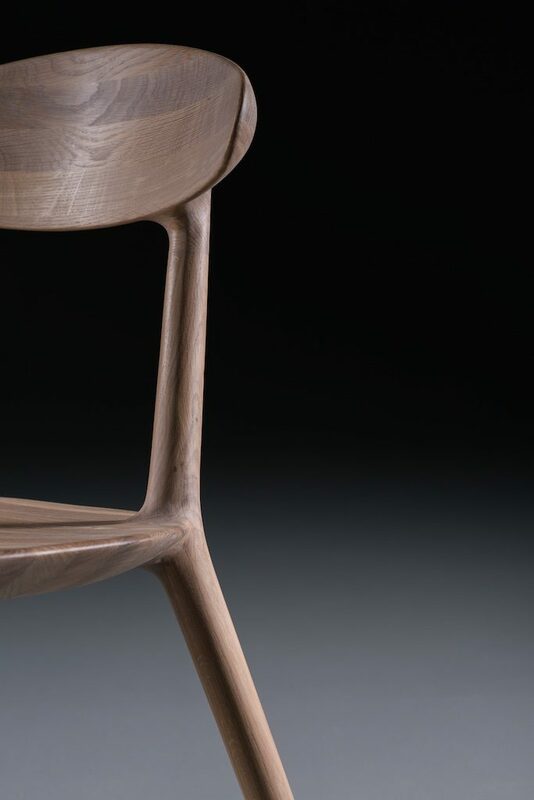 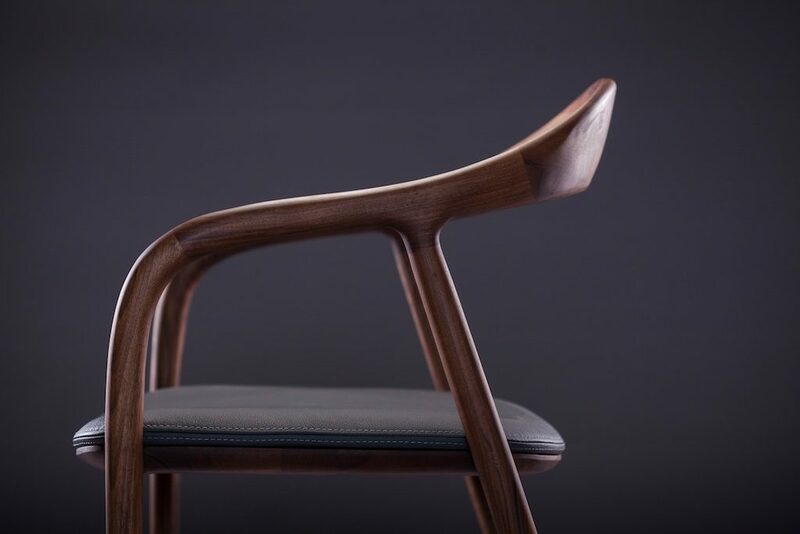 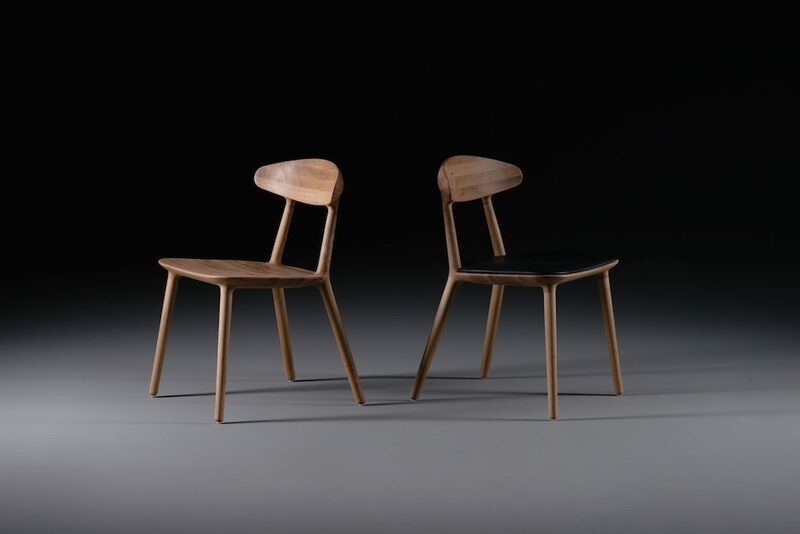 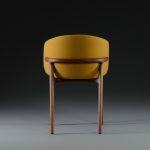 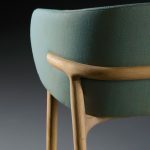 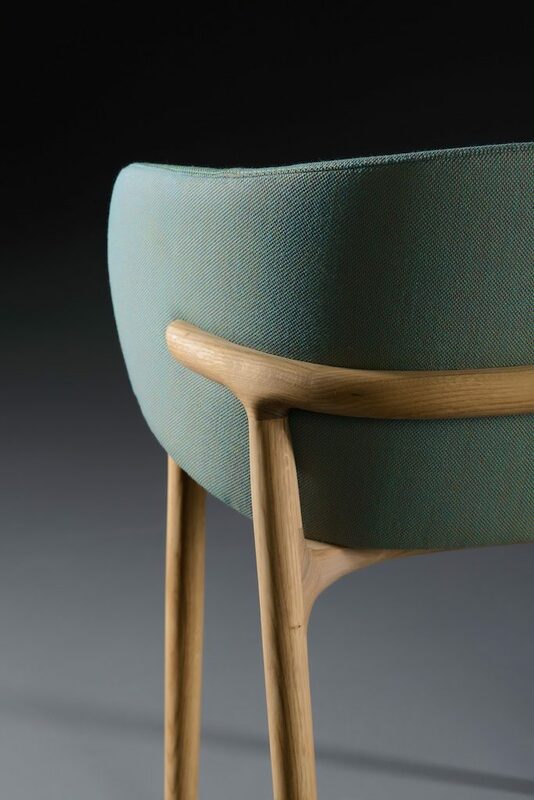 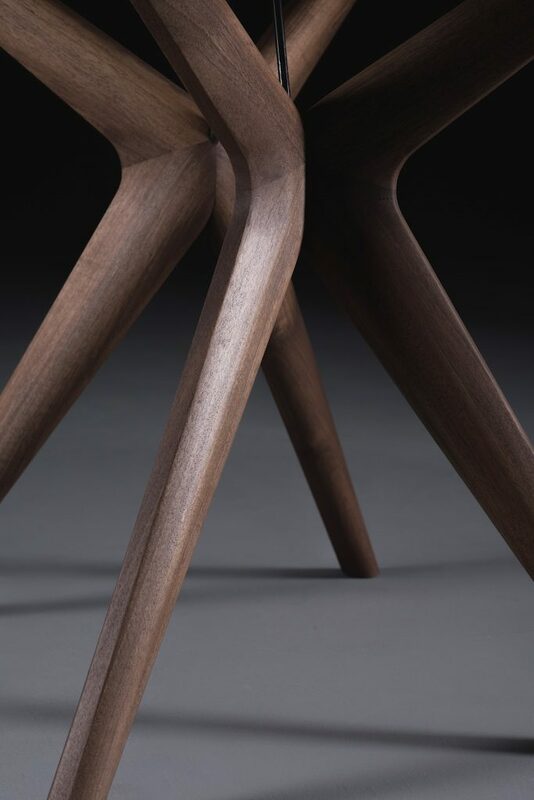 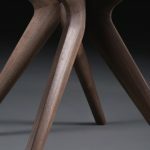 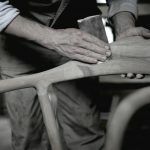 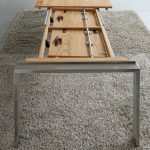 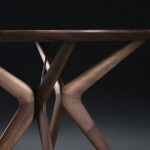 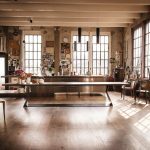 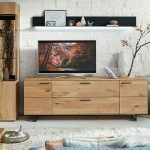 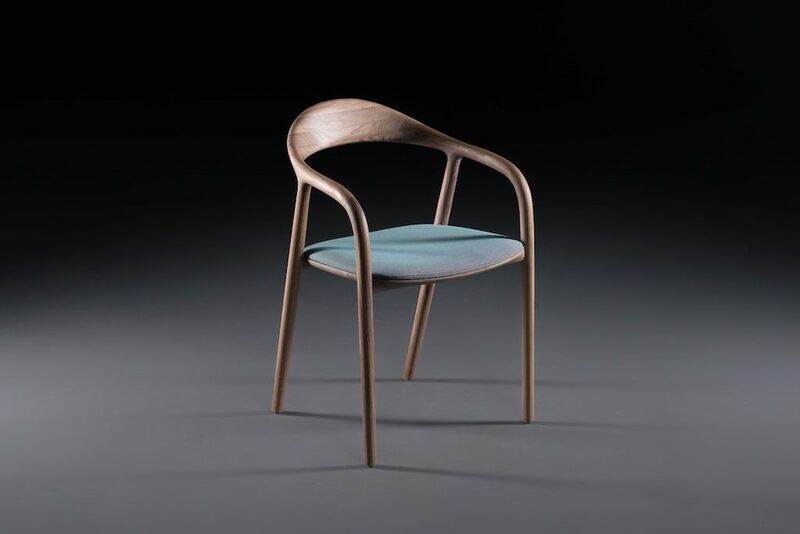 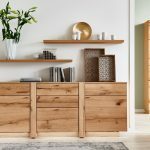 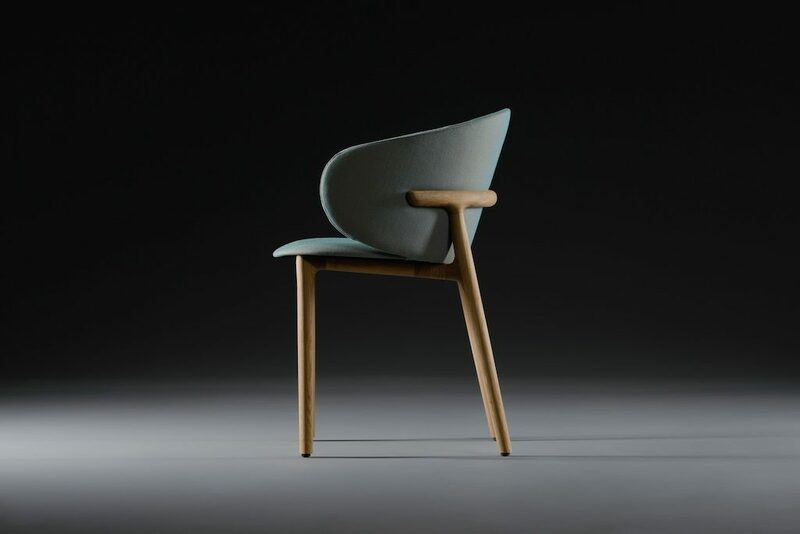 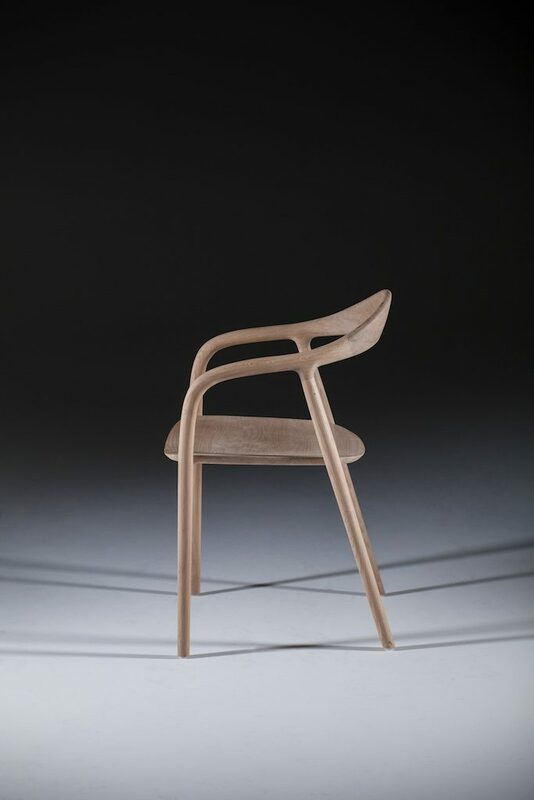 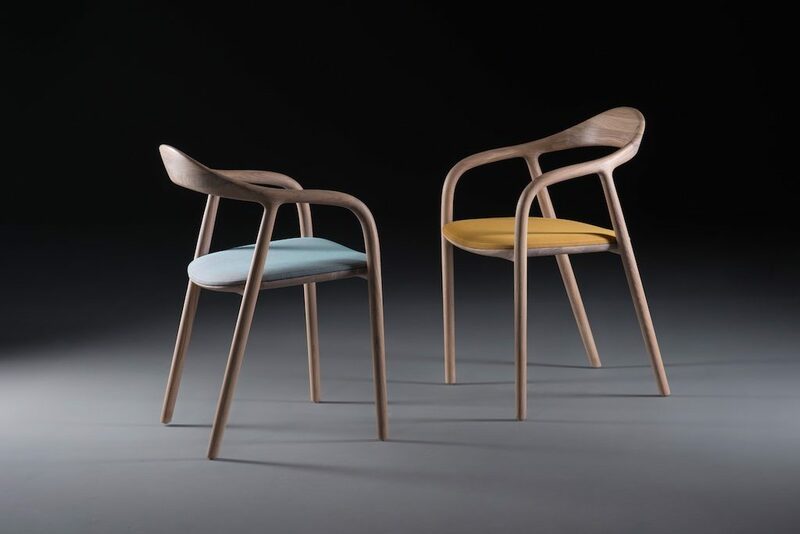 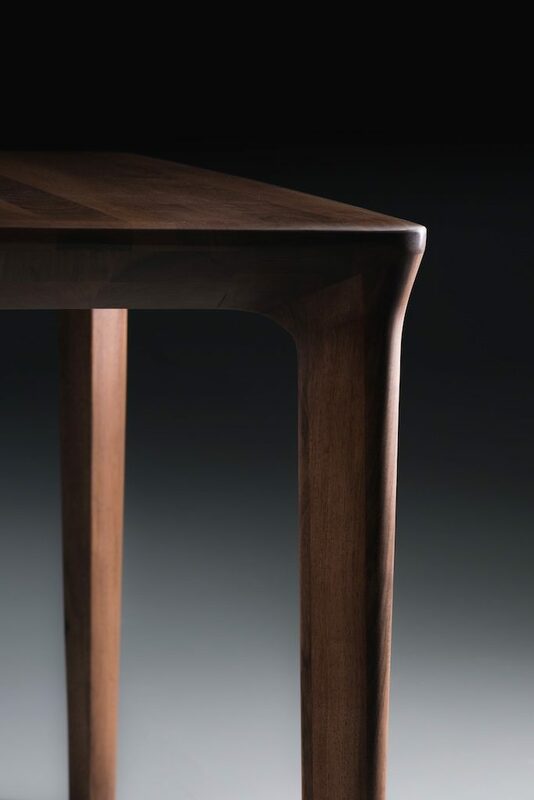 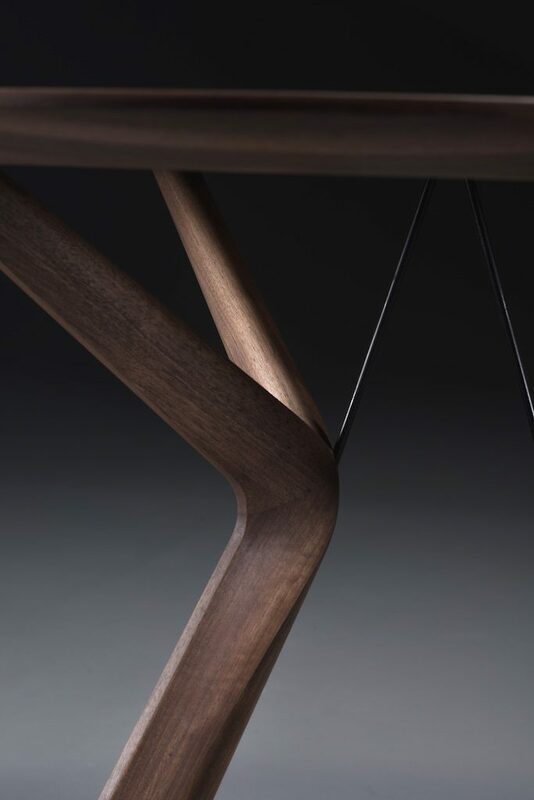 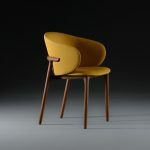 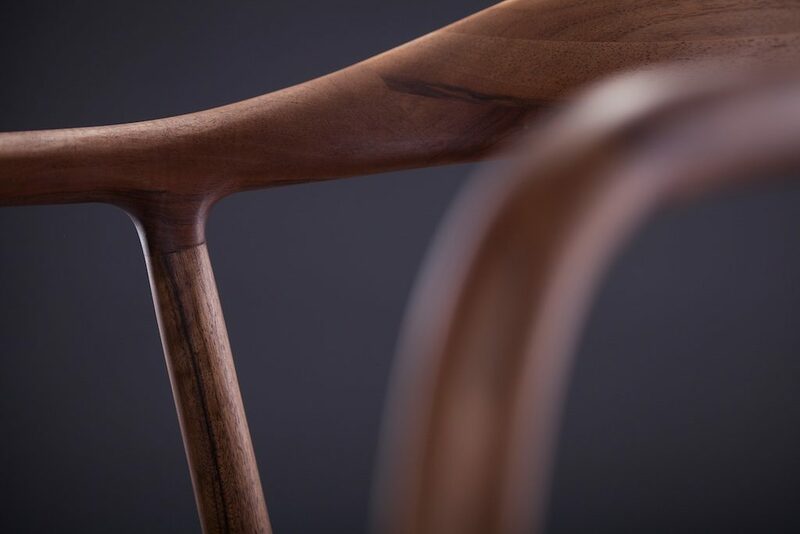 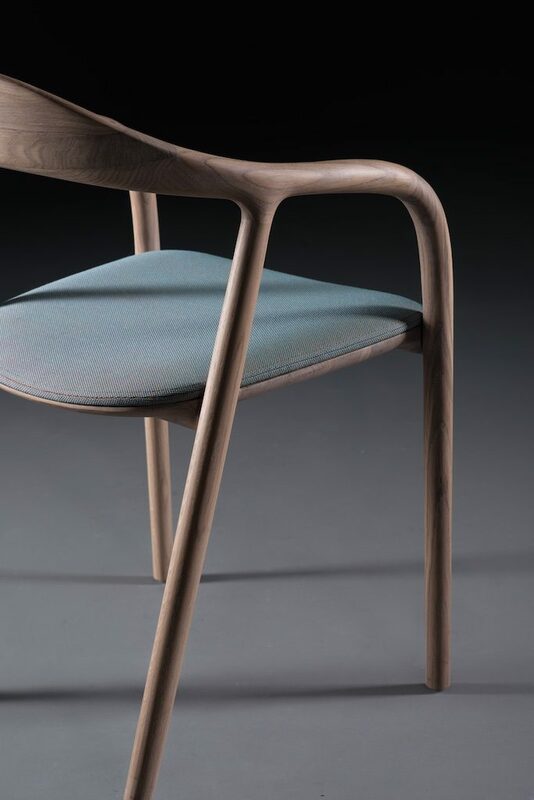 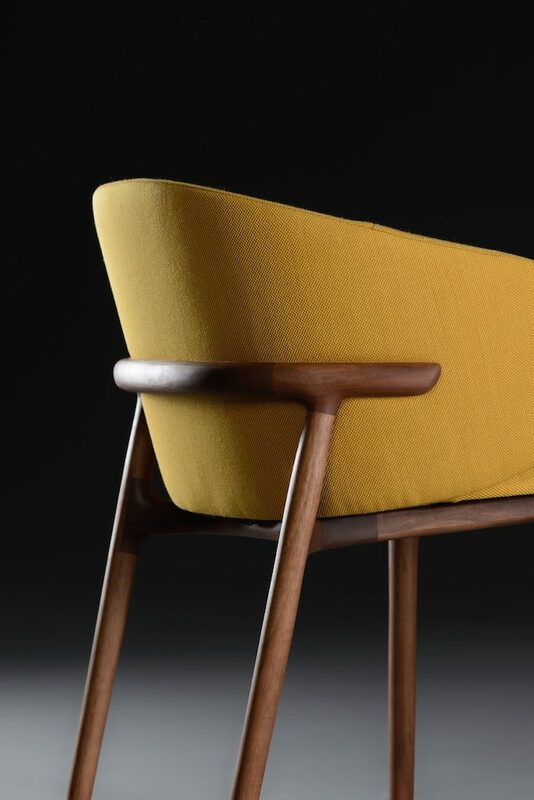 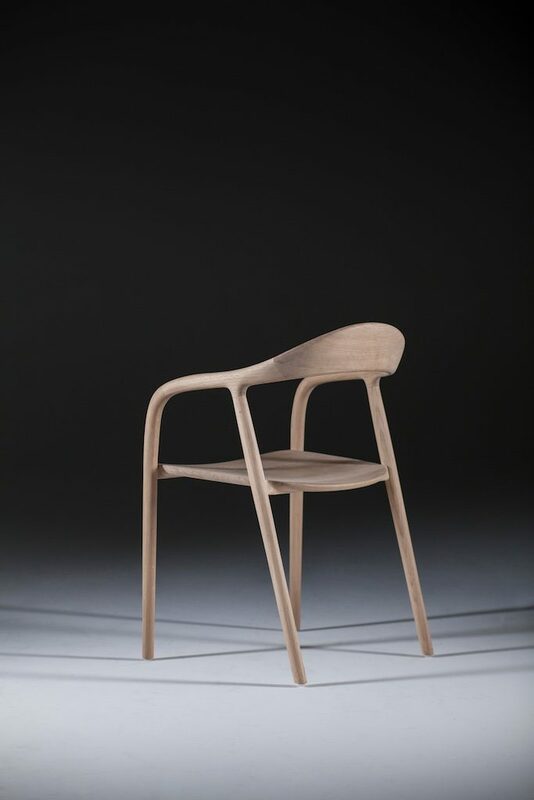 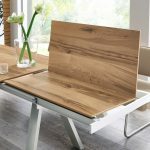 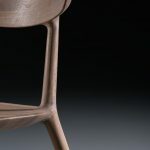 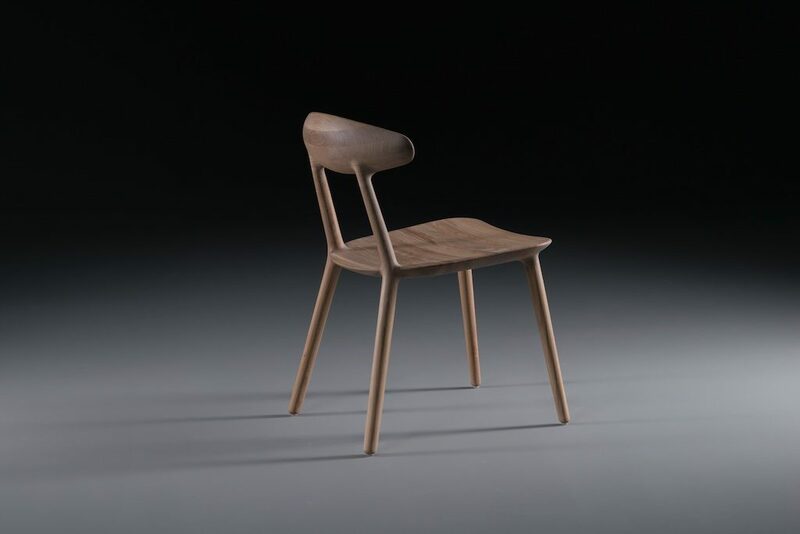 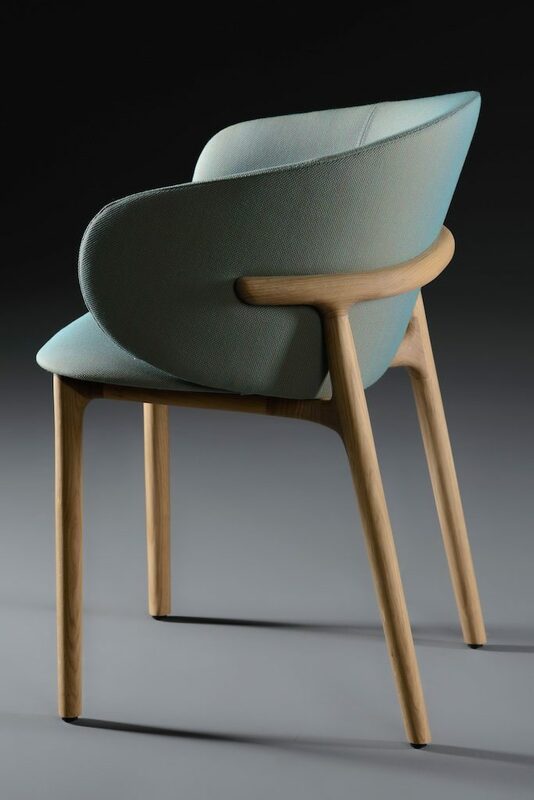 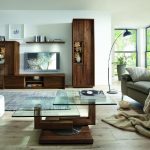 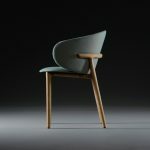 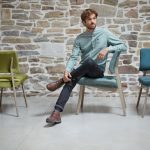 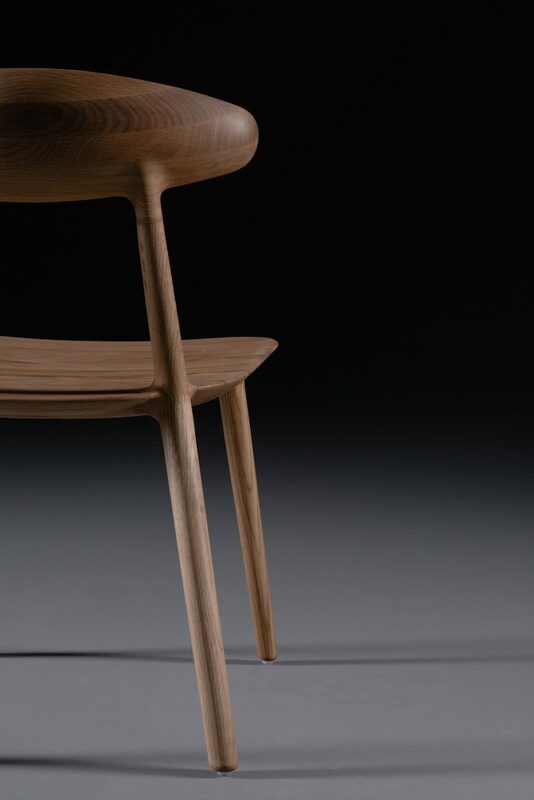 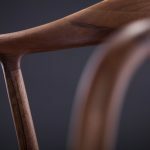 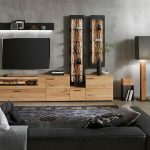 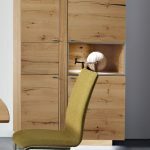 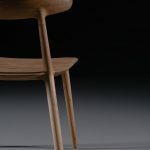 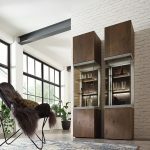 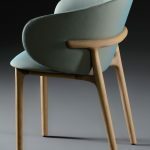 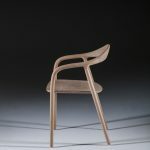 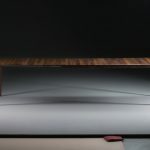 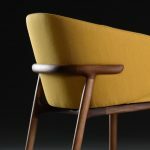 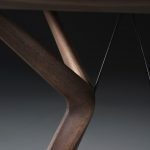 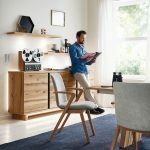 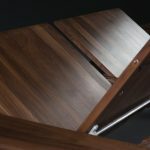 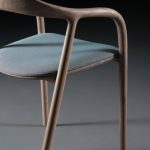 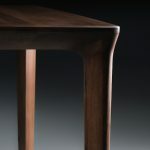 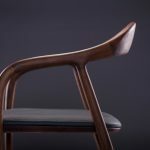 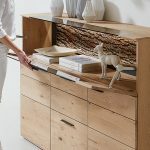 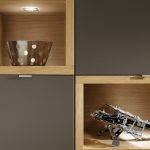 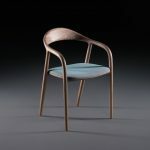 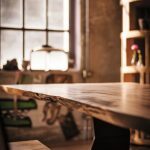 Genuine craftsmanship remains the basis for their furniture with the help of precision modern industrial manufacturing techniques. 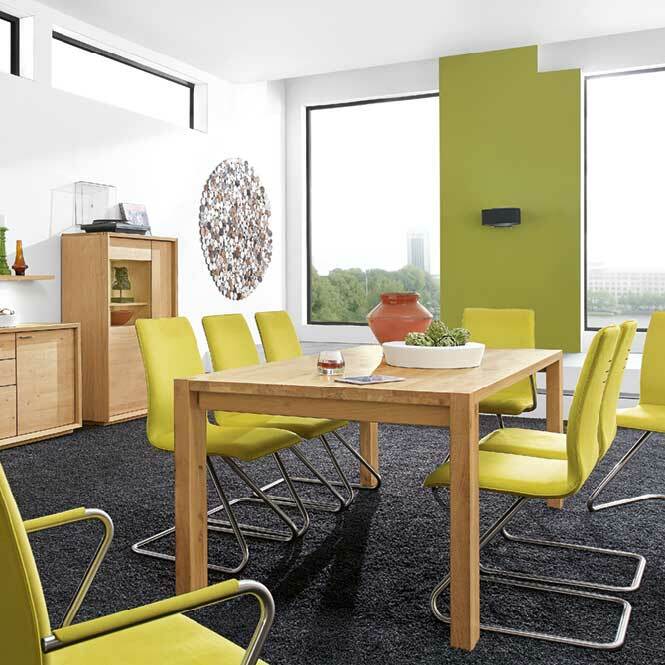 Venjakob furniture will retain its aesthetic appeal for years and is highly distinctive. 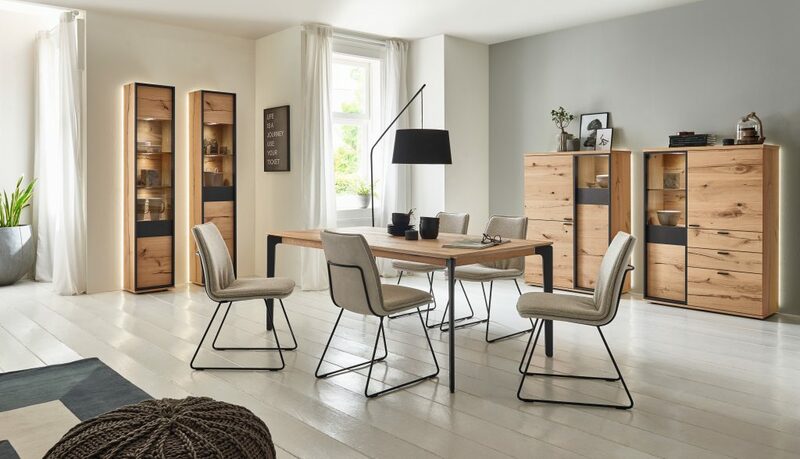 Venjakob continues to be made entirely in their German factory. 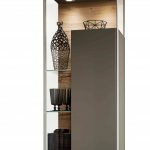 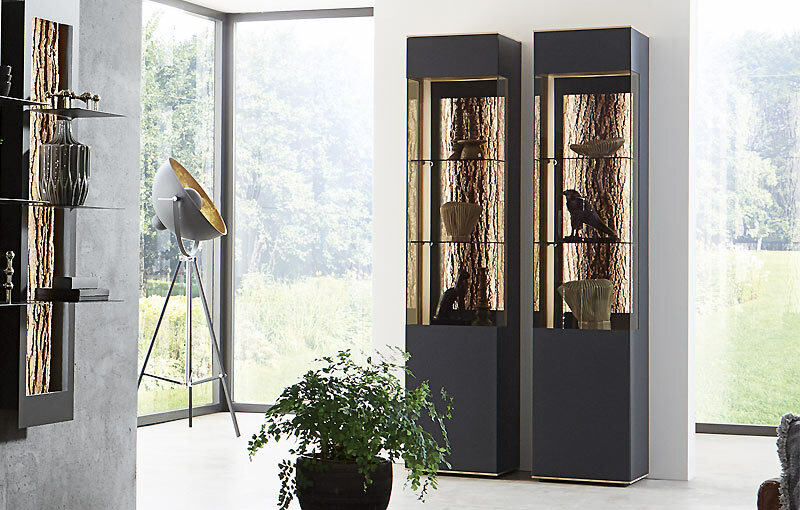 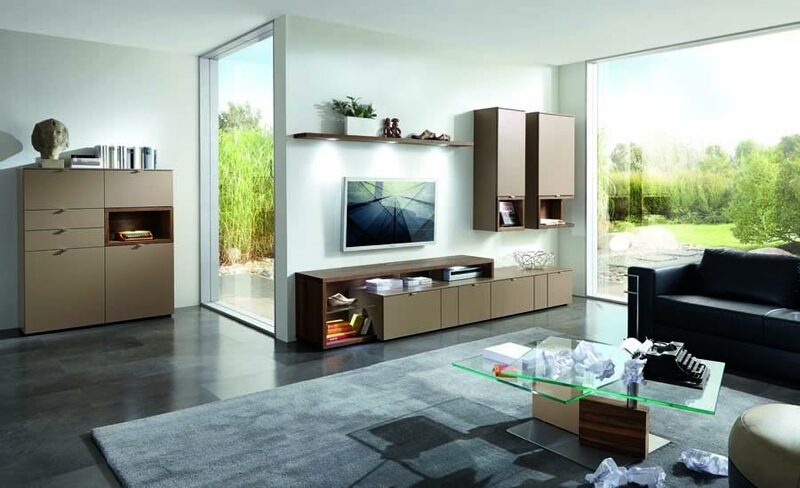 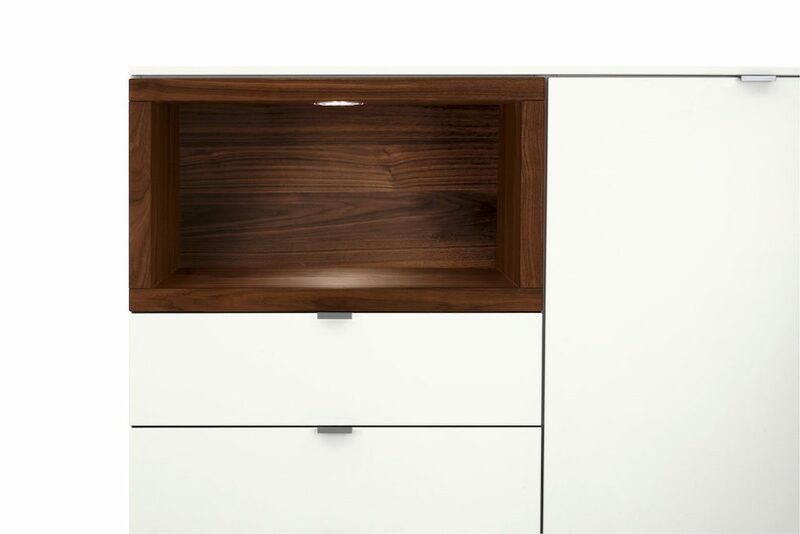 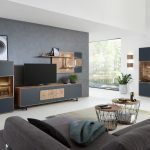 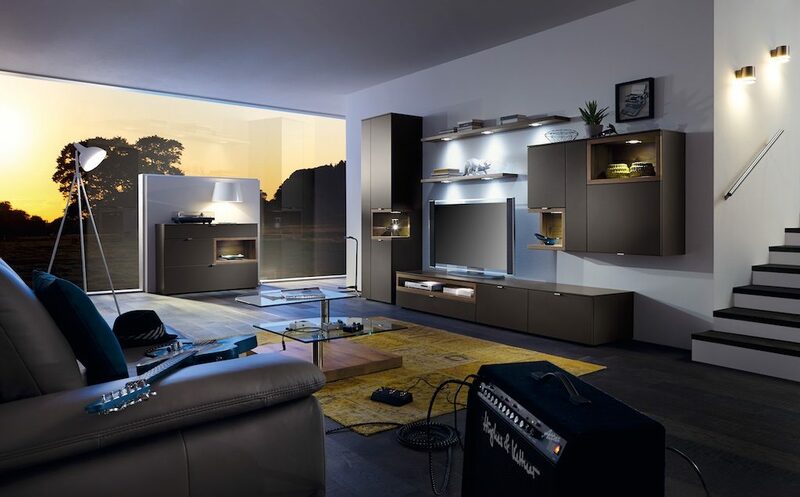 BRAND NEW CABINET RANGE by Hartmann of Germany. 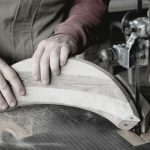 The unique feathure of Runa is the natural bark backing used in many of the pieces. 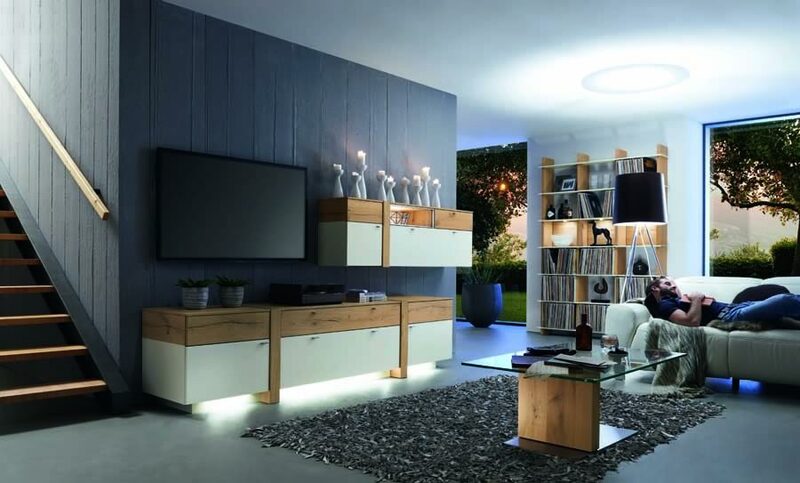 When lit with the internal lighting, the effect is unique and stunning. Only solid oak heartwood is used in this range to give the very figured and charachterful look. 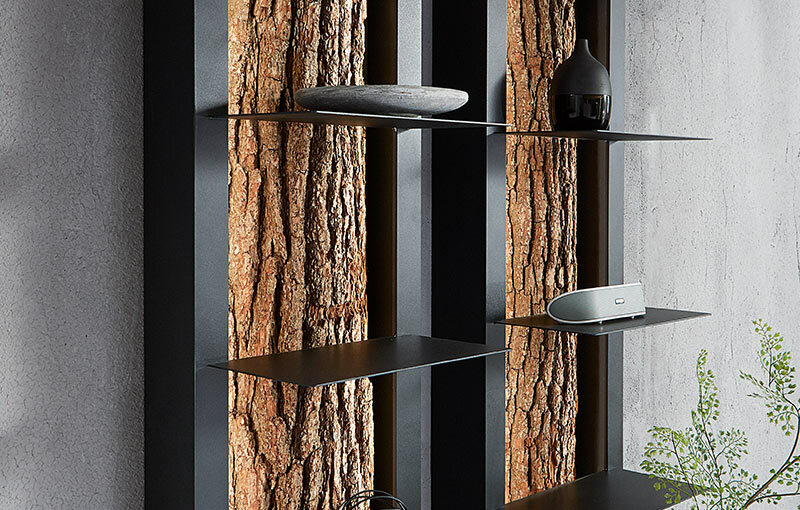 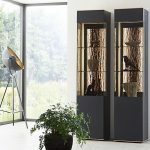 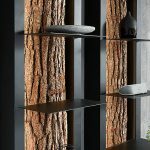 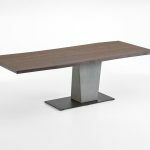 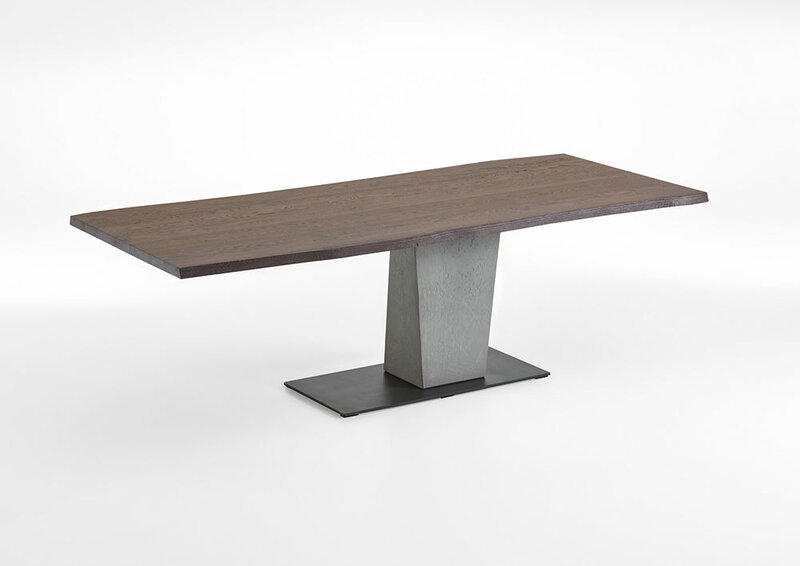 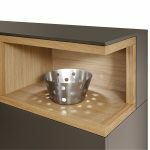 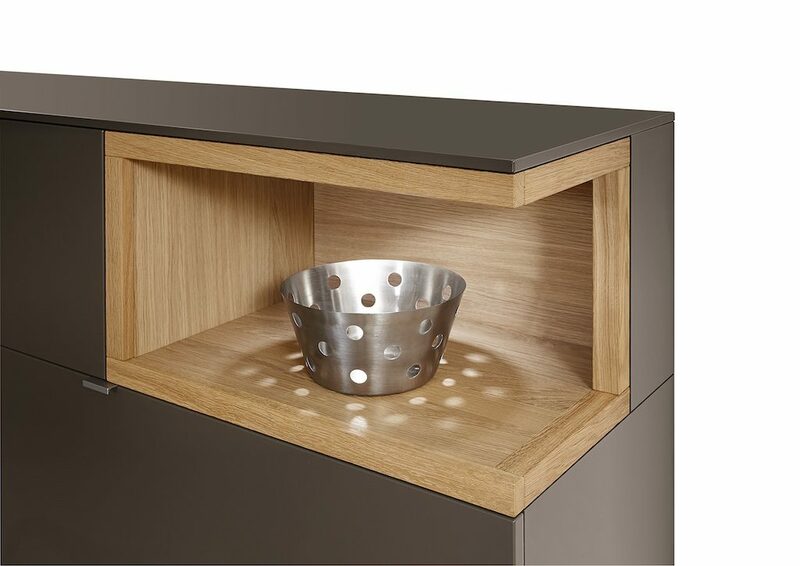 The beautiful natural oak and the bark are combined with anthracite metal in some of the pieces. 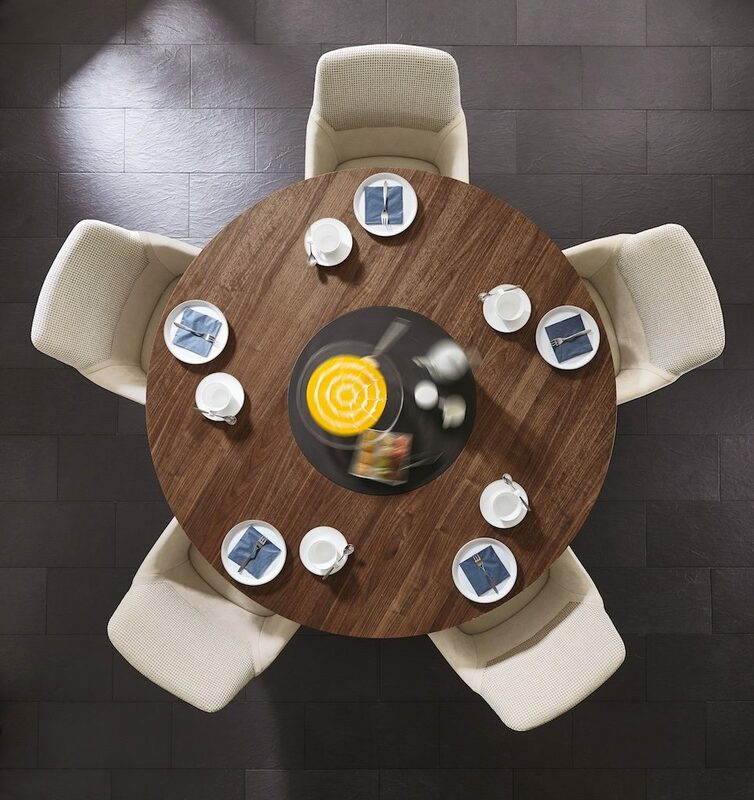 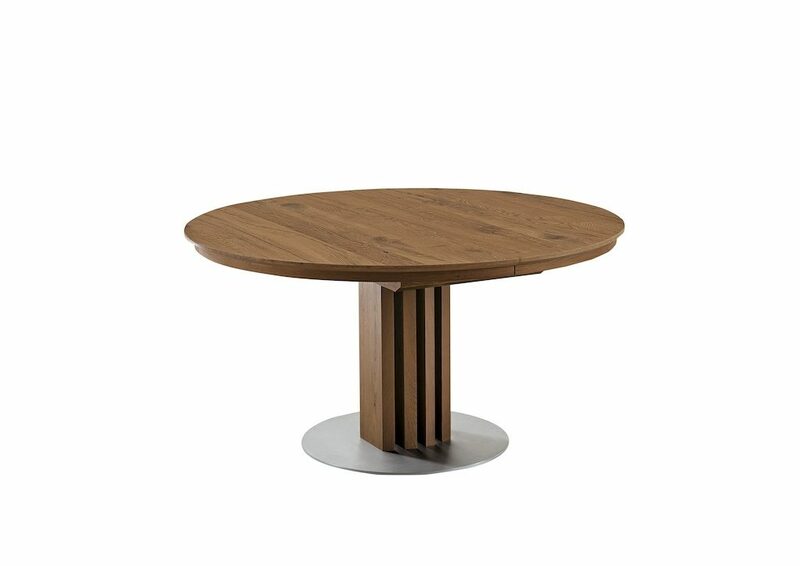 A stunning round table by Venjakob available with optional central turntable. 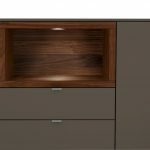 See gallery for more pictures. 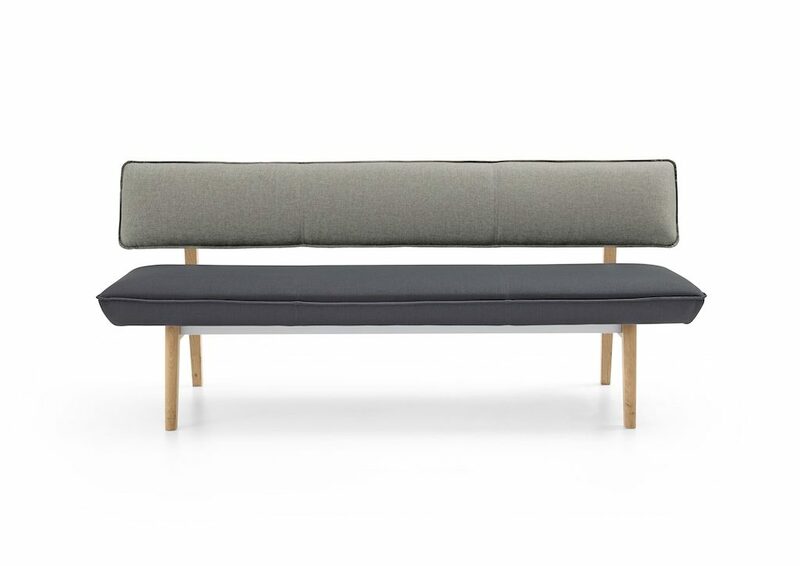 The 150 size can seat 6 people. 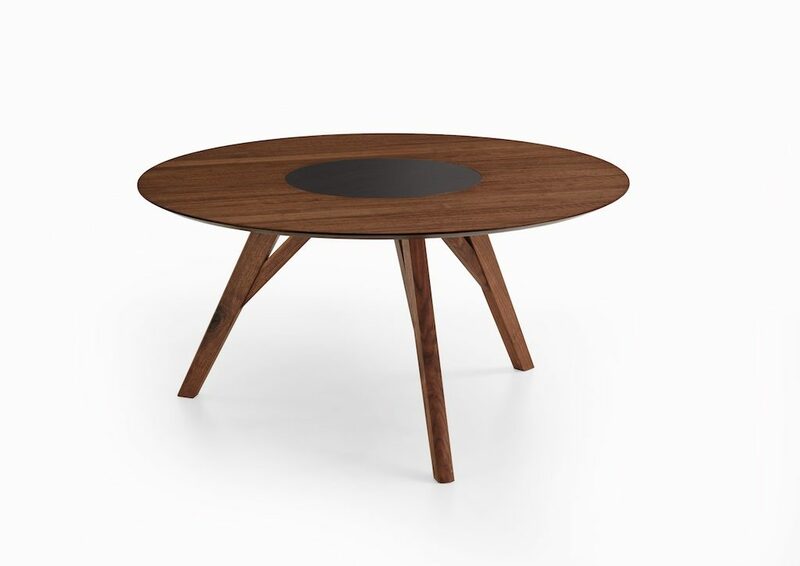 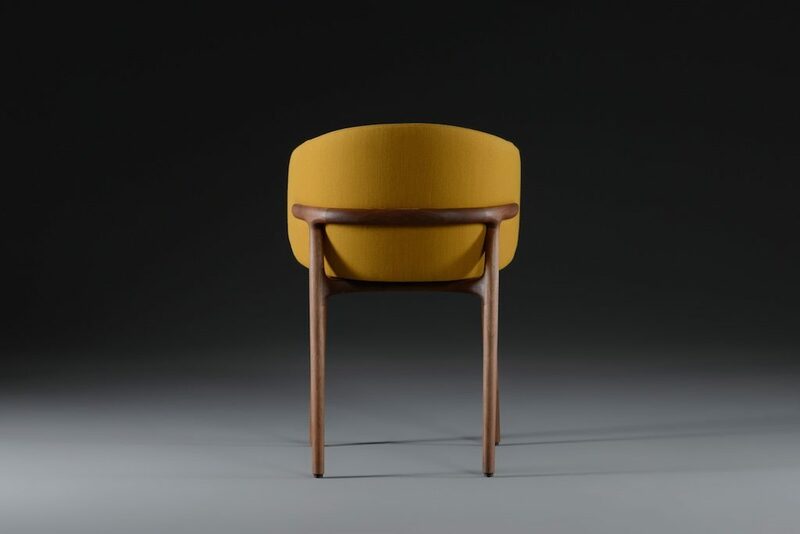 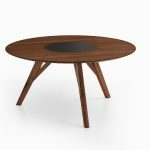 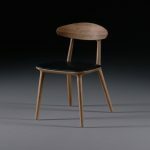 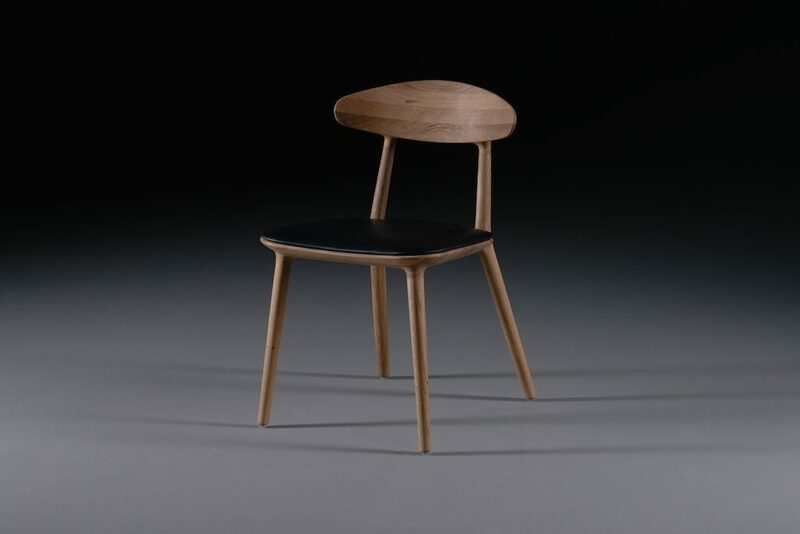 Available with walnut or oak base and with walnut, oak or ceramic tops. 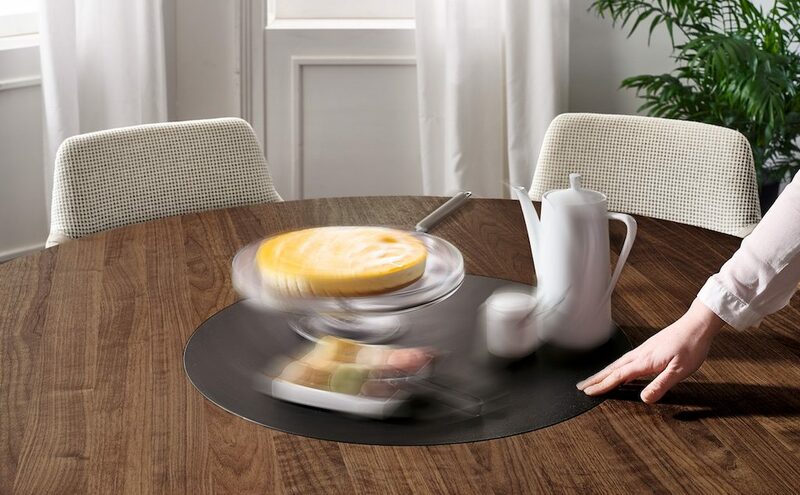 The central turntable is optional. 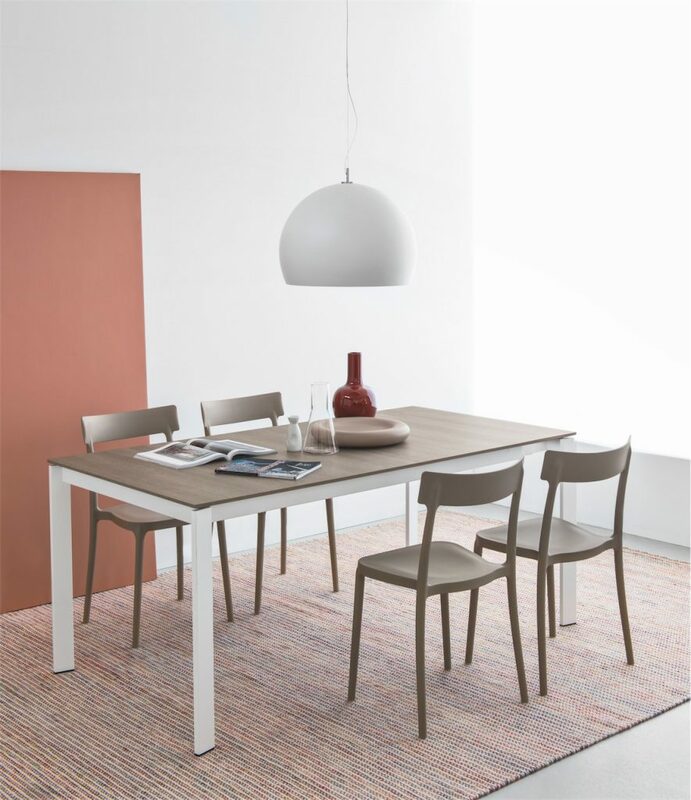 We are showing a 150cm table with an oak base and the carrera ceramic top which is light in colour as shown in the main picture. 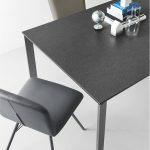 The other colour ceramic available is a dark grey. 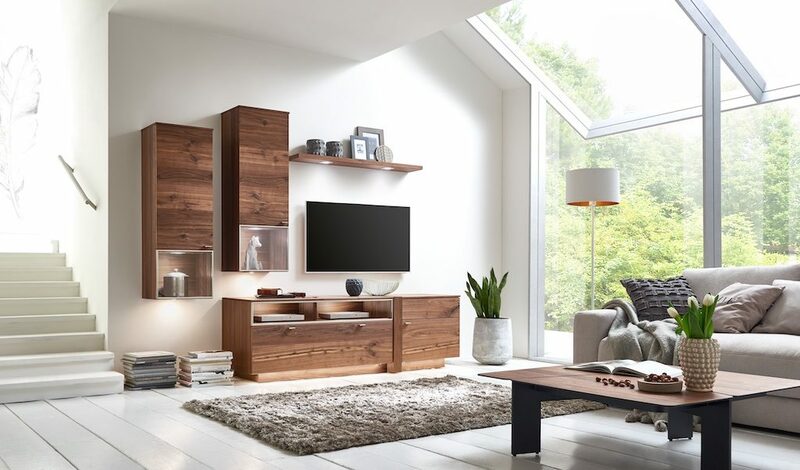 BRAND NEW RANGE by Hartmann of Germany. 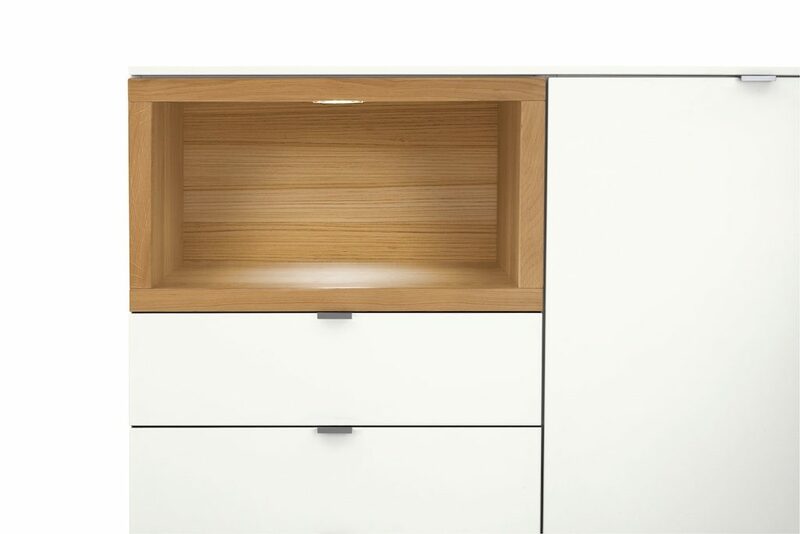 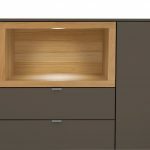 Caya cabinets mix rustic oak with glass. 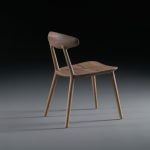 It is the latest thing from the European design exhibitions. 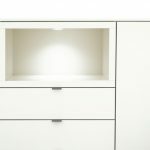 The glass can be white or grey. 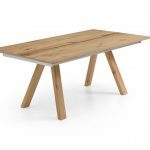 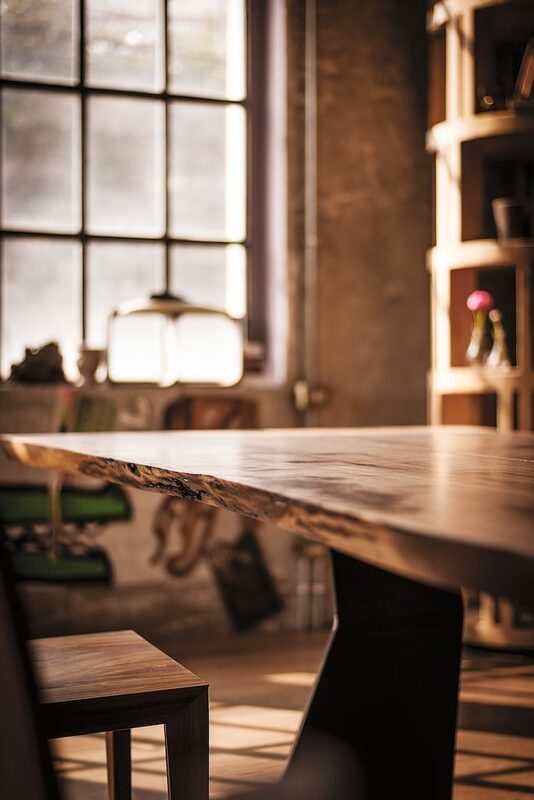 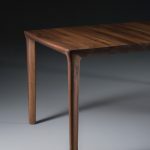 The dining table is a solid top with very rustic grain and a solid end grain detail in the middle. 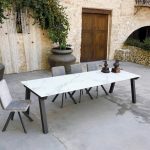 It comes in two sizes, 190cm and 240cm long x 95 wide. 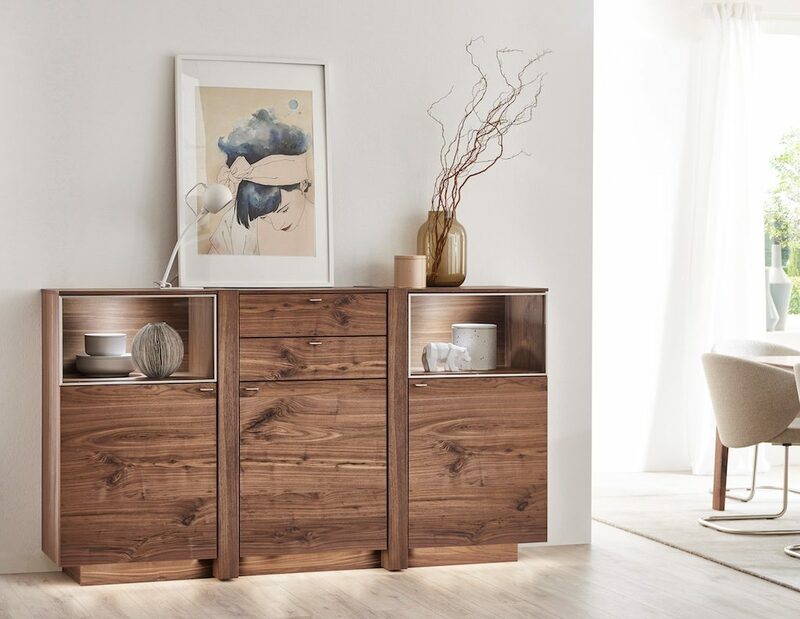 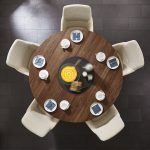 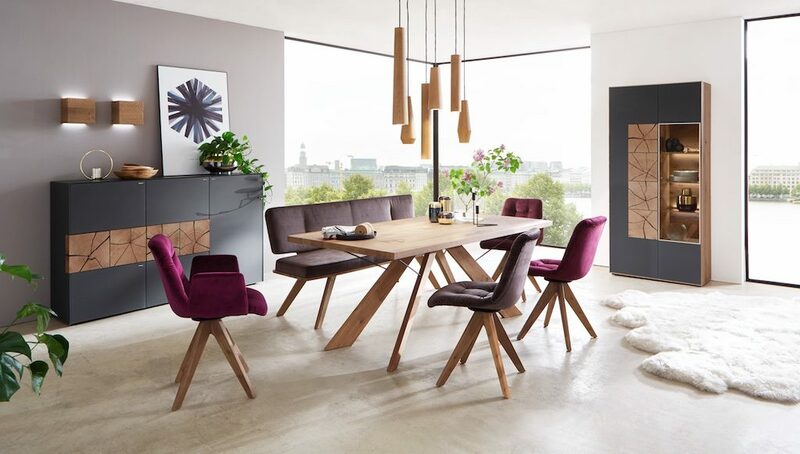 ALBERO brings the finesses of modern furniture design into the living- and dining room. 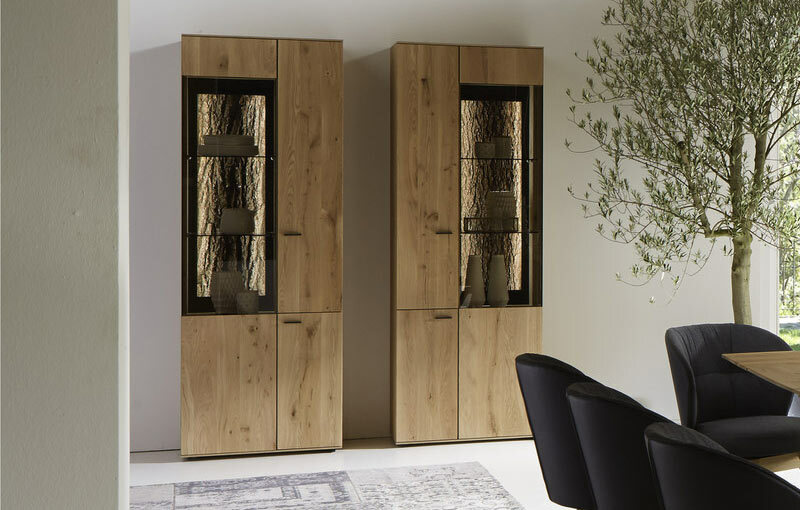 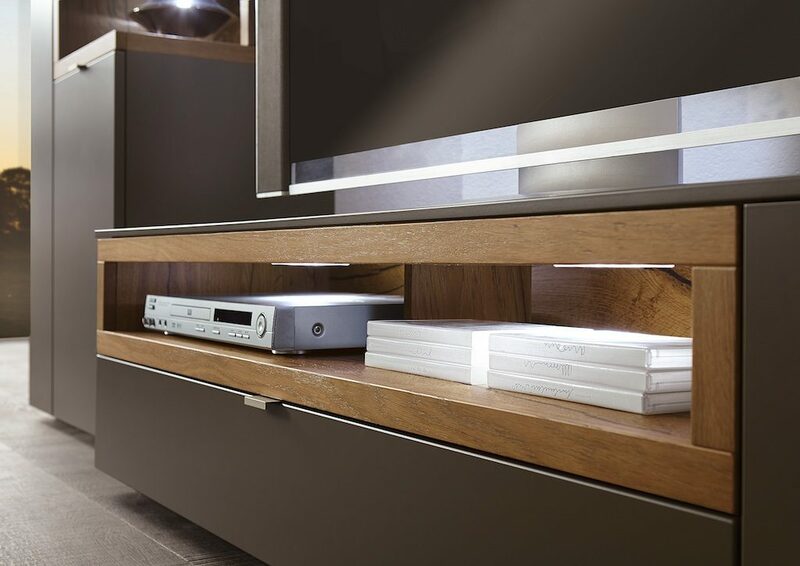 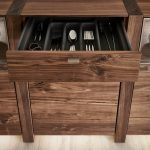 The horizontal fronts of the range are accompanied elegantly by vertical wooden elements – the base plinth is slightly inset under the carcase. 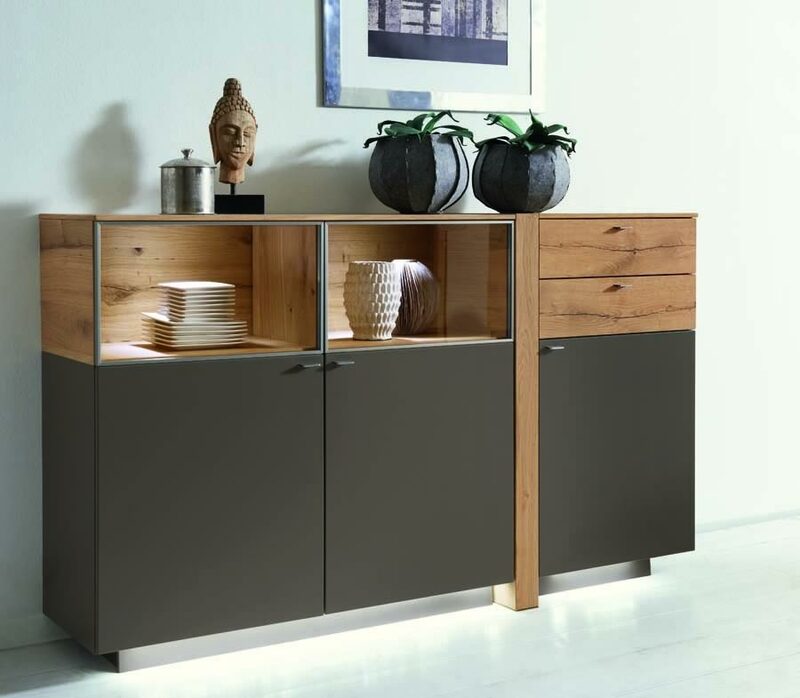 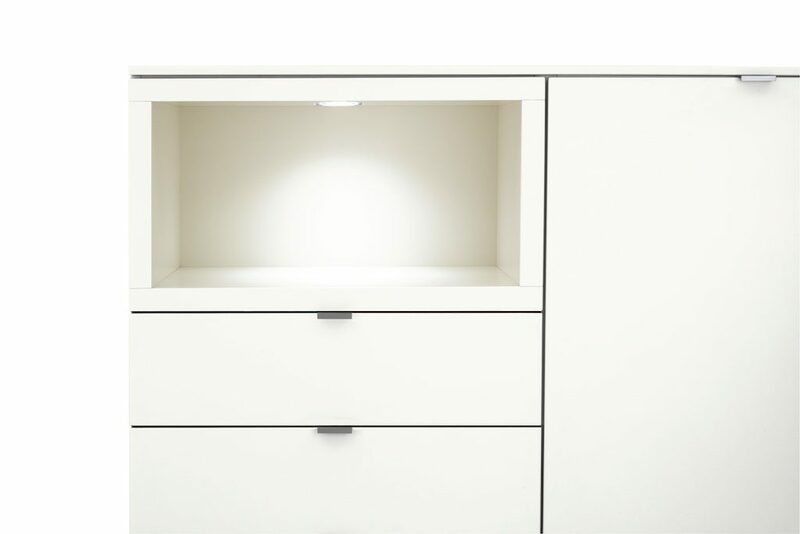 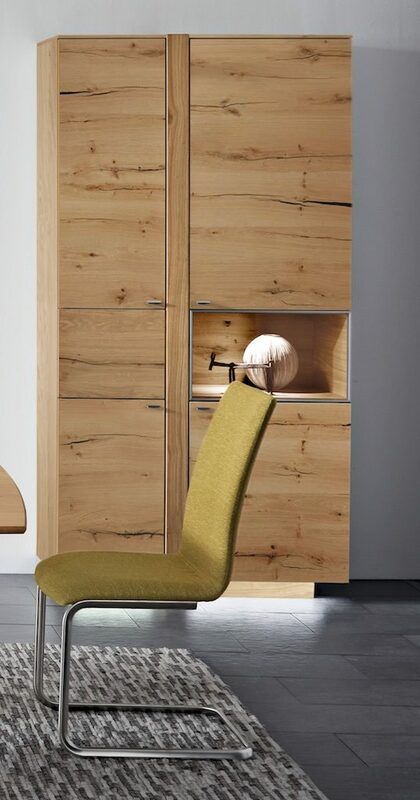 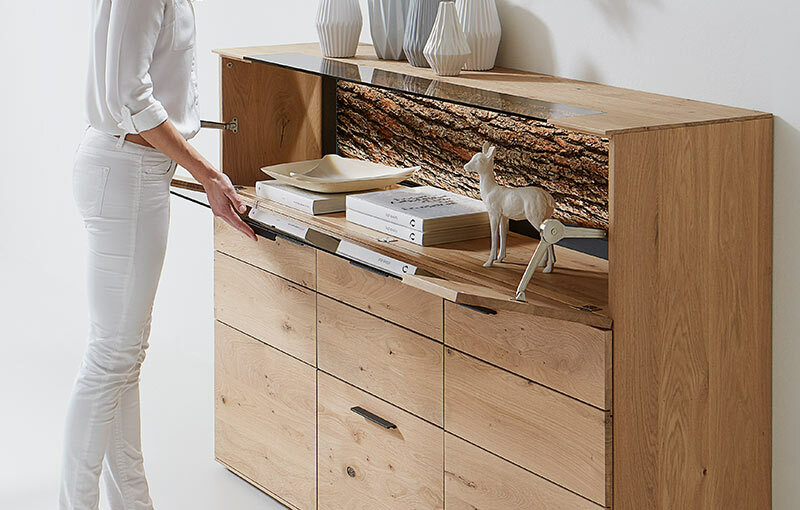 This give sideboards, glass cabinets and wall units a floating character. 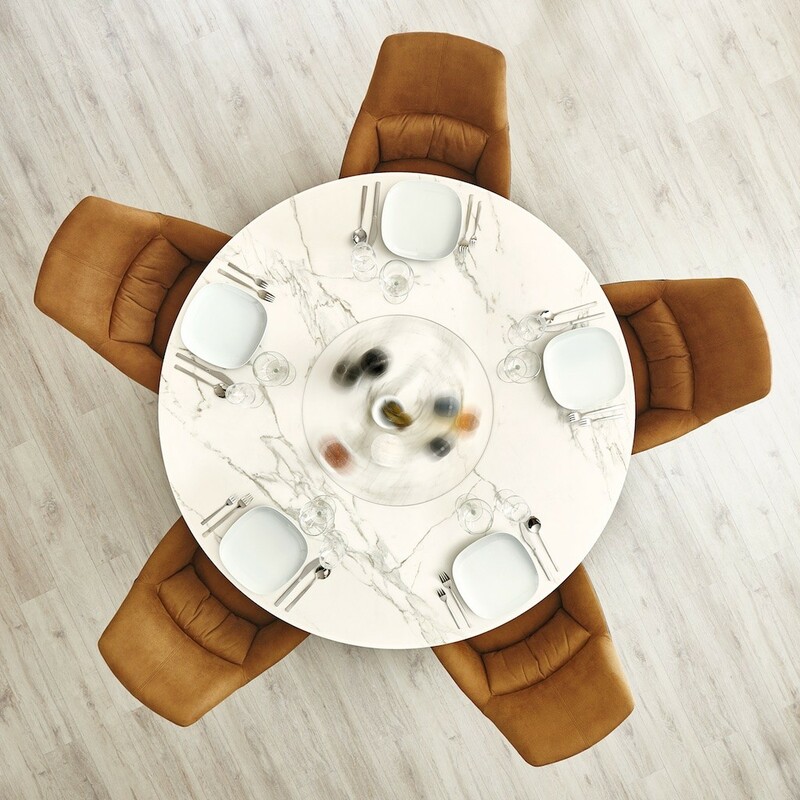 Albero is available in white and grey lacquers with all new Santana oak. 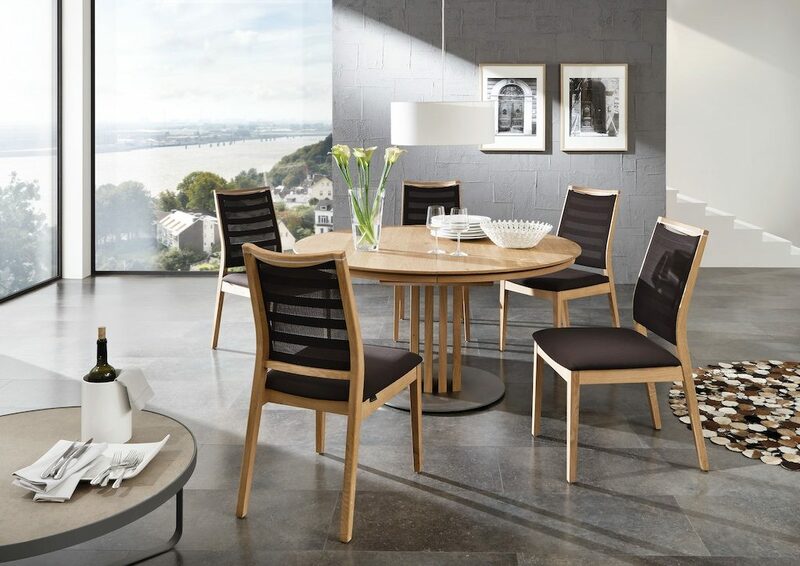 Santana oak is a very characterful figured oak with black filling detail. 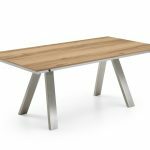 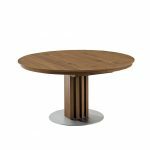 Just relaeased in March 2017 is Albero in all Santana Oak or all Walnut without the lacquer elements. 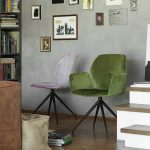 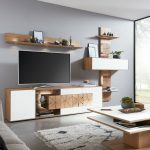 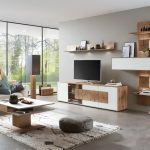 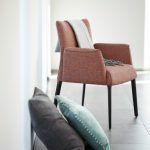 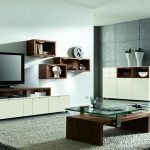 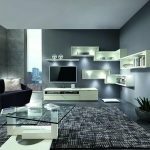 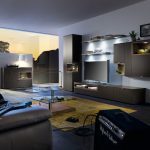 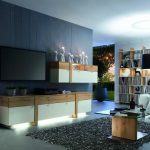 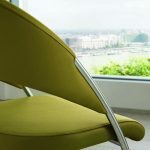 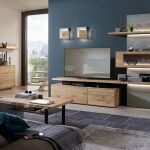 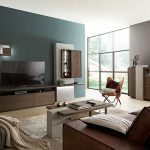 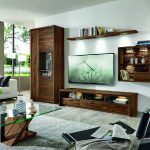 Sentino offers a spectacular variety of furniture, striking details and strong material combinations. 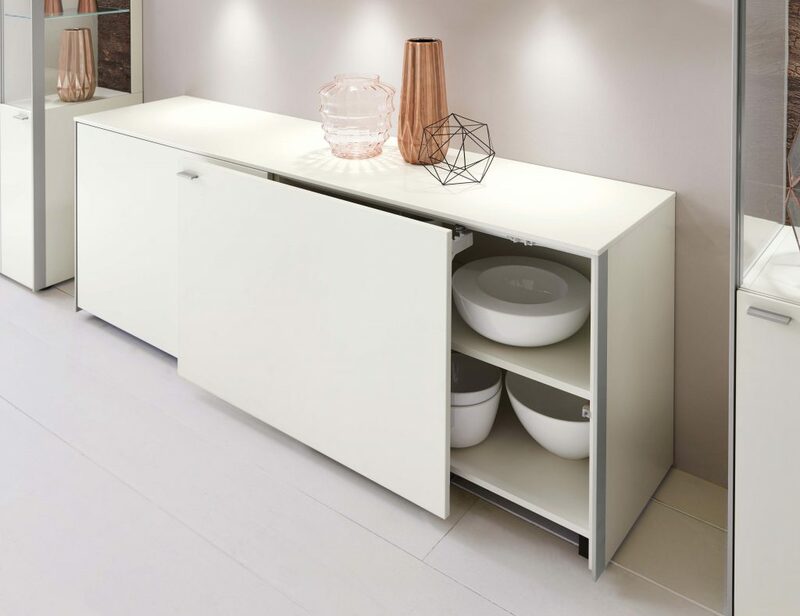 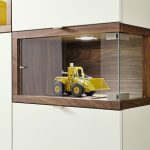 Sentino is available in white and grey lacquers with many options for door colours and the colour of the backing in the case of glass doors. 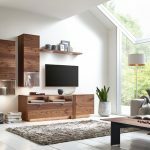 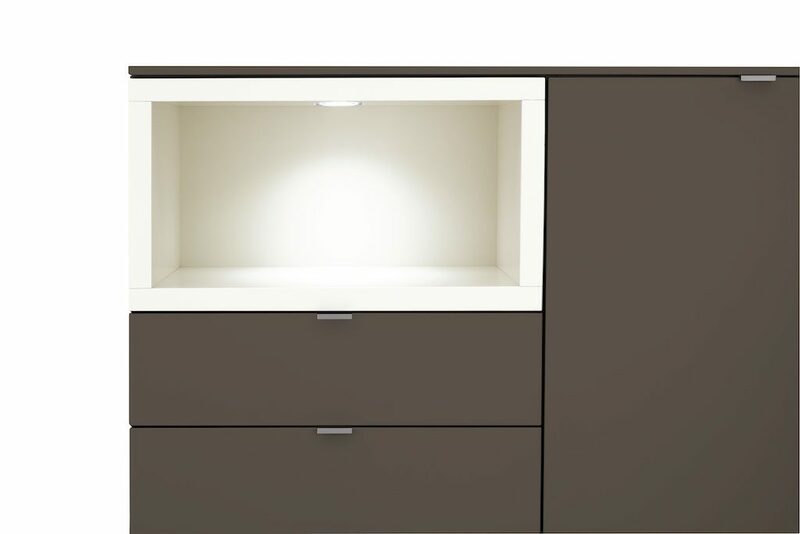 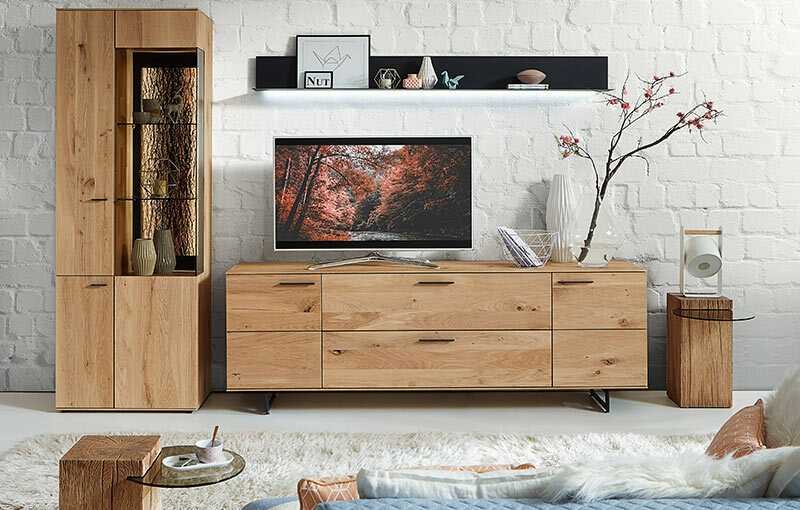 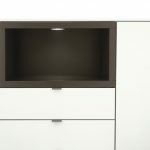 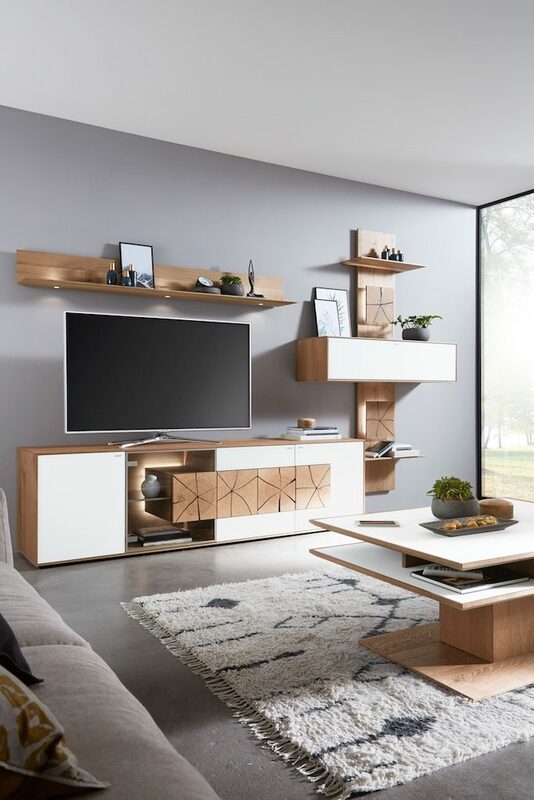 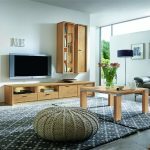 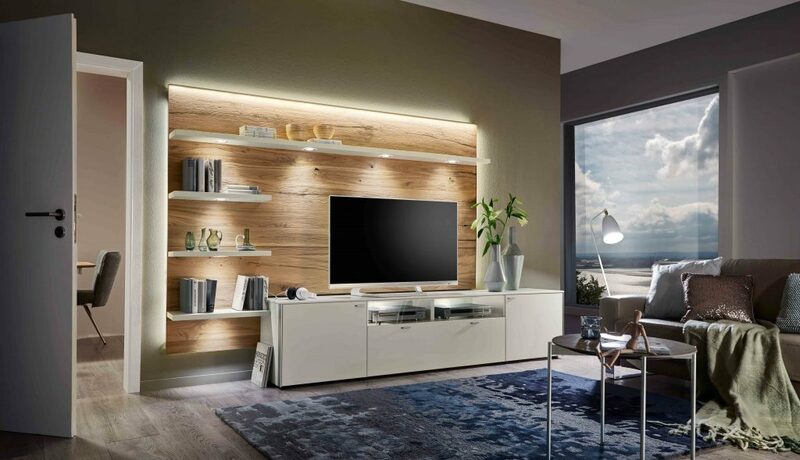 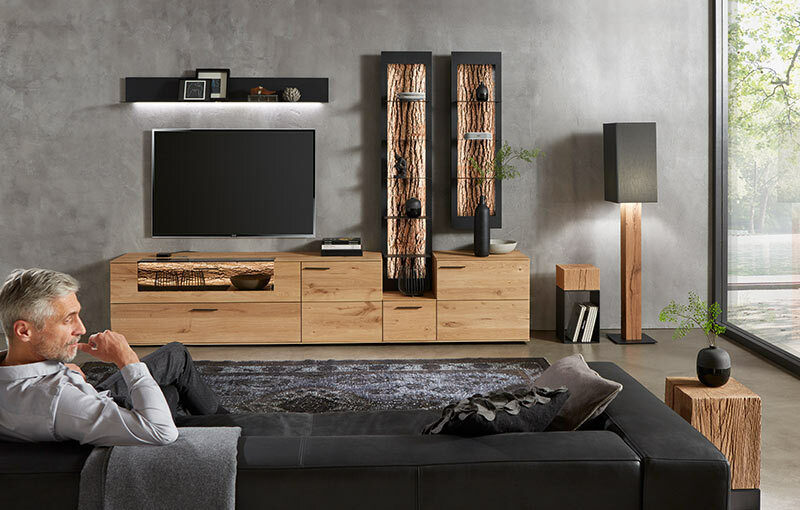 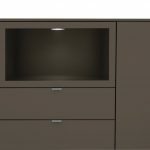 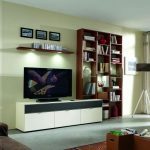 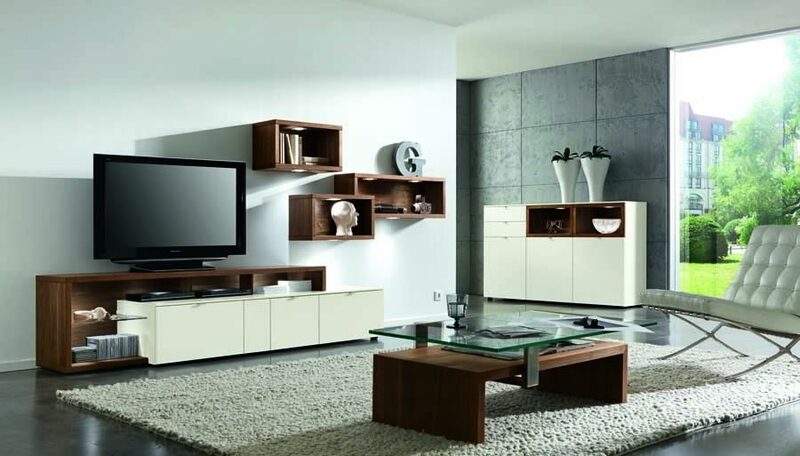 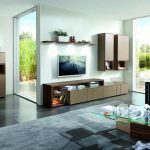 There are so many options of cabinets from tv cabinet height to full height display cabinets as well as sideboards. 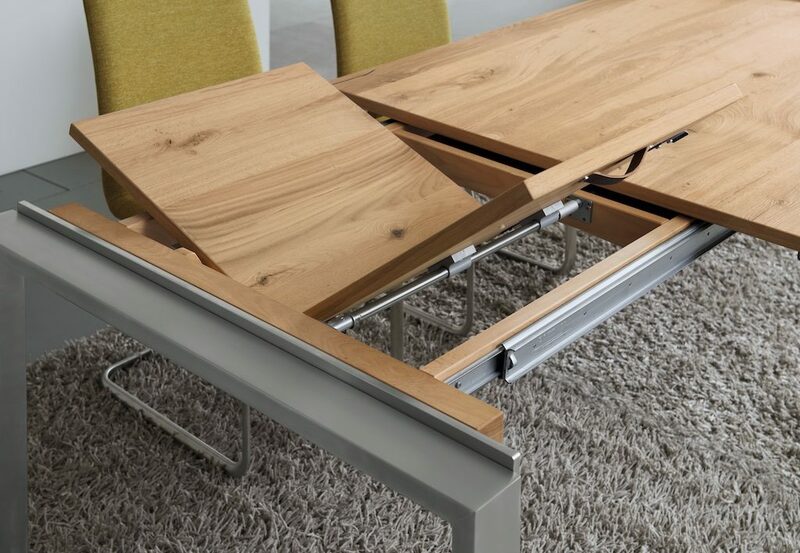 We are showing the tressle table shown in the main picture. 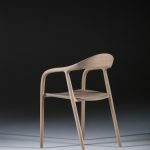 It is available with wooden or metal legs. 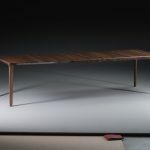 We are also showing a wooden legged and a metal framed bench. 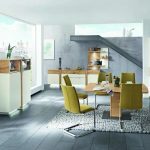 This range is new for 2017. 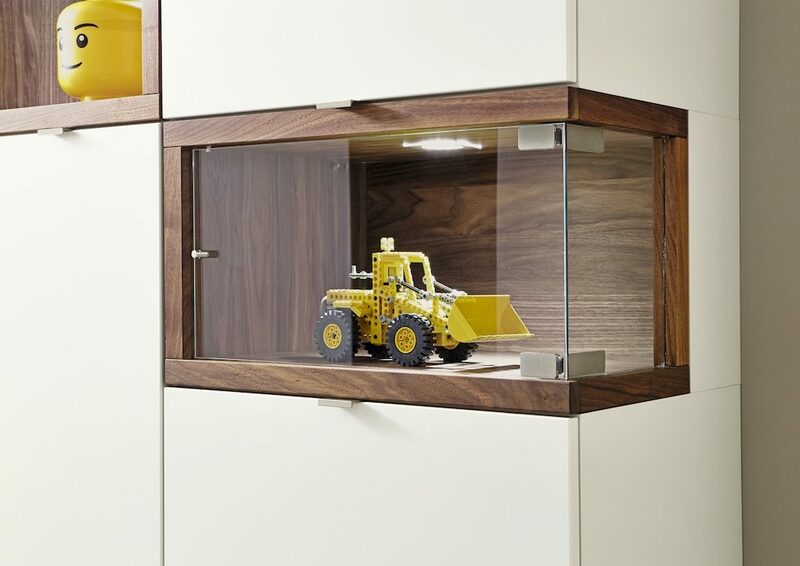 There is a major display in our Cross in Hand store and a smaller display in Eastbourne. 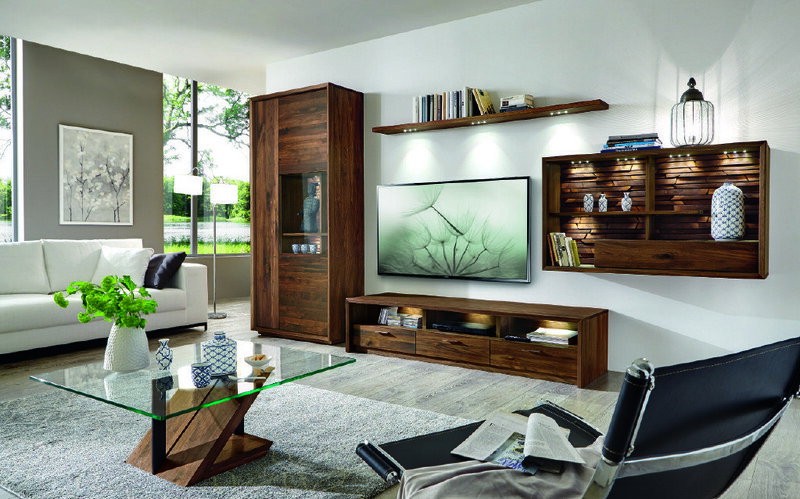 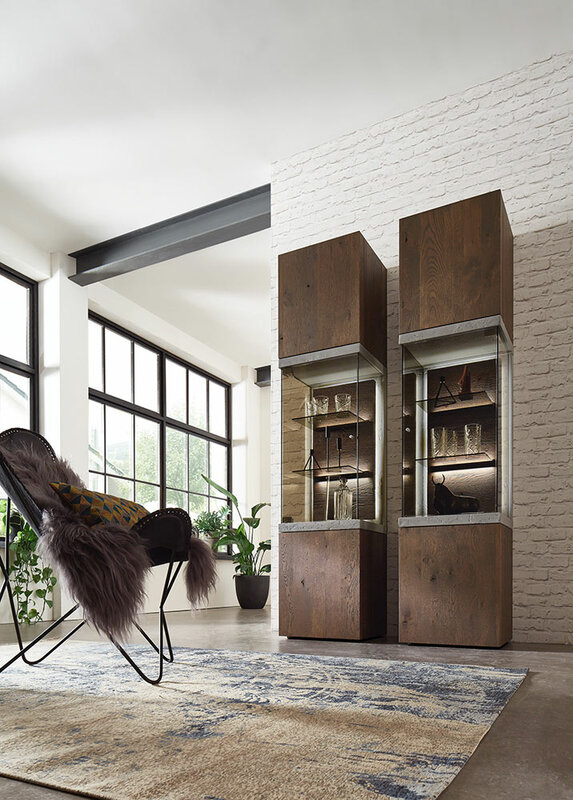 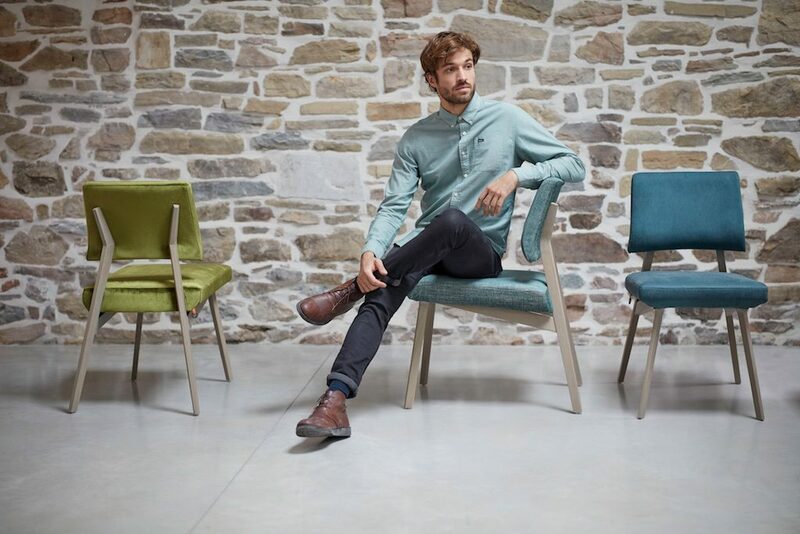 Riva 1920 are one of the finest Italian manufacturers of modern furniture and we are proud to become a stockist. 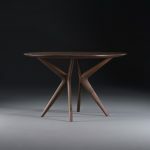 The Bedrock table is now on show, with a selection of stools and chairs. 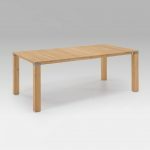 The base and top come in a selection of colours and there are many sizes to choose from. 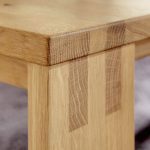 The oak top is simply two planks from a tree, not small joined planks. 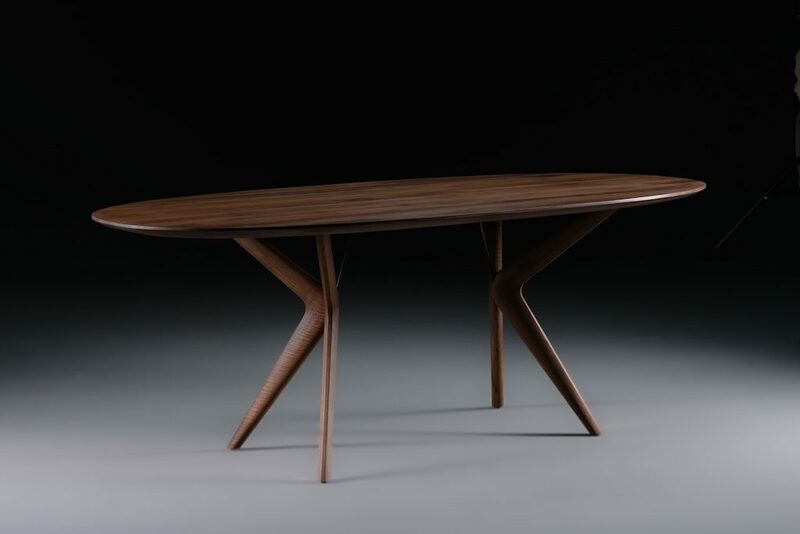 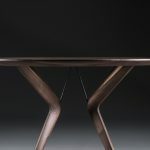 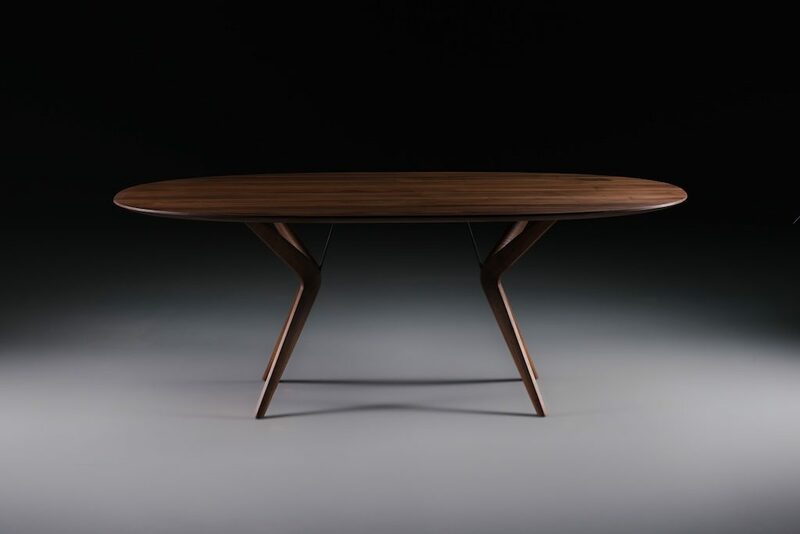 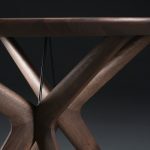 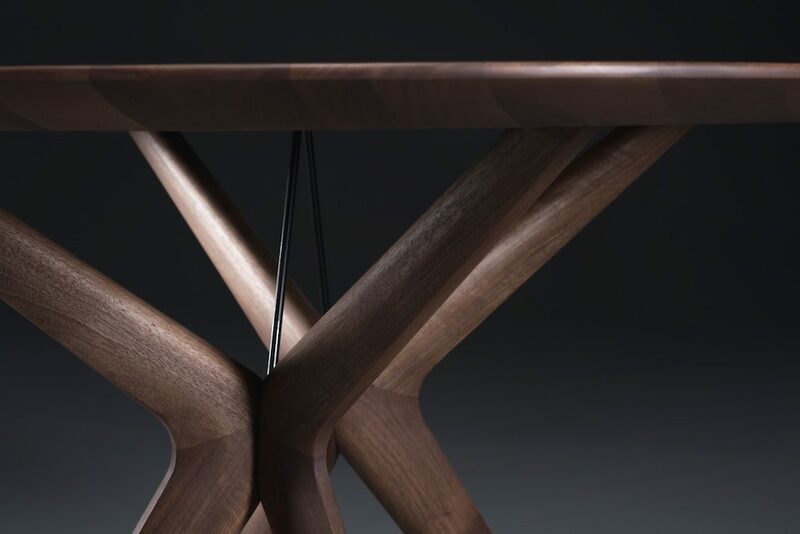 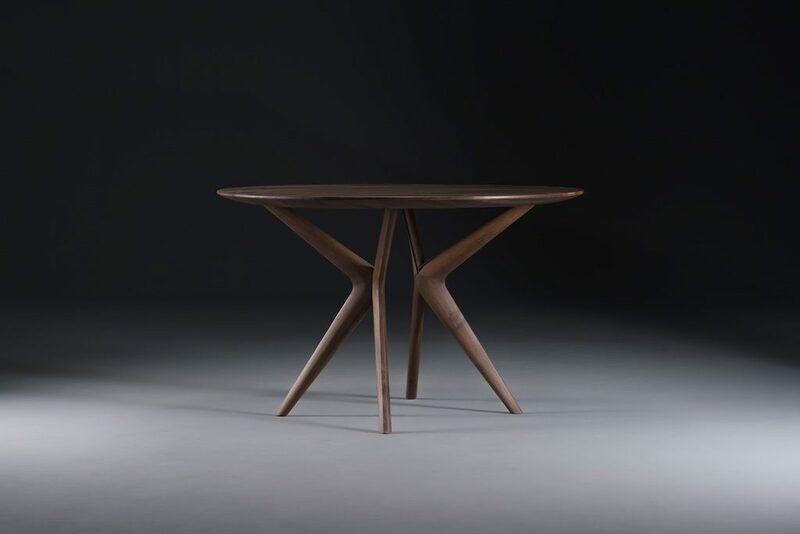 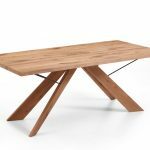 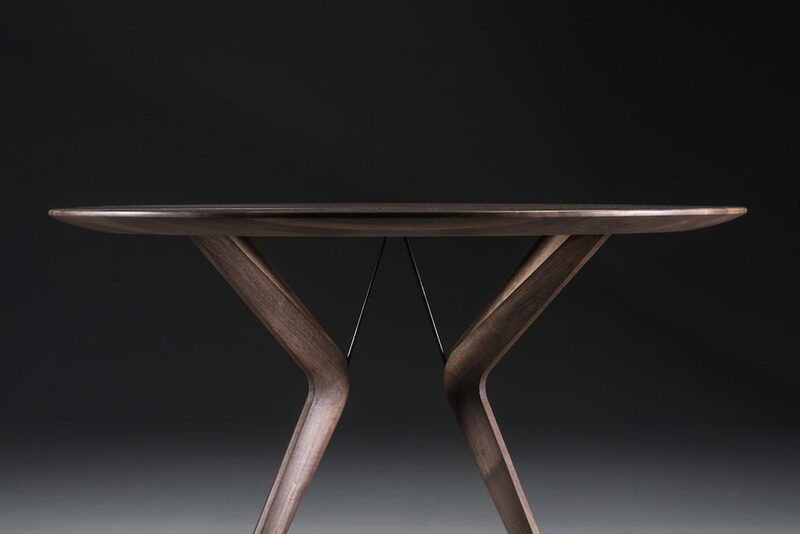 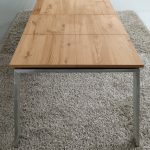 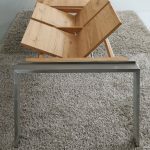 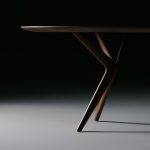 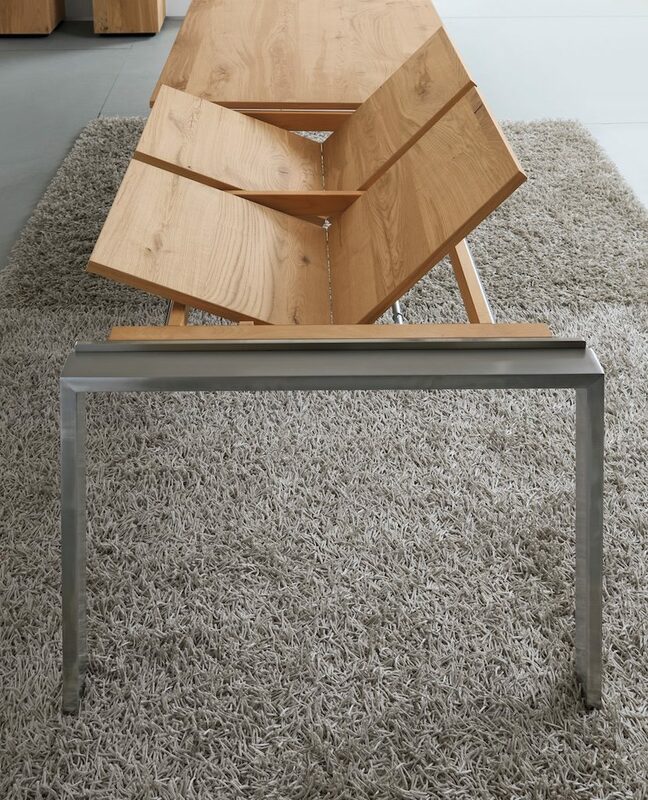 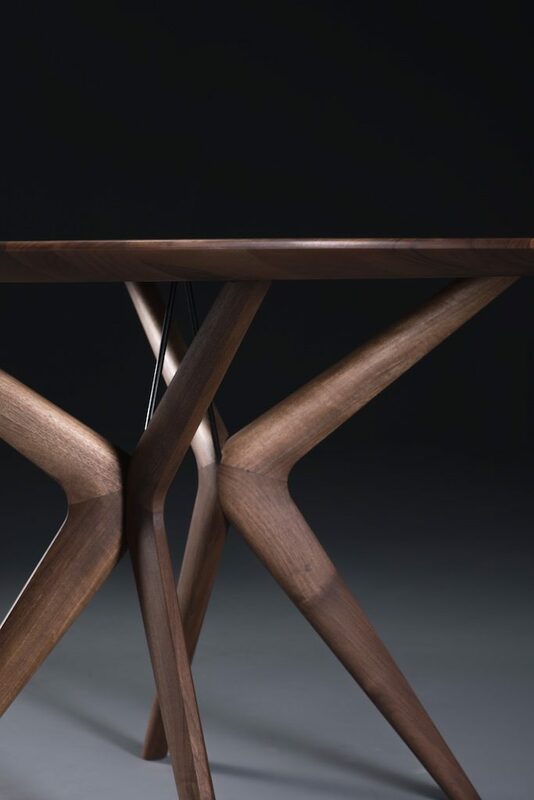 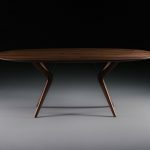 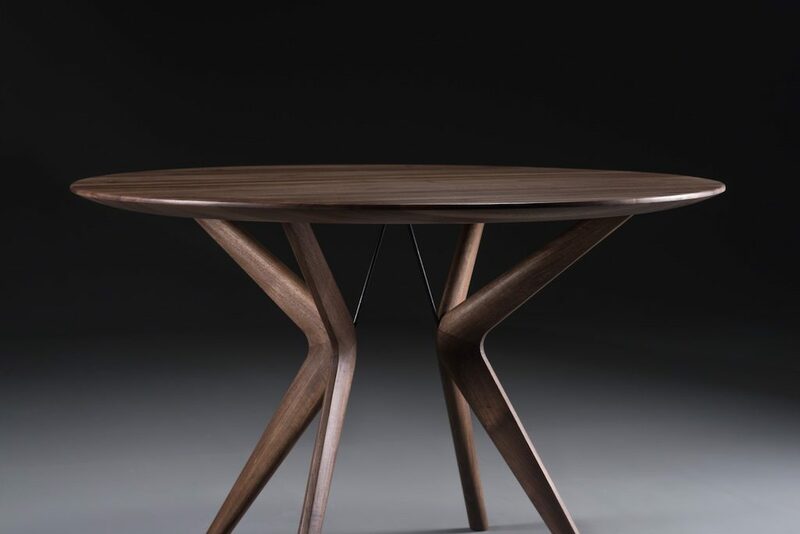 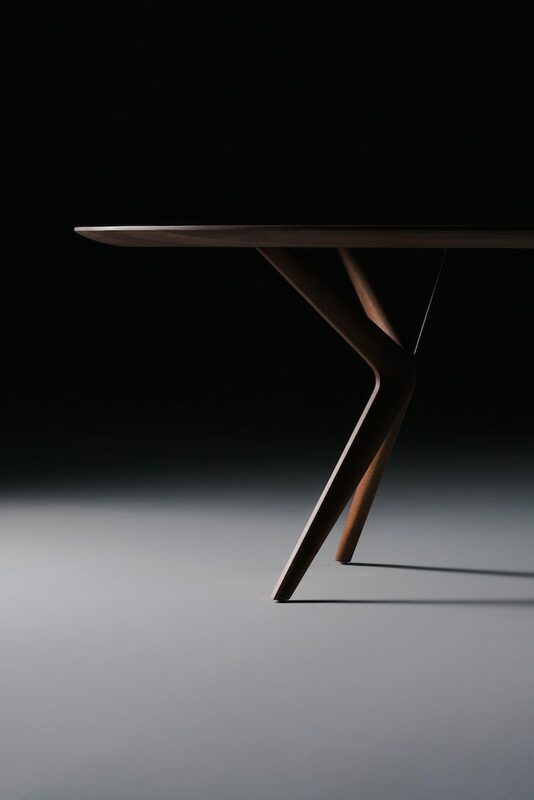 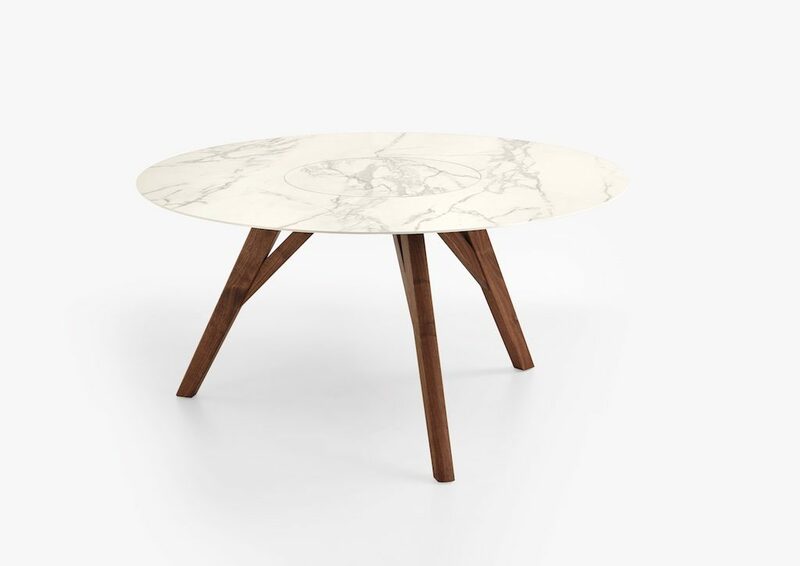 A superbly crafted table made in Bosnia. 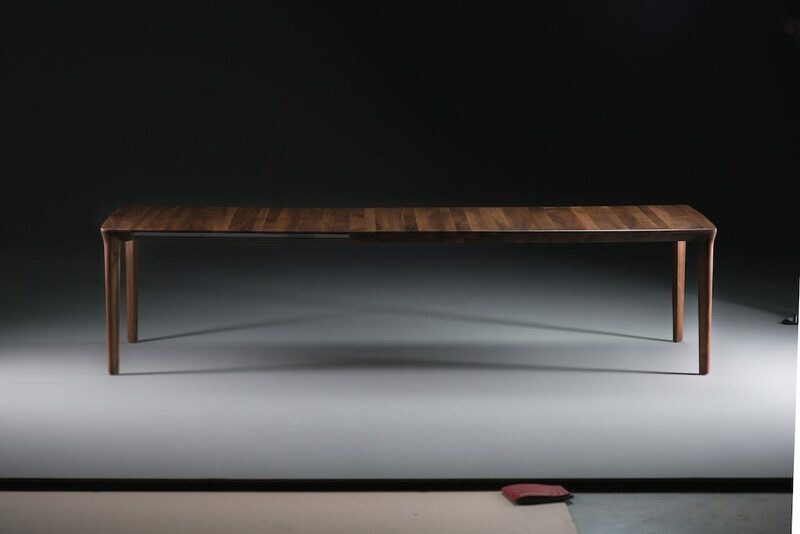 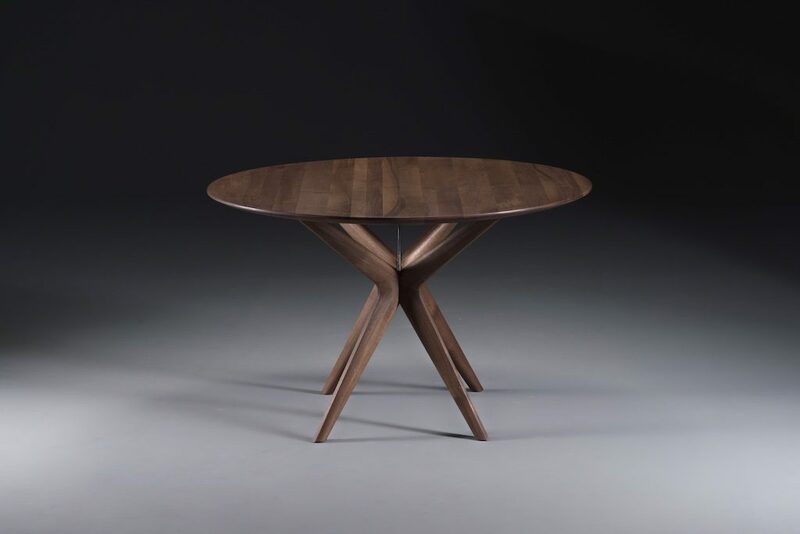 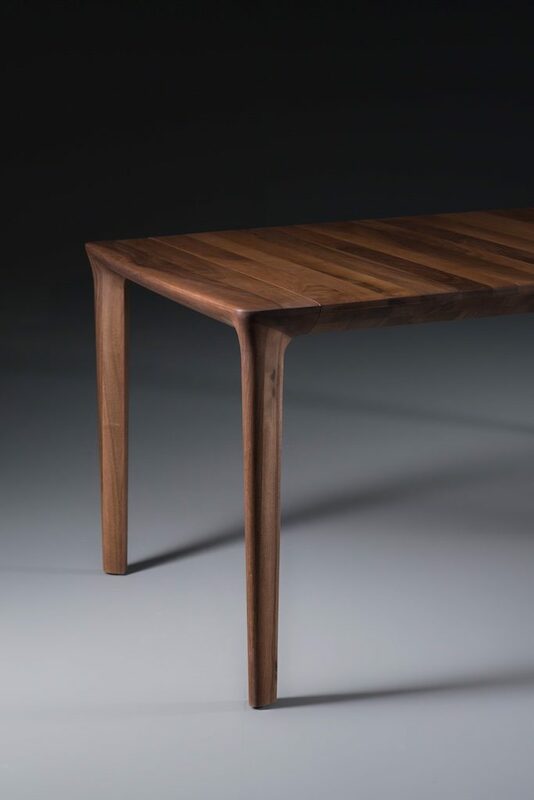 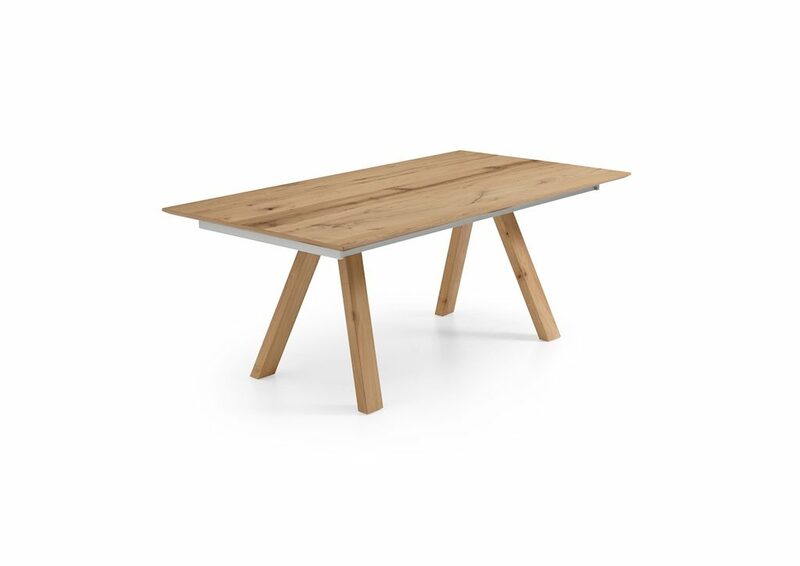 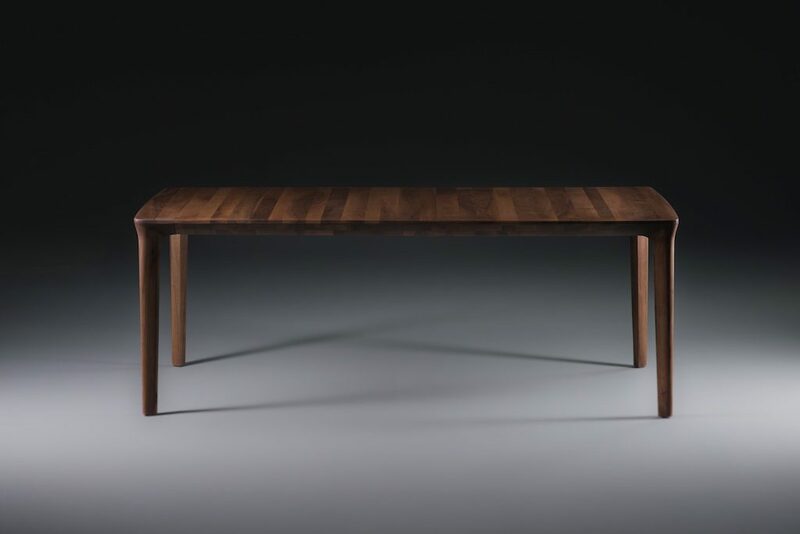 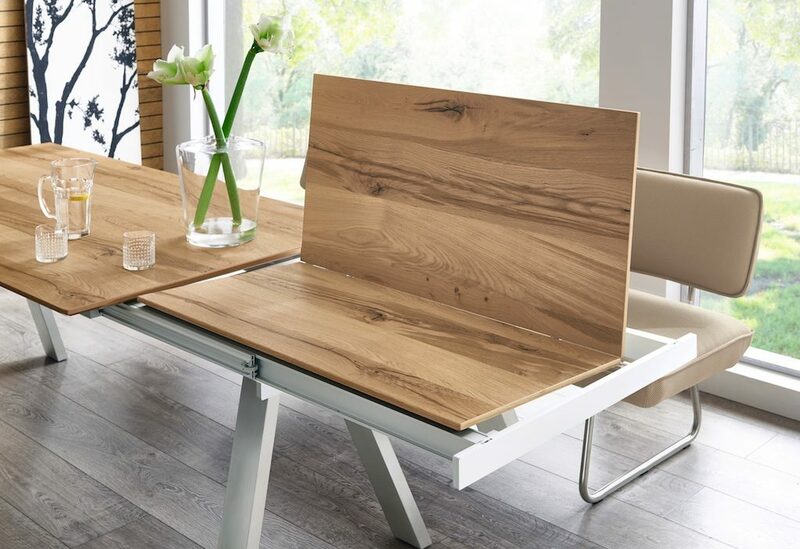 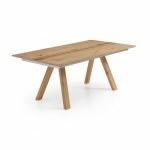 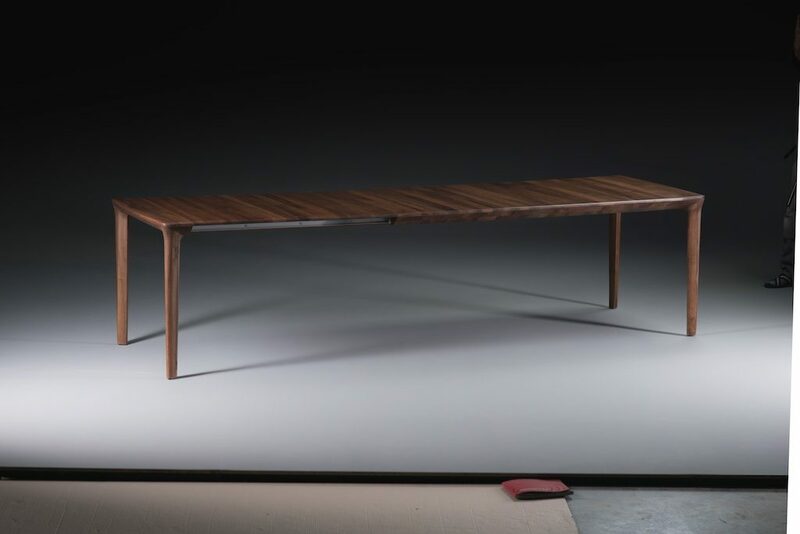 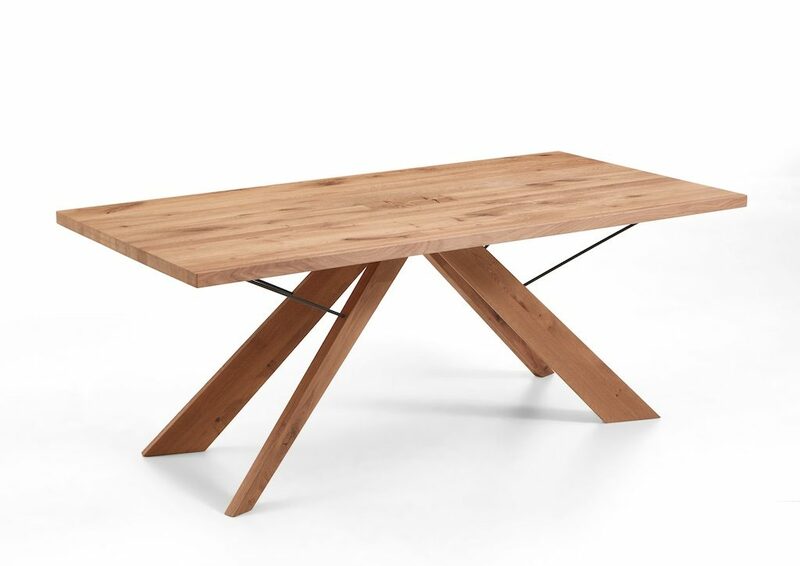 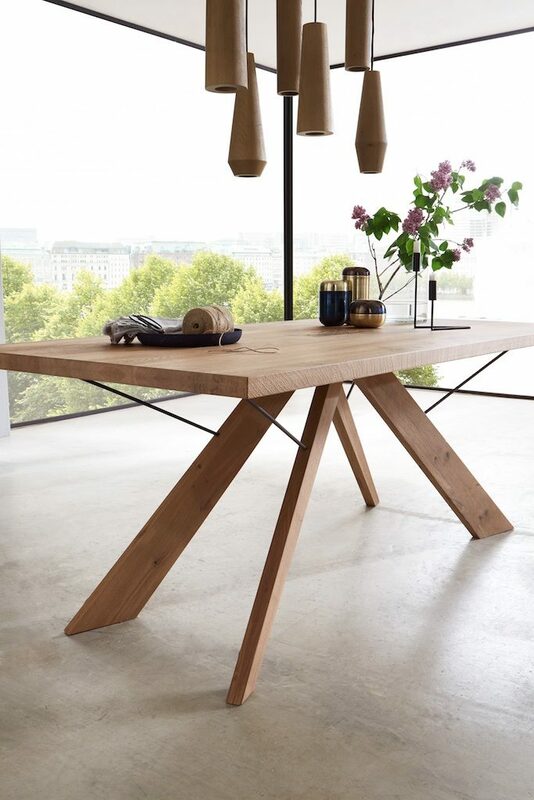 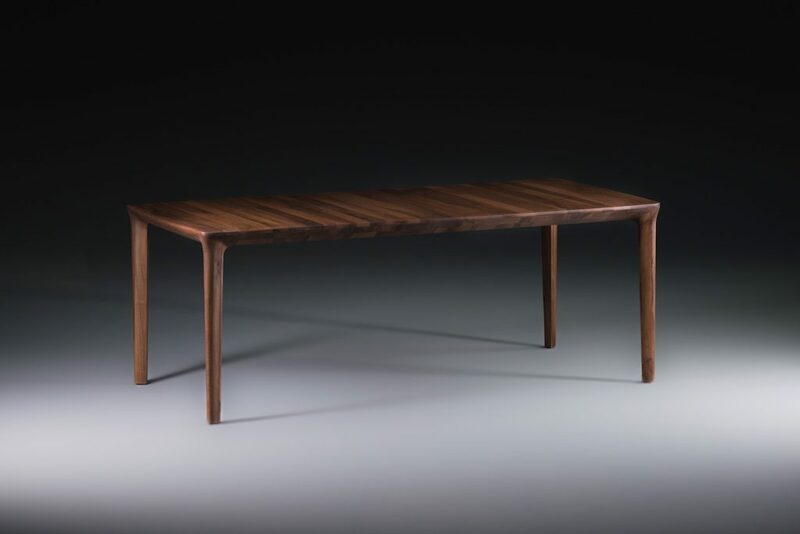 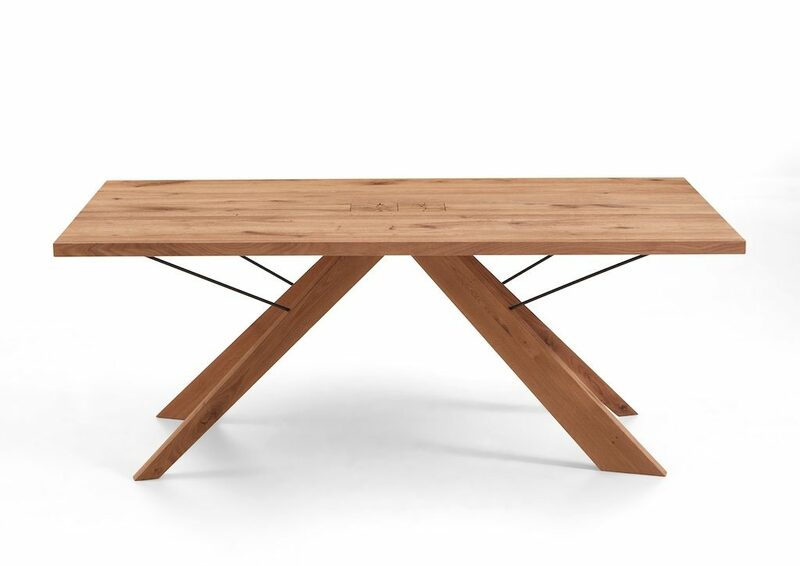 The Tara table comes in European Oak and European Walnut and is a simply stunning quality. 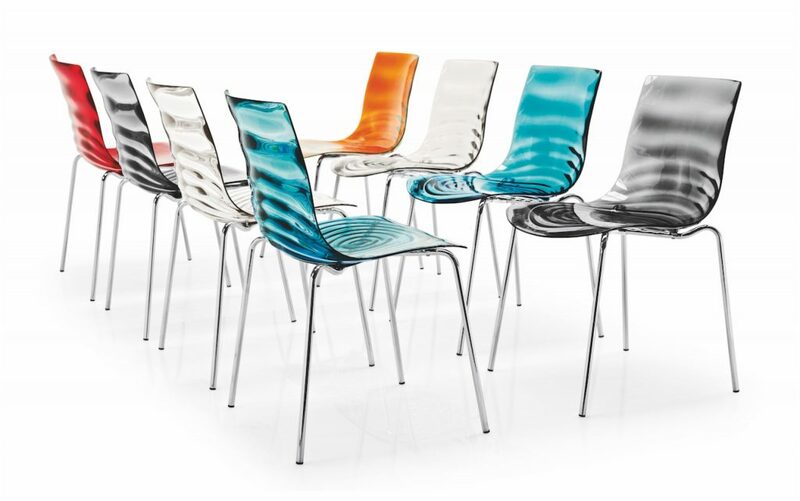 Available in fixed sizes and extending versions. 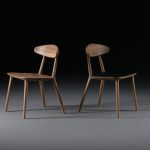 We are also showing two matching chairs. 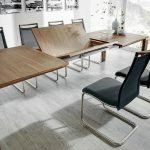 There is also a round table by this supplier which will be shown in Eastbourne. 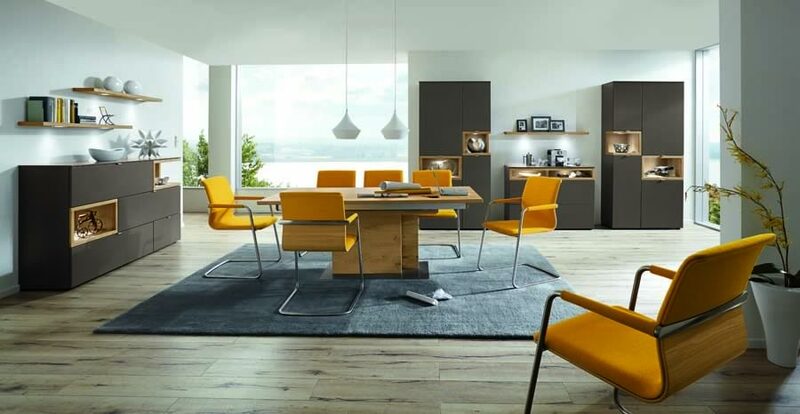 Designed and made in Italy, Connubia is the new brand of the famous Italian furniture maker, Calligaris. 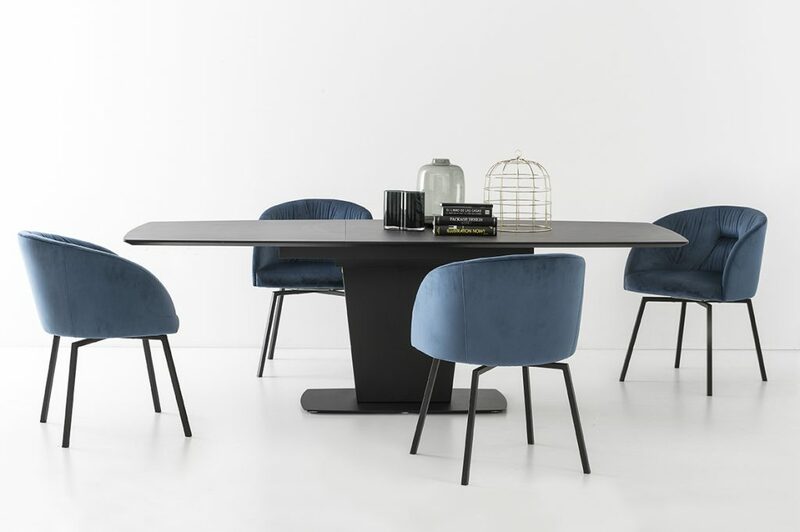 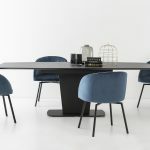 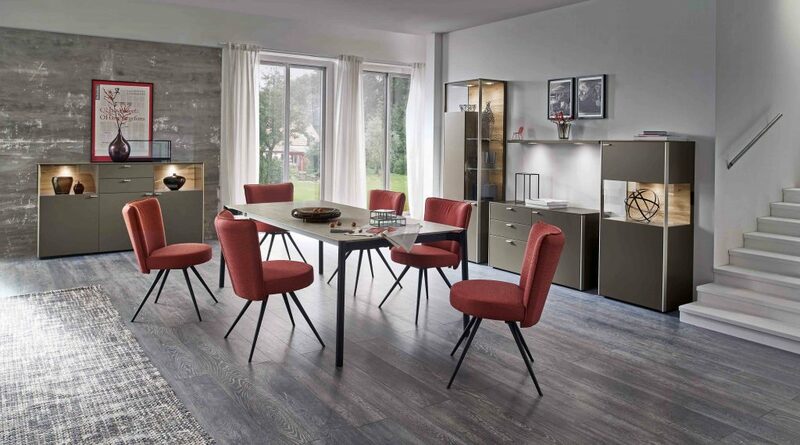 Calligaris combine their 90 years of artisanal approach to furniture with modern methods and designs to make interesting, functional and beautiful tables and chairs. 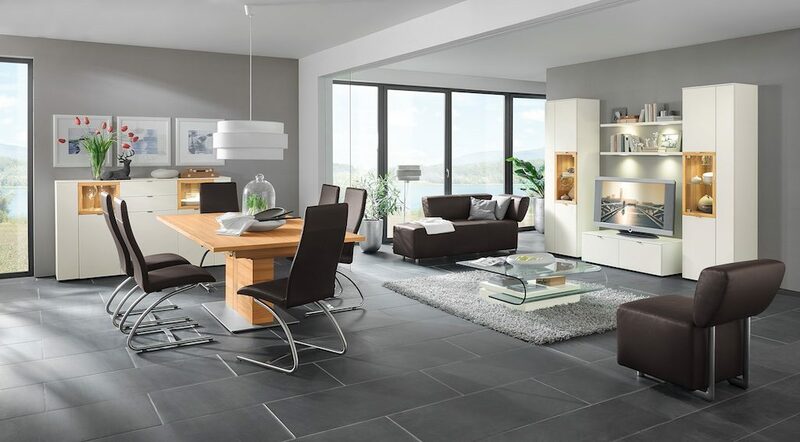 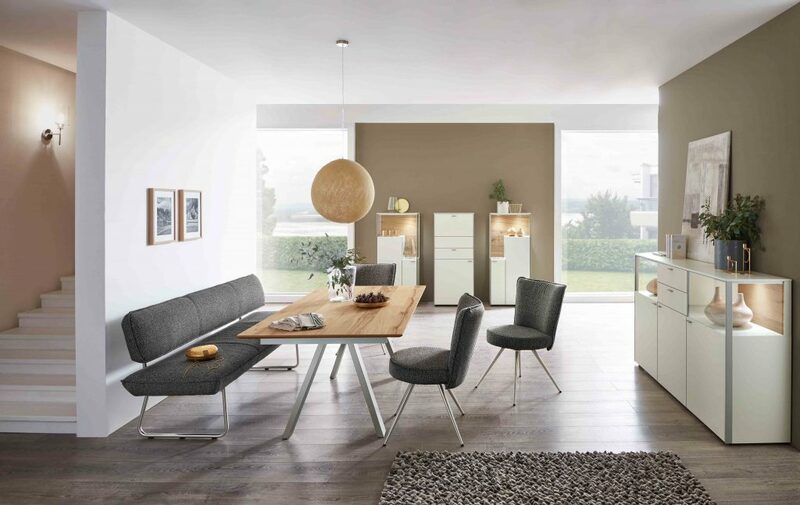 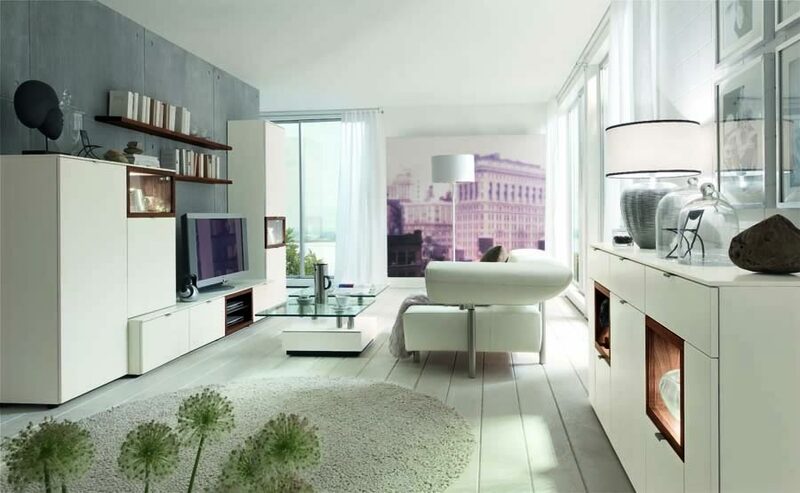 Connubia is conceived as a sub brand to promote the “essentials” of the Calligaris range. 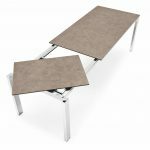 Each table we show comes in a range of sizes and with various extension options. 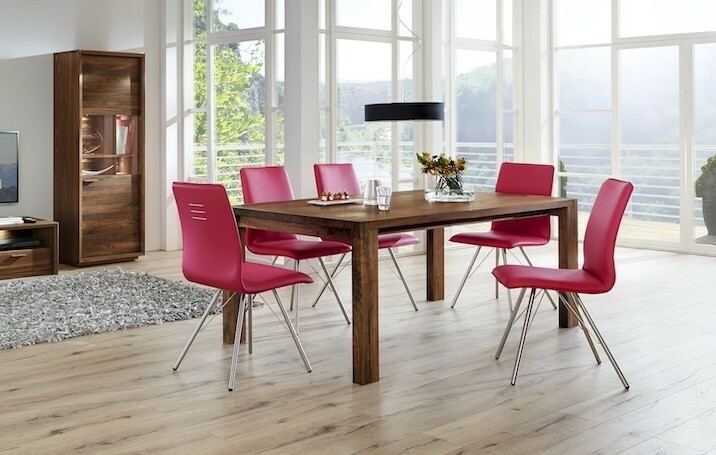 The colour combinations are huge and include different colour legs and tops. 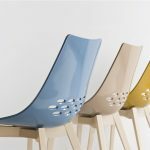 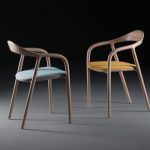 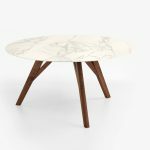 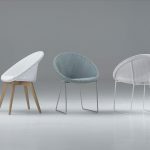 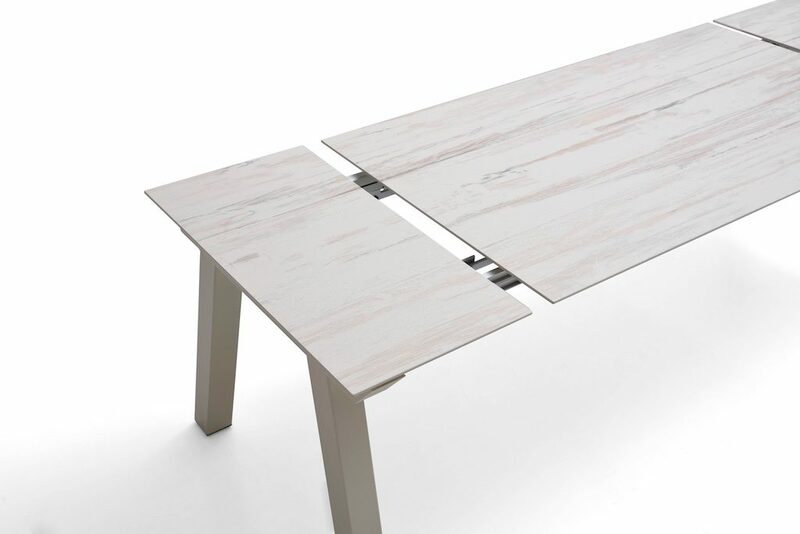 The legs can be wood or metal in different colours and the tops can be ceramic, glass or laminate. 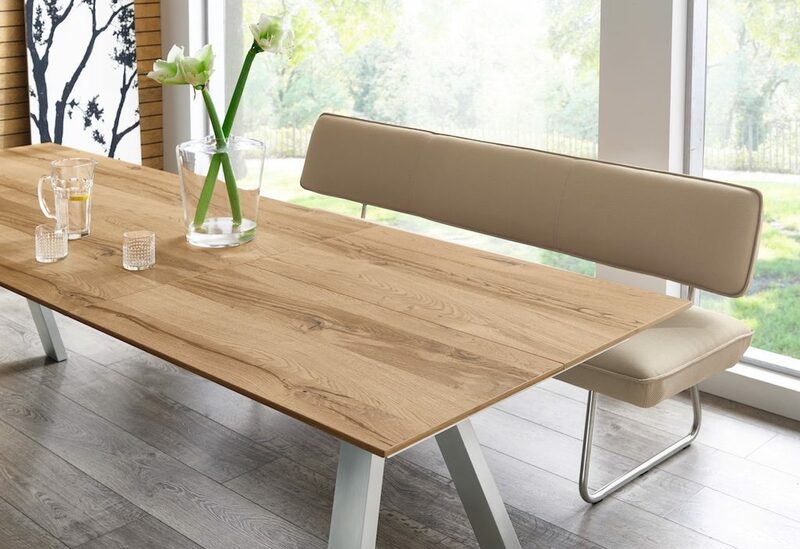 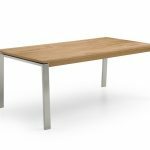 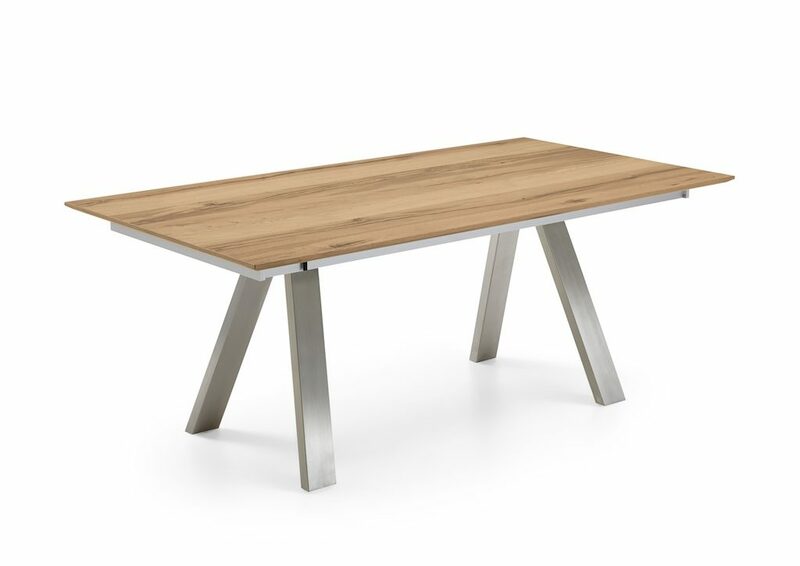 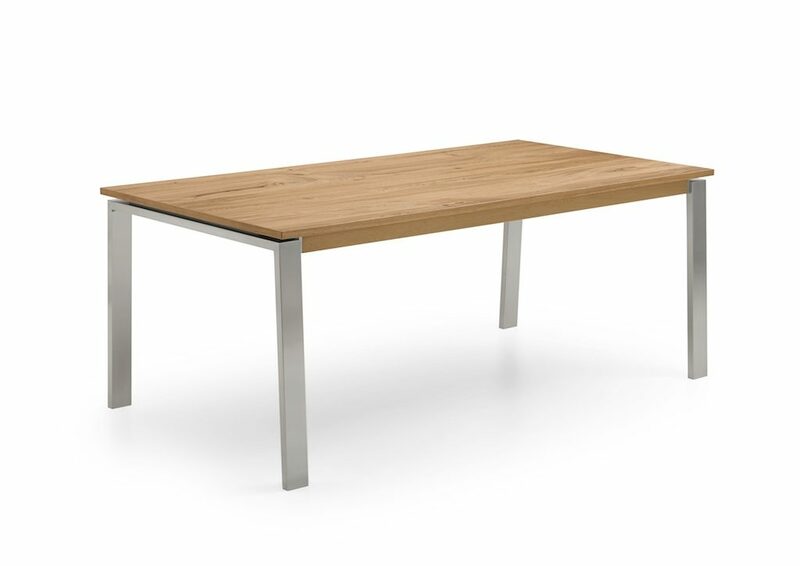 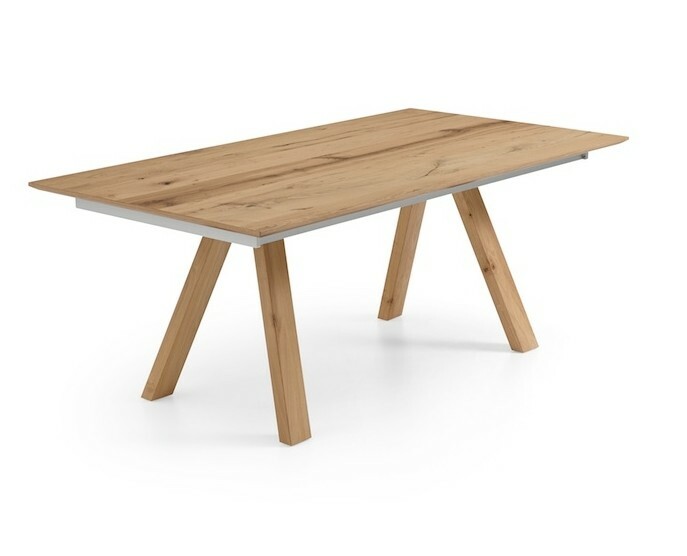 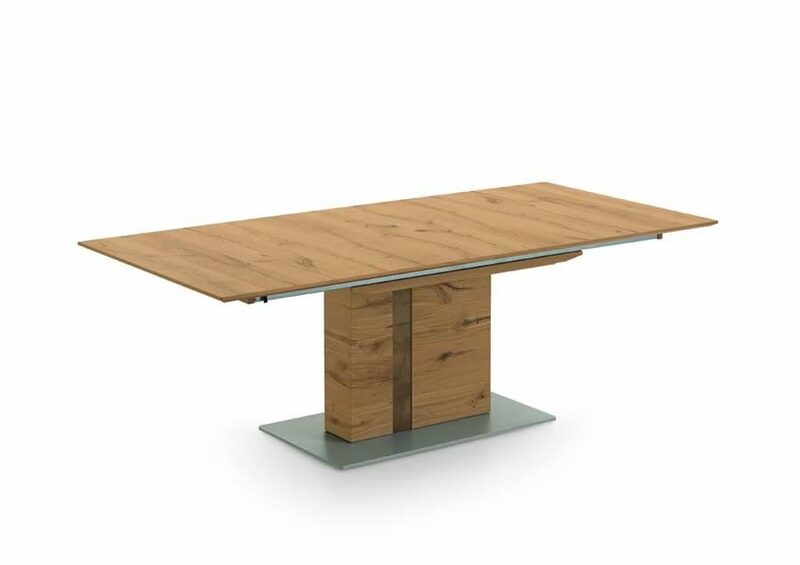 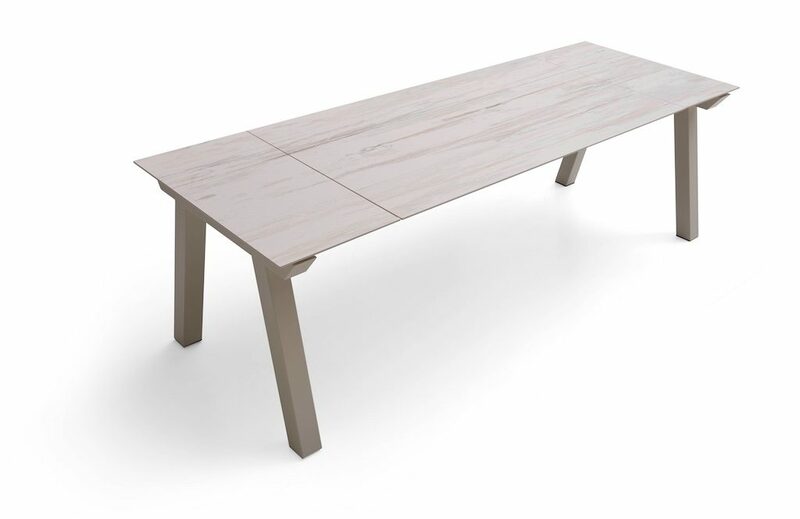 Laminate is the most economic and an Emminence 130cm extending table starts at £650. 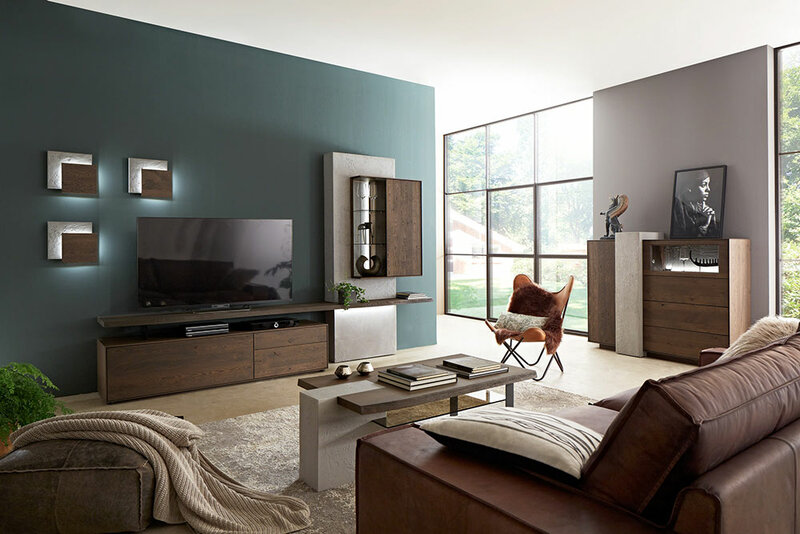 The gallery shows some of the possibilities but come and see our selection to learn more about the range. 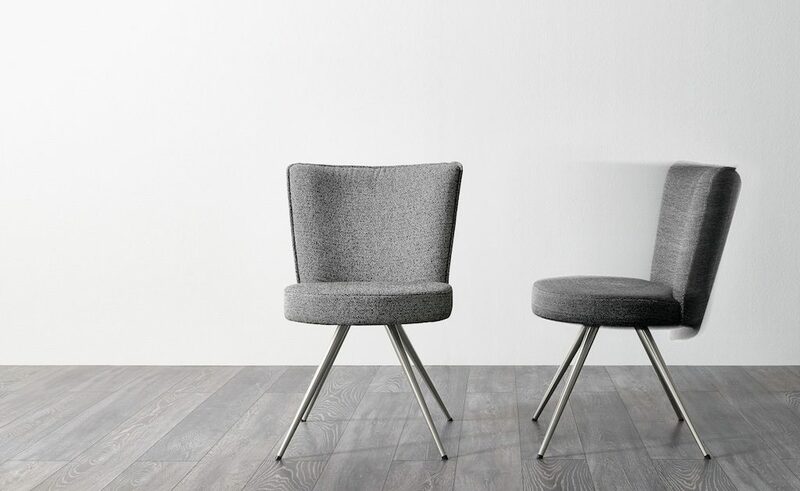 The chairs are varied and interesting. 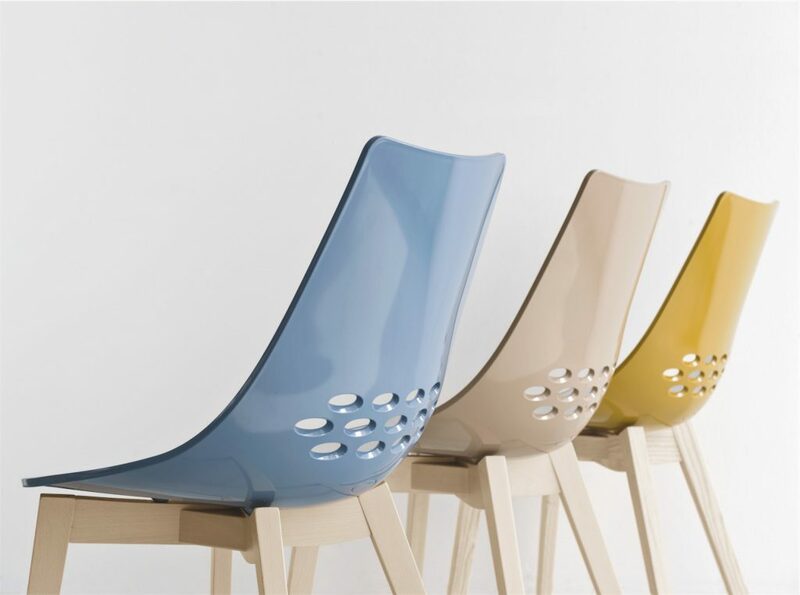 There are some plastic chairs in various colours which are very practical kitchen chairs and also surprisingly comfortable. 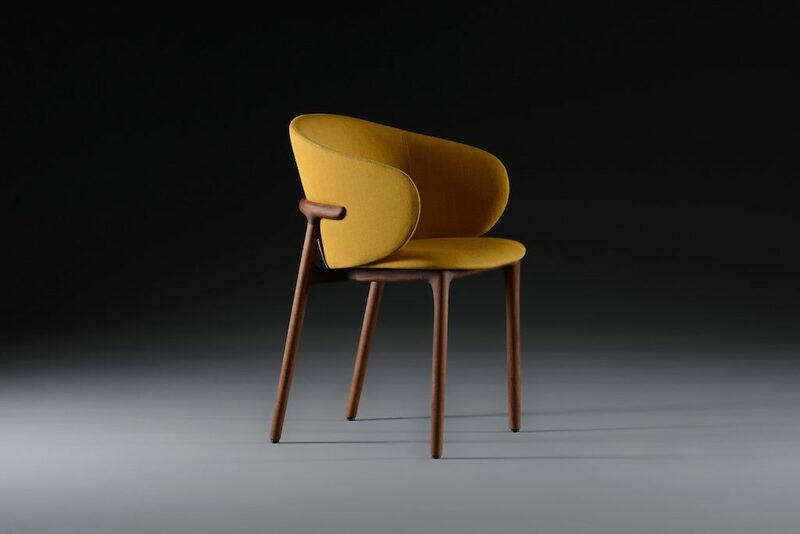 Also there are deeply padded chairs in fabric, faux leather and leather. We show the following tables: Baron with both style legs, Emminence with wood and metal legs and Athos. 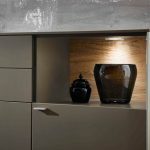 We show 5 different ceramic finishes. 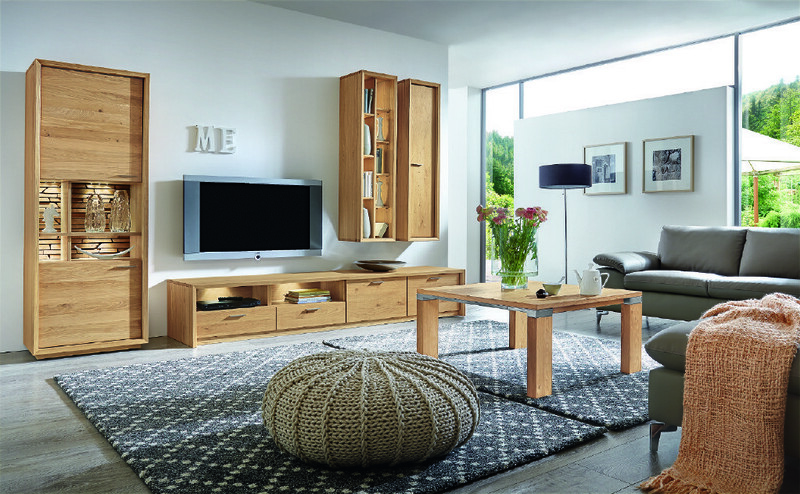 NEW Range now on show. 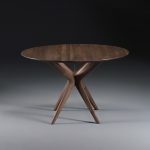 At the Cross in Hand store we are showing the round and oval versions of this table. 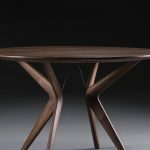 A superbly crafted table made in Bosnia. 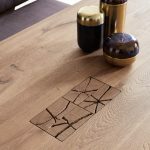 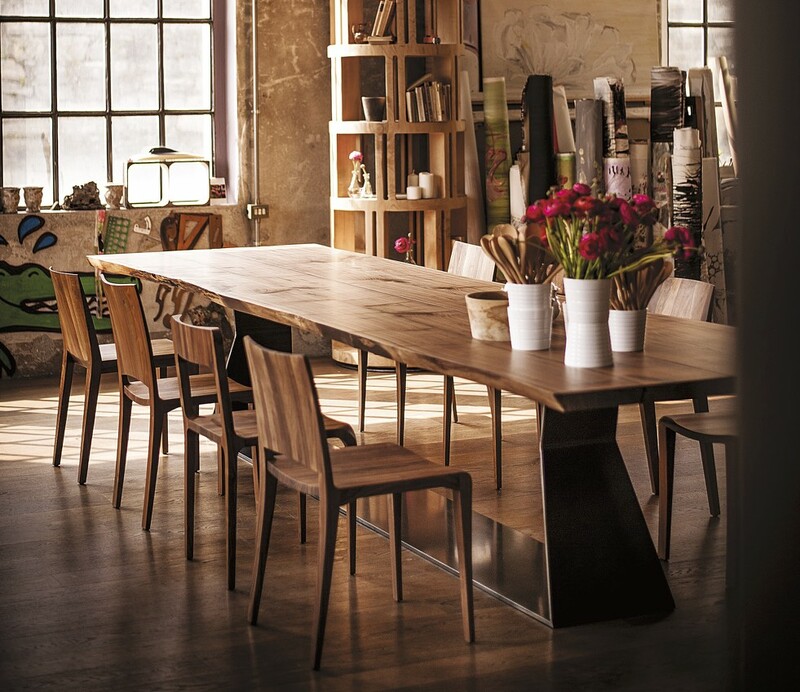 The Lakri table comes in European Oak and European Walnut and is a simply stunning quality. 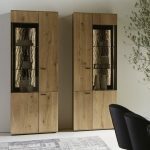 80cm, 100cm, 120cm 140cm 160cm. 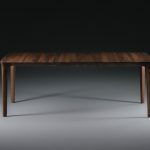 160 to 260 long and 110 or 120cm wide. 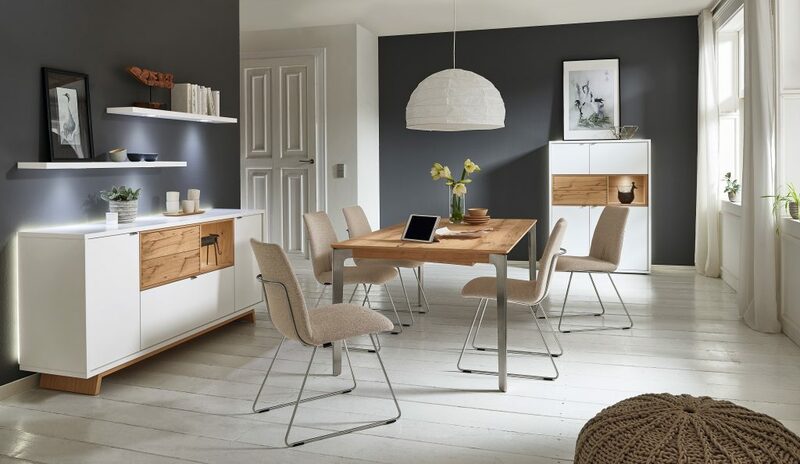 We are also showing 3 chairs by this supplier and 2 styles of sideboards which come in various sizes. 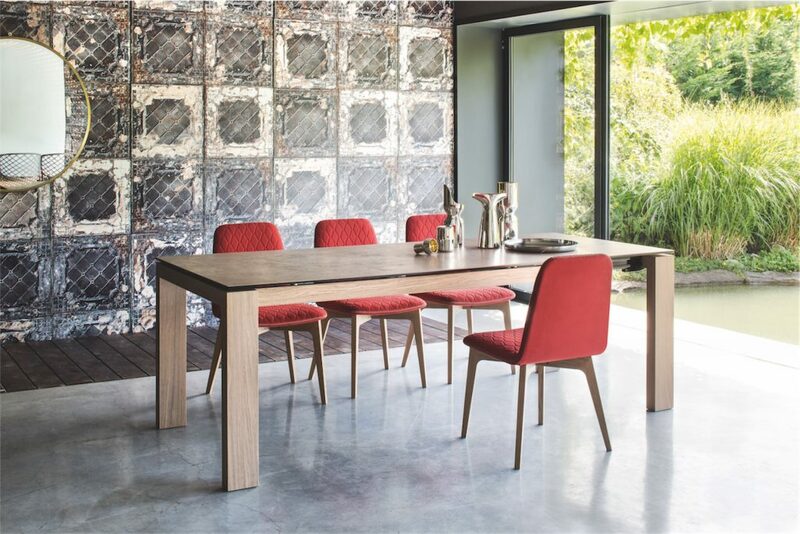 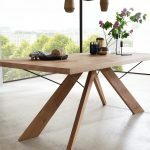 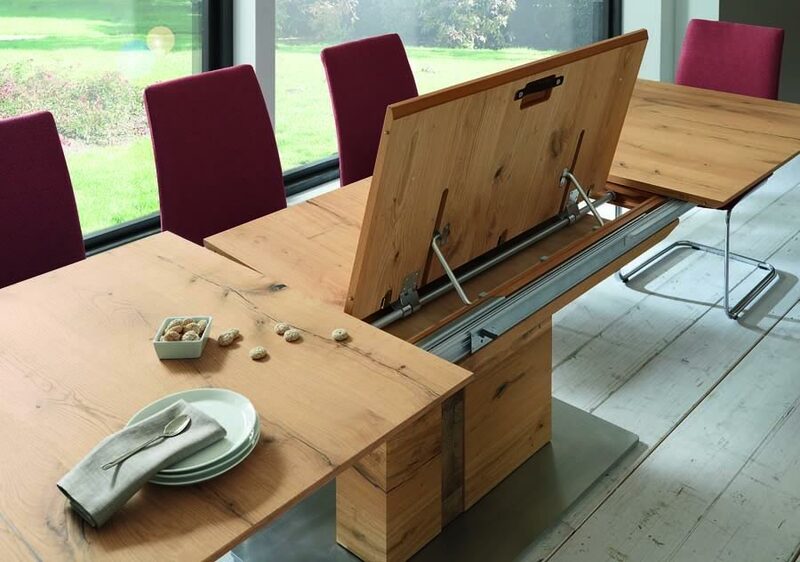 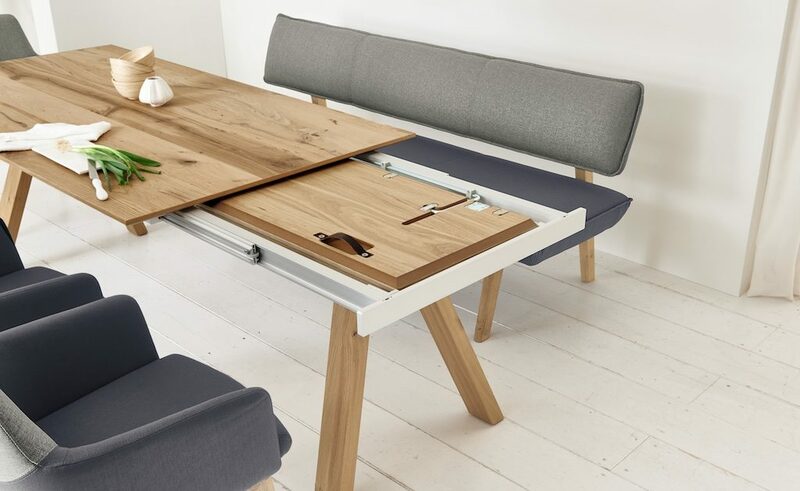 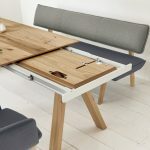 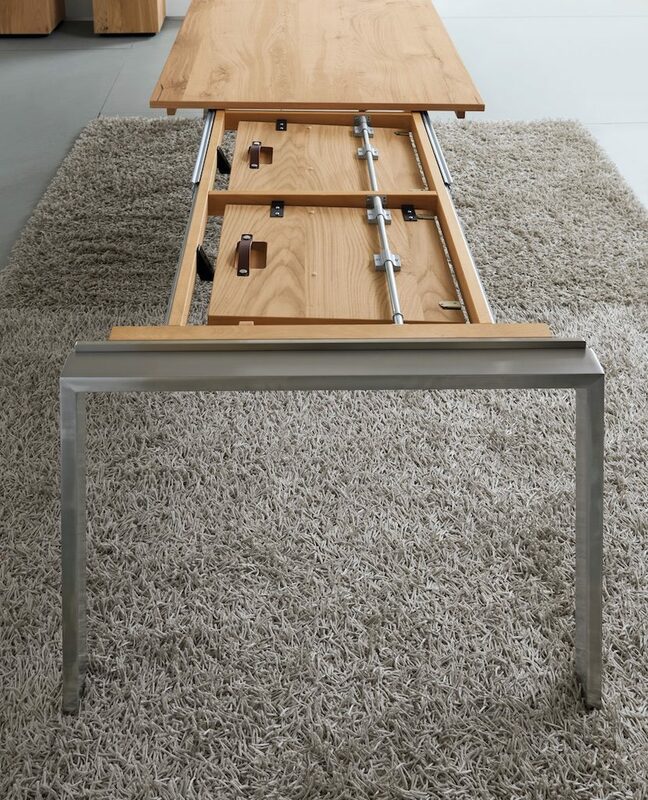 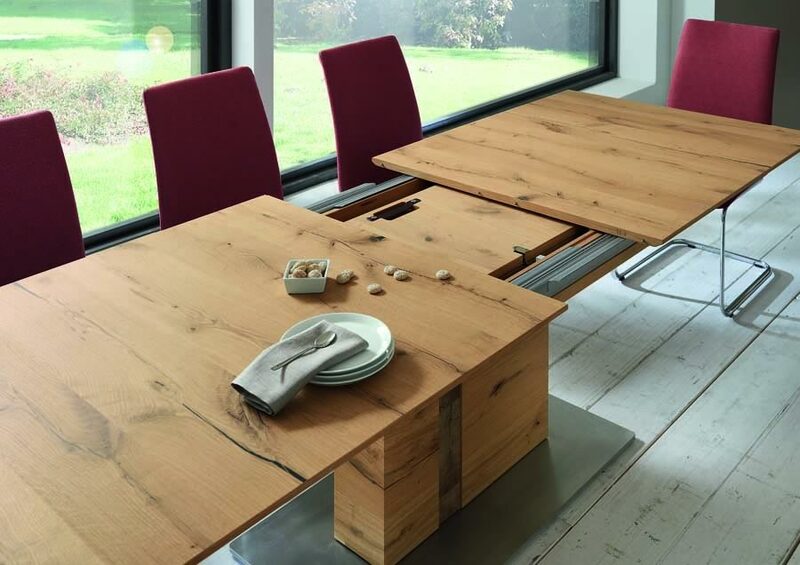 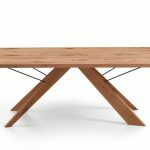 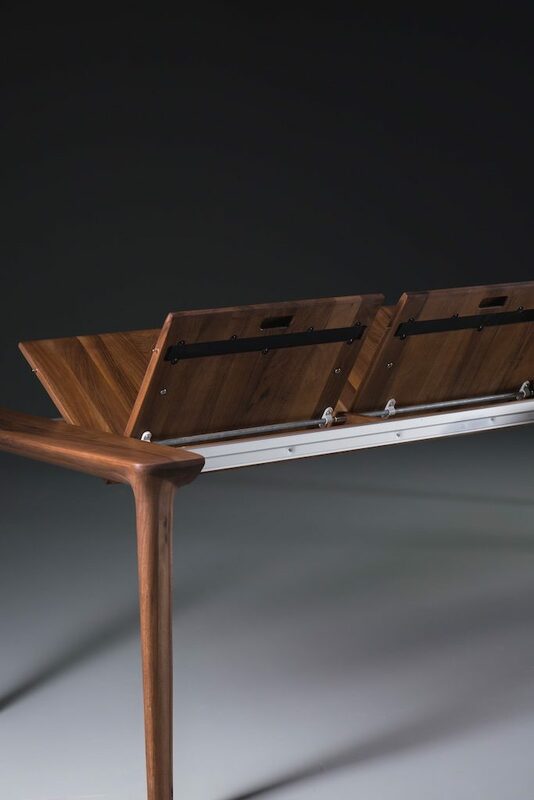 This new table design brings the trestle table right up to date! 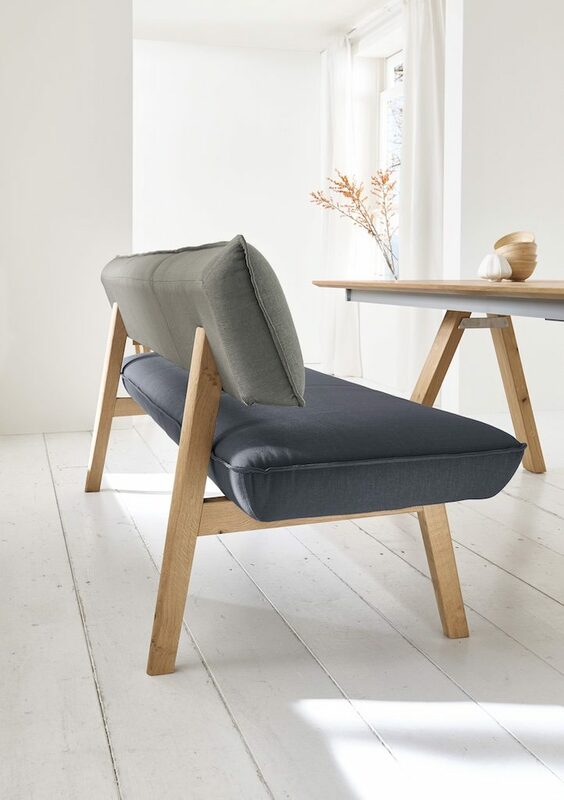 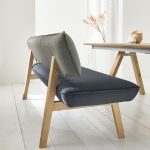 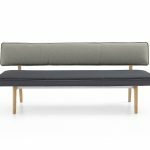 Fancy a bench but find them generally uncomfortable – try this one! 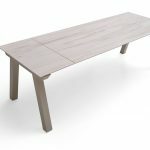 It is available with wood and metal legs and then sizes from 140 to 230cm. 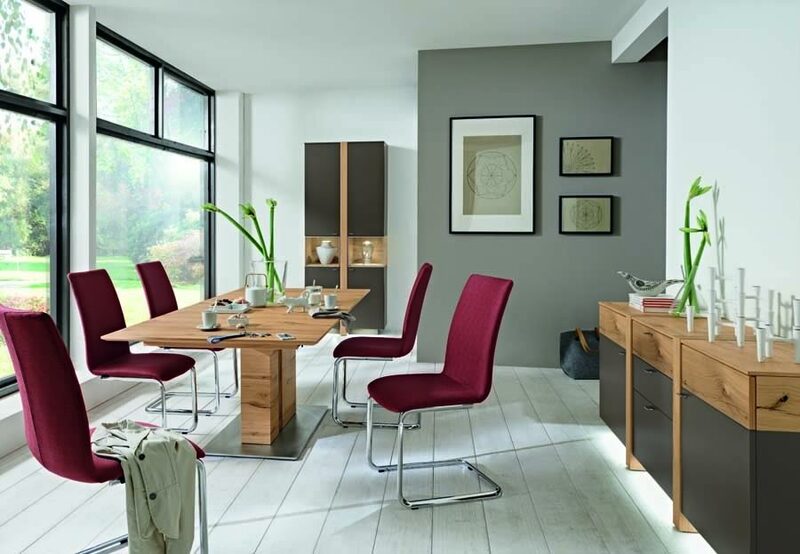 Then you can choose from a range of fabrics, faux leathers and real leathers. 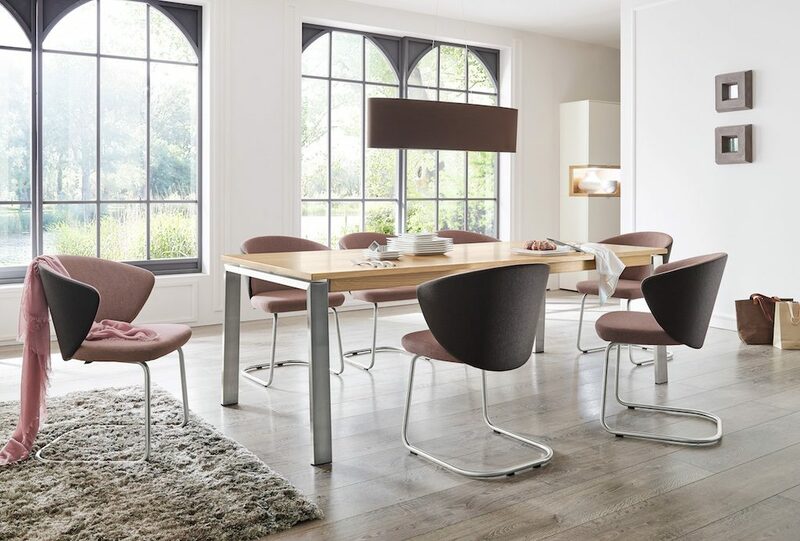 If you prefer chairs, we have an excellent range with either metal or wooden legs. 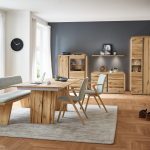 This is a new range, just released in the spring of 2017. 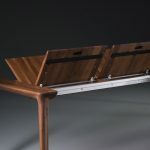 Please visit us to see the whole range. 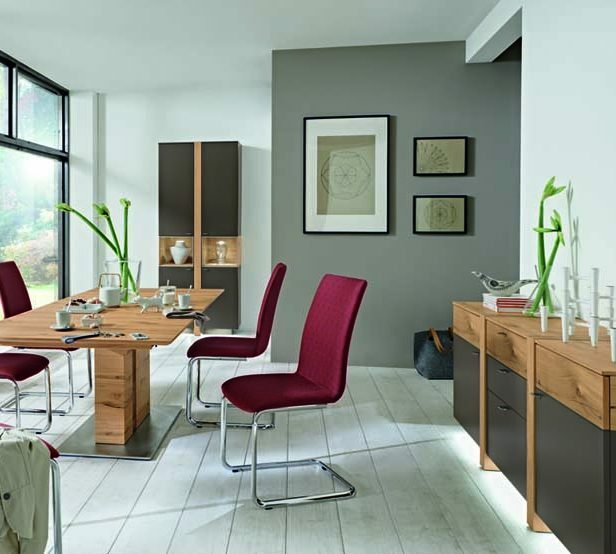 Bring some measurements and we will be pleased to advise on design schemes. 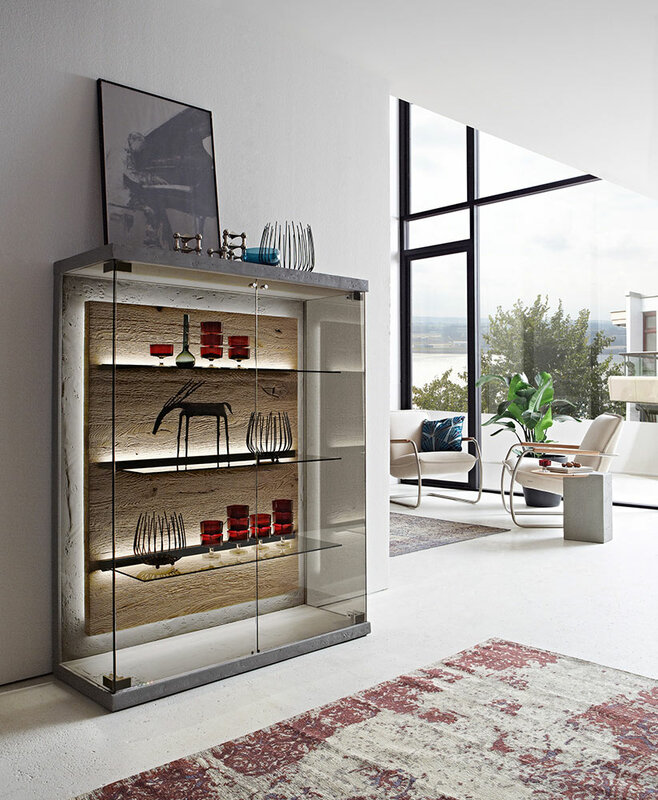 Fino is discontinued but we have a few showroom pieces to clear. 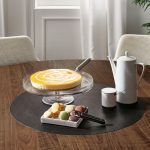 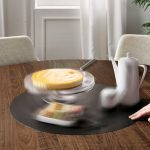 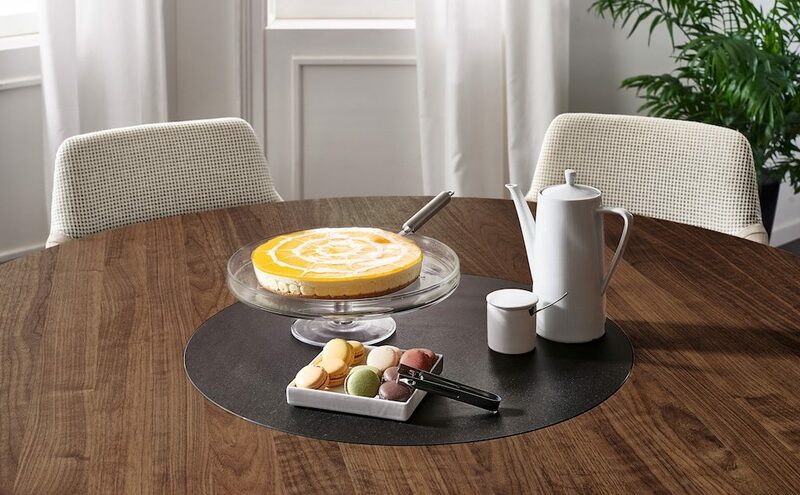 Ceramic tables are very practical being very difficult to scratch and being heat reisistant. 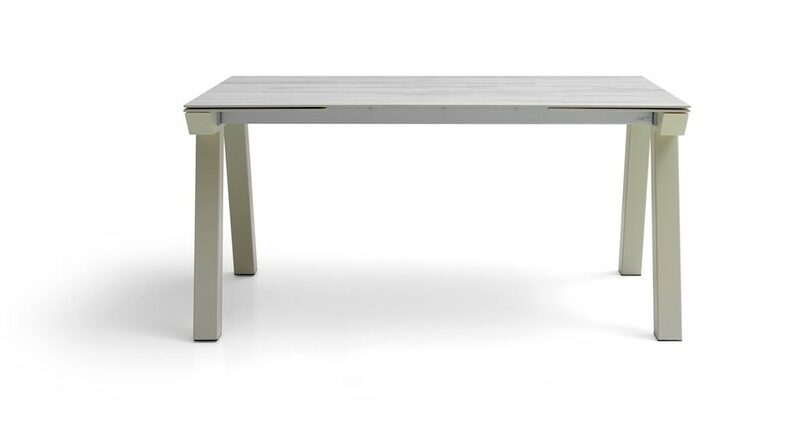 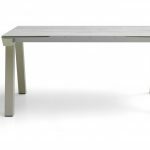 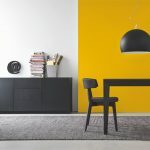 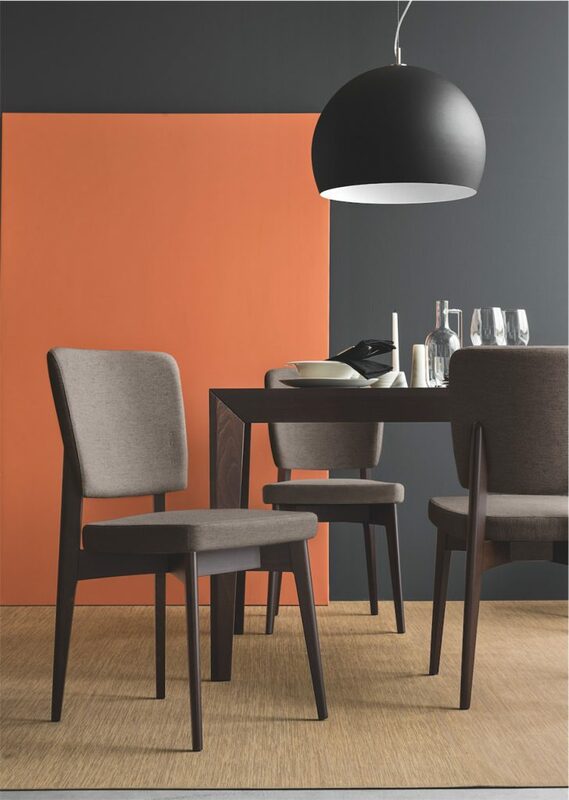 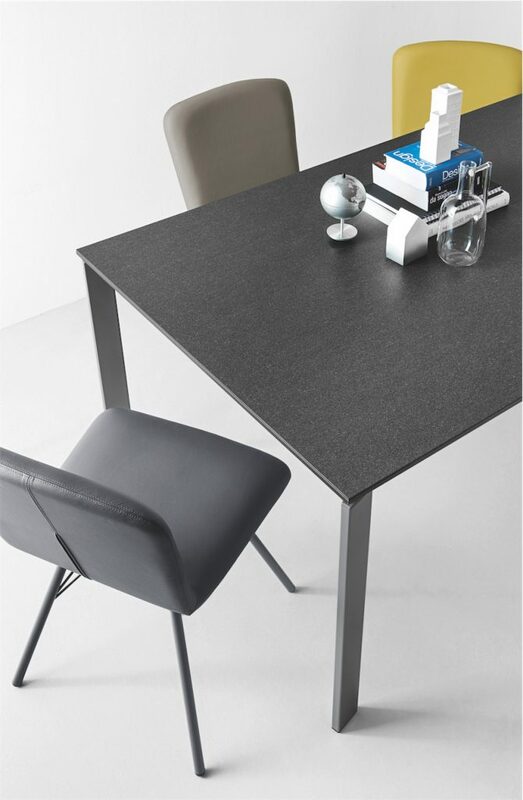 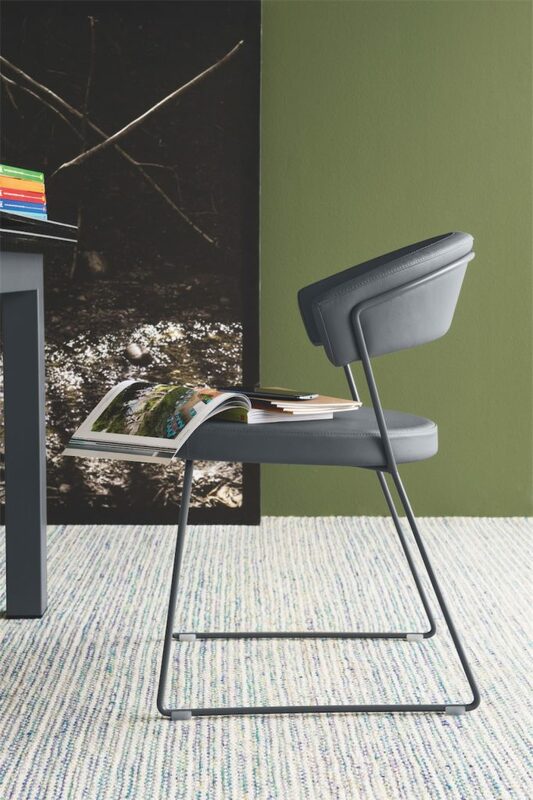 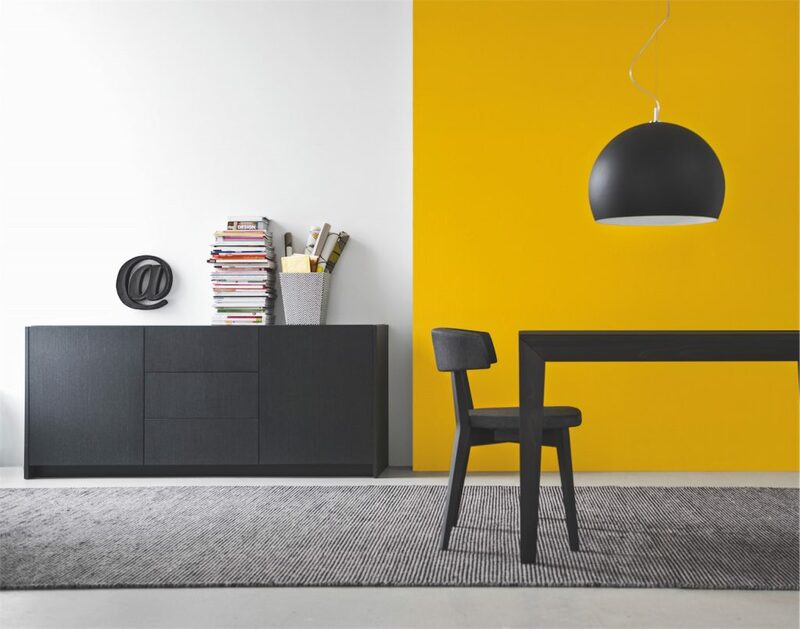 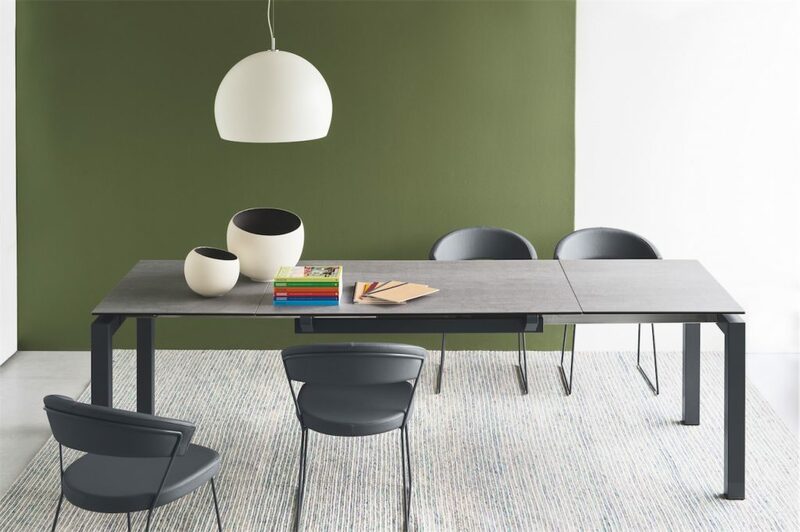 This table offers 15 colours for the metal legs and 30 different ceramic colour options. 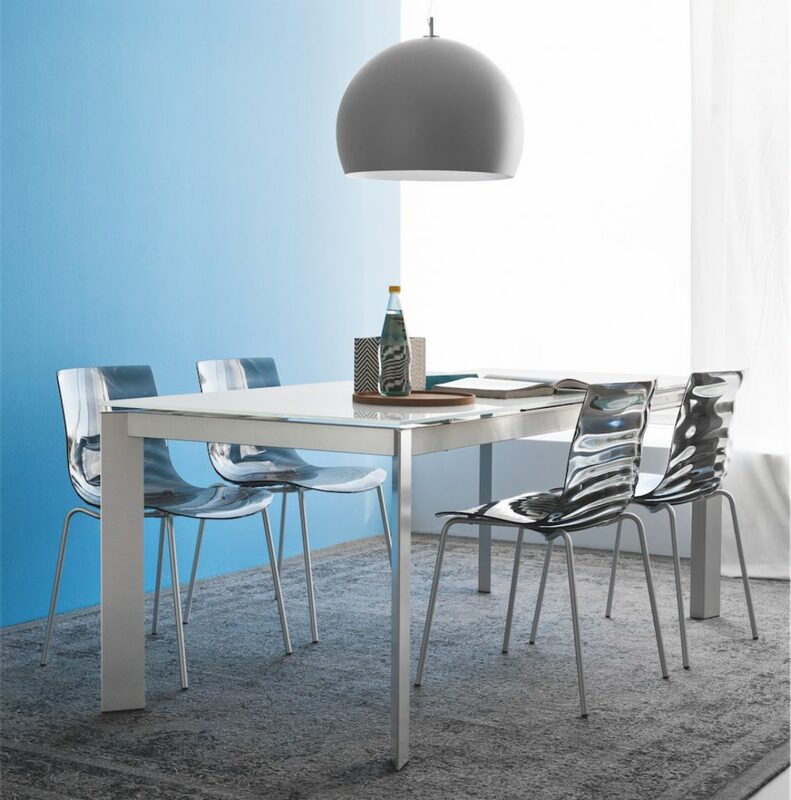 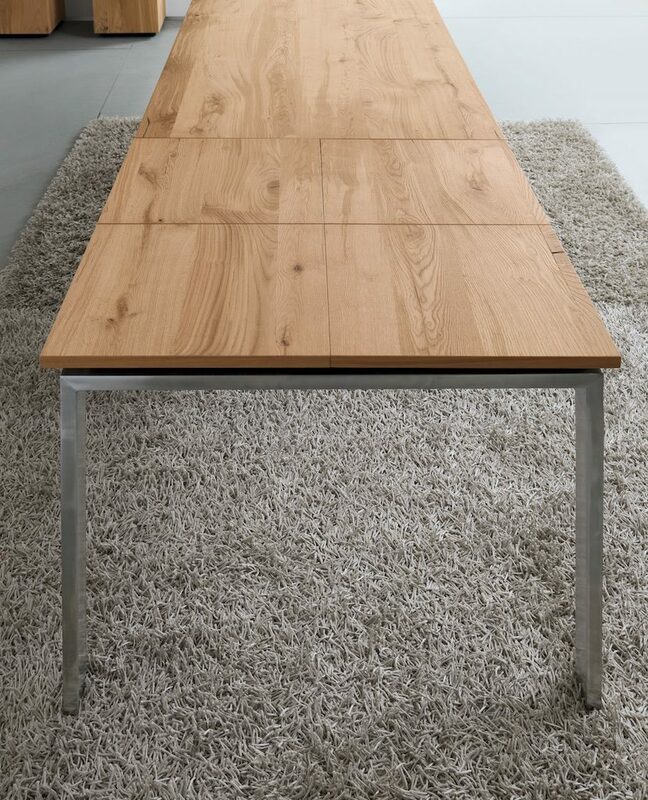 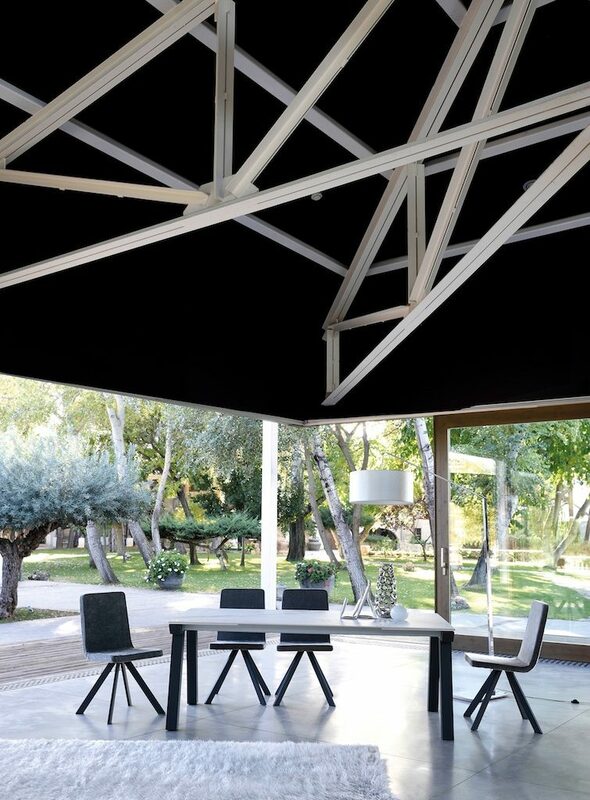 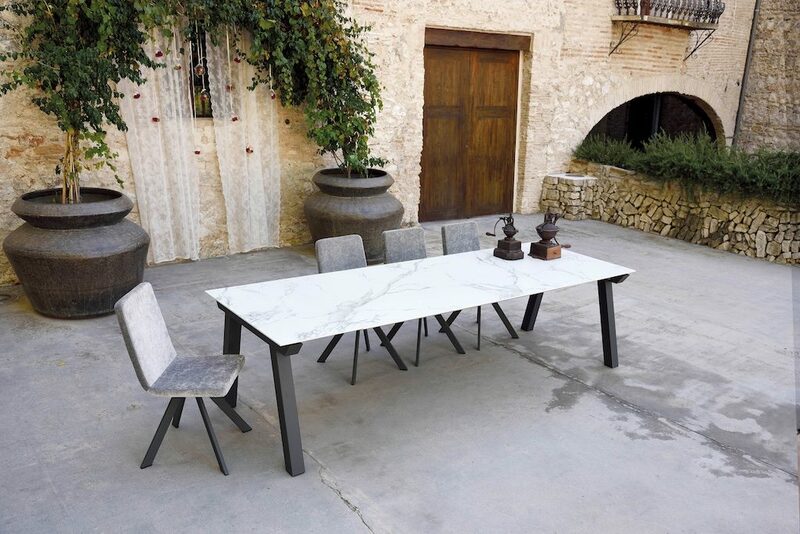 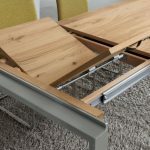 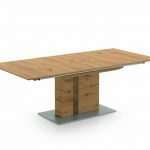 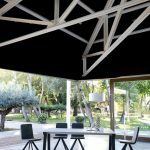 The table can be fixed or extending, in many sizes from 140cm to 220cm. 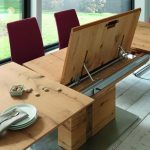 The 220cm can be extended with 2 extensions to give 340cm. 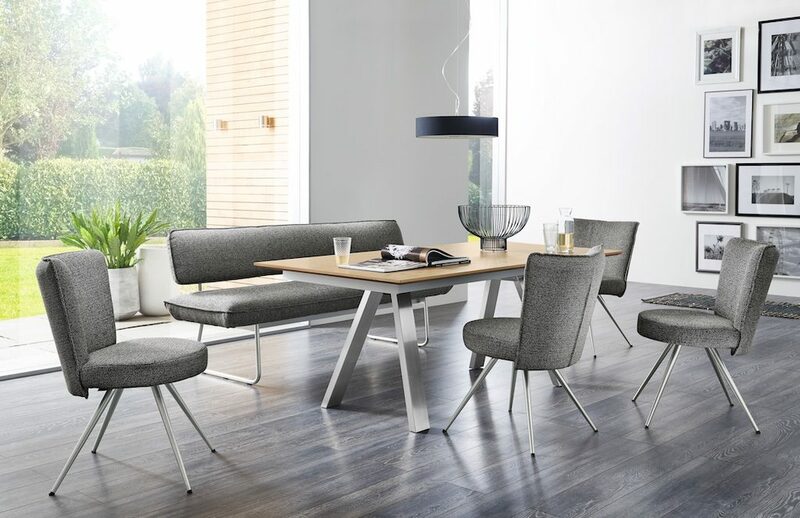 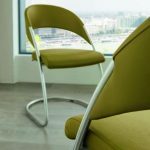 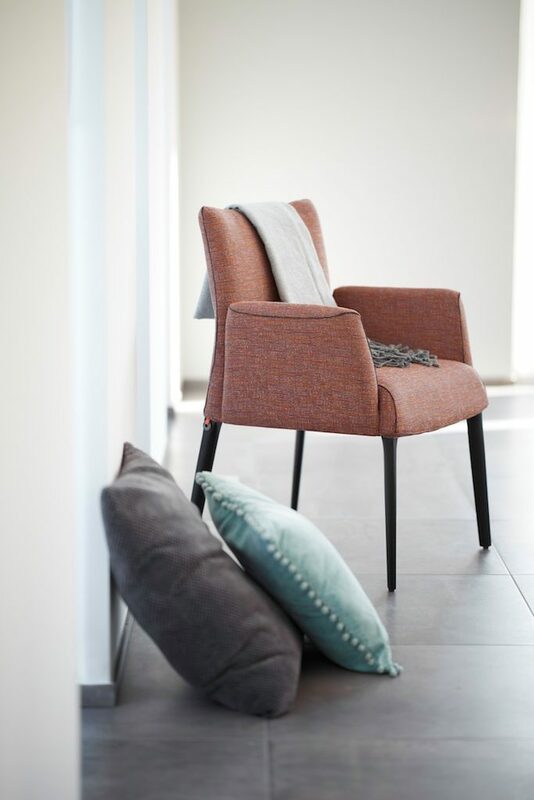 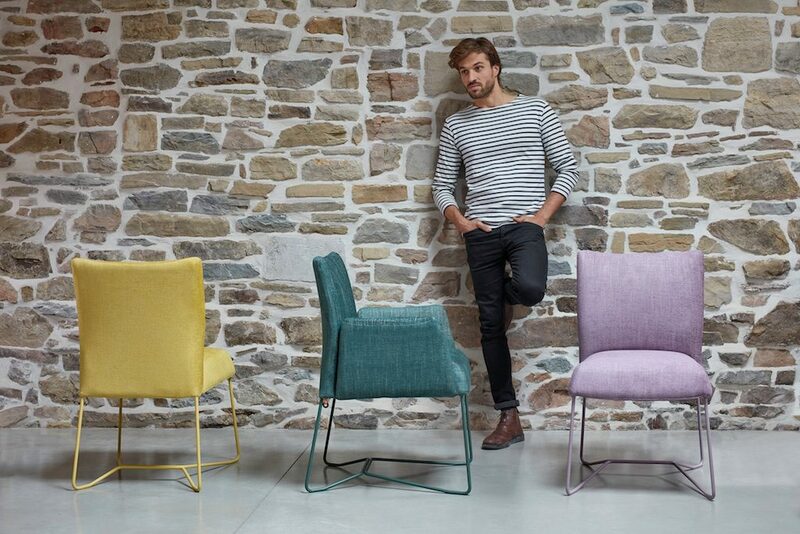 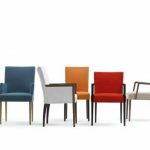 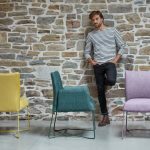 ANDIAMO is a furniture range that brings together design and functionality. 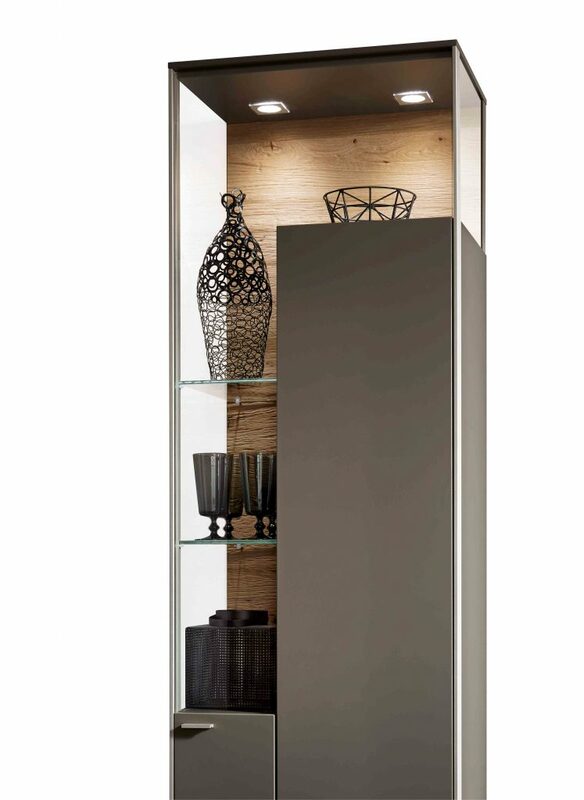 Broad horizontal elements, like flap doors and drawers, add a statement to the room. 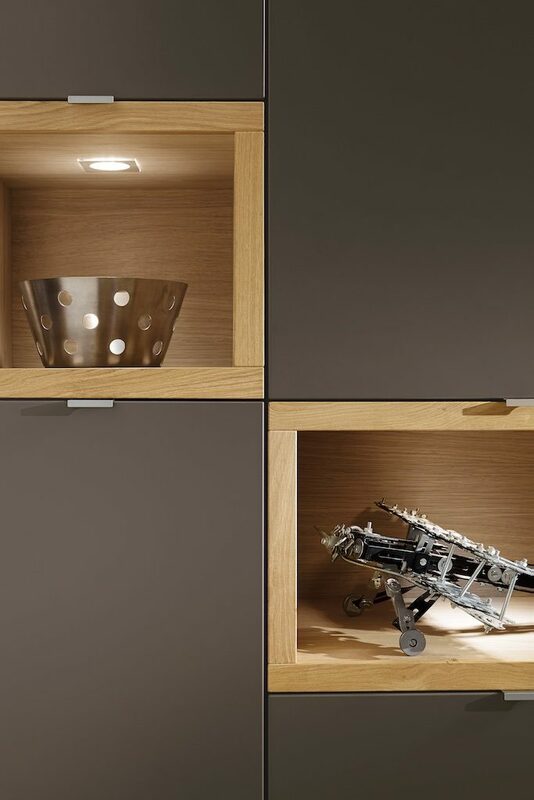 Open compartments provide plenty of space for decorative pieces and your very own personal ideas. 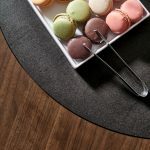 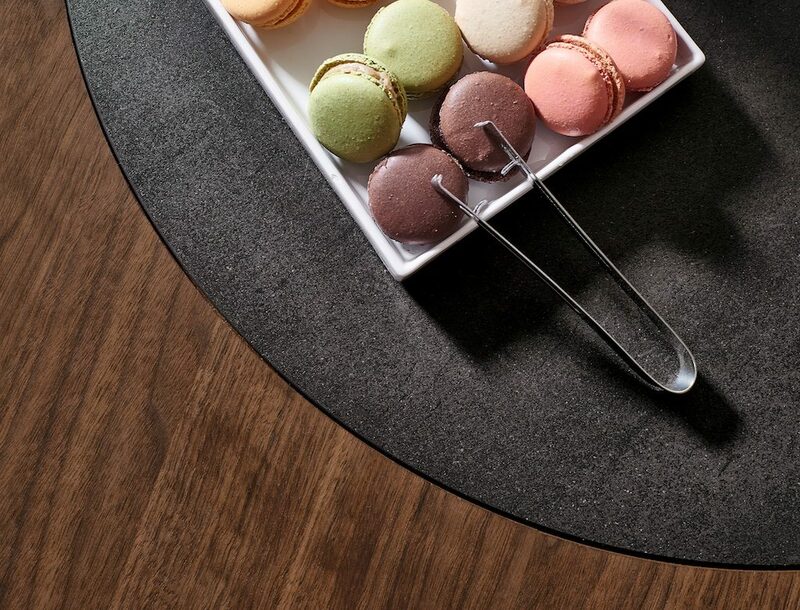 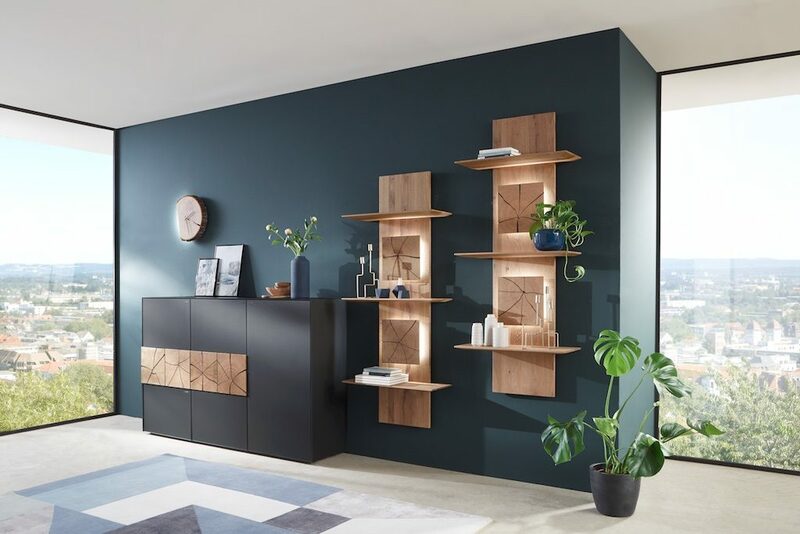 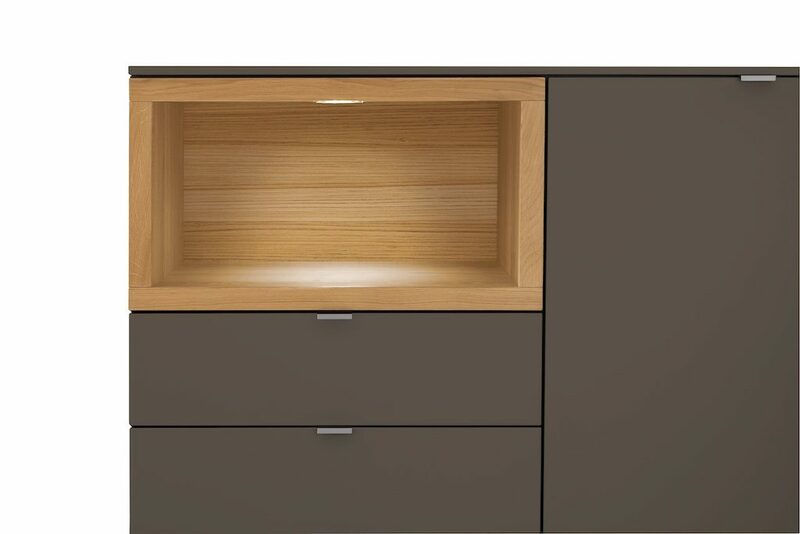 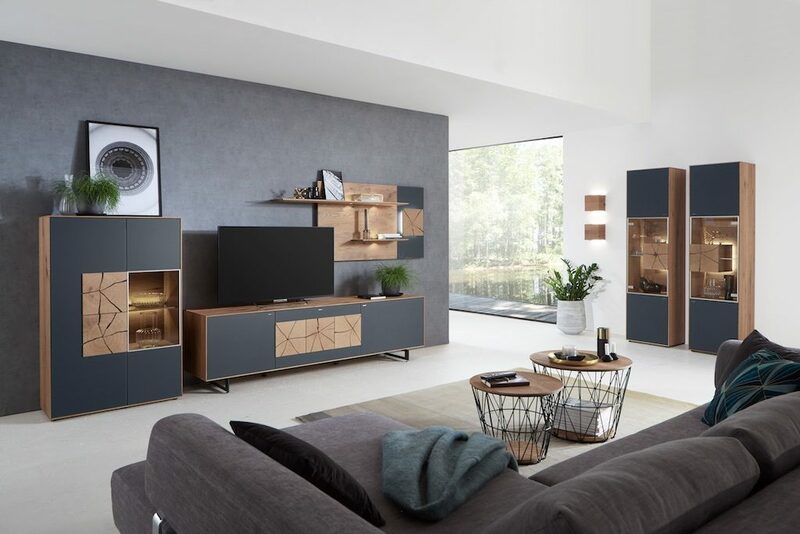 Whether matt lacquer, simply the finest timber or contrasting wooden veneer and lacquered surfaces, light, dark or cleverly combined – with Venjakob, you get all the options. 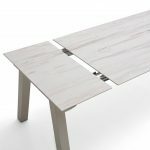 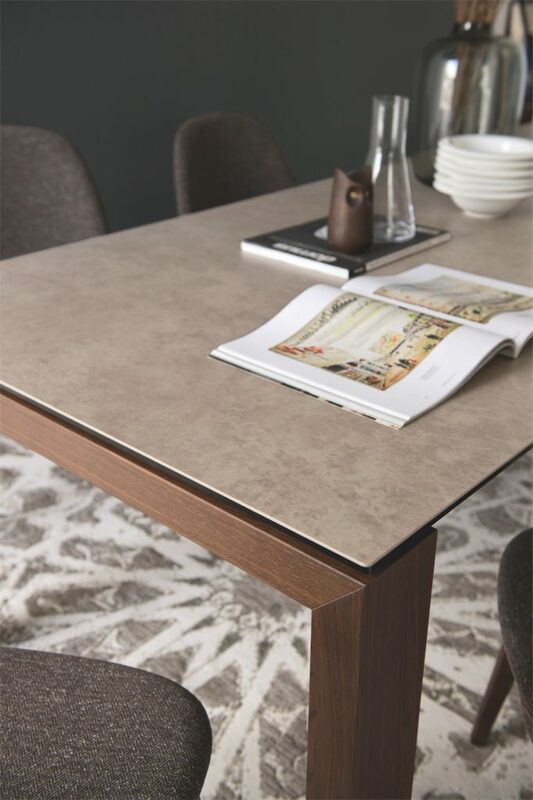 Andiamo is available in white, grey and taupe lacquers which can be combined with oak or walnut to create your individual look. 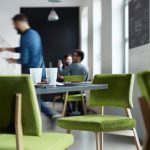 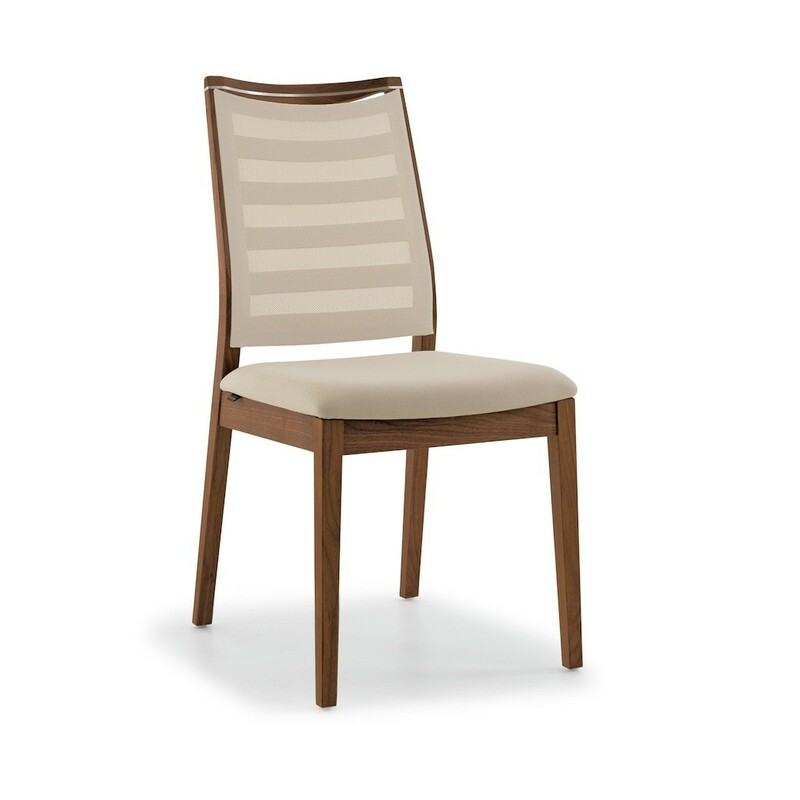 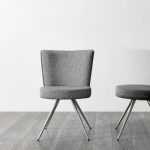 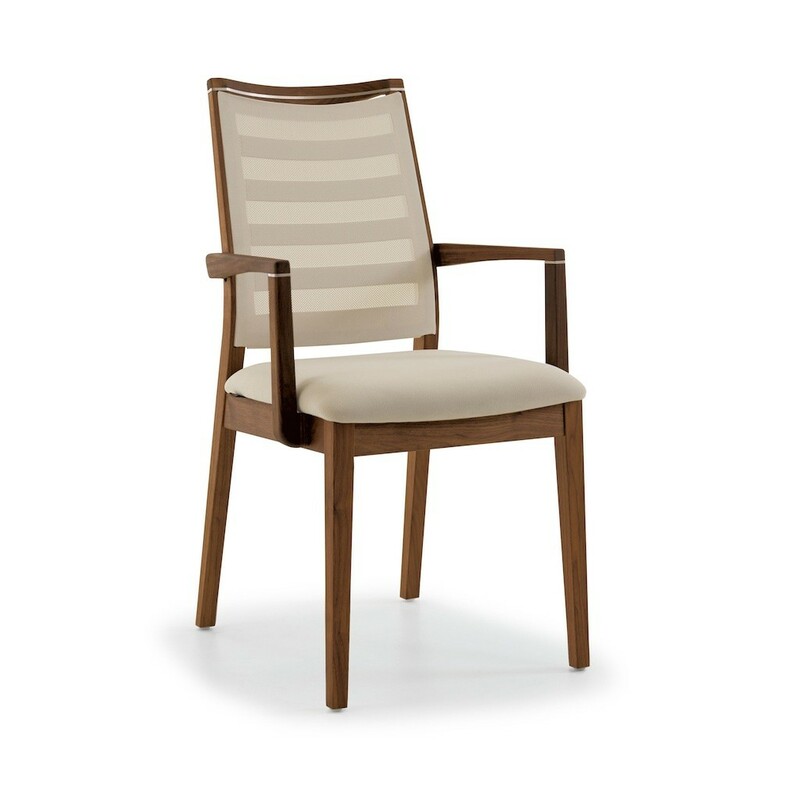 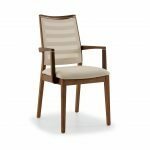 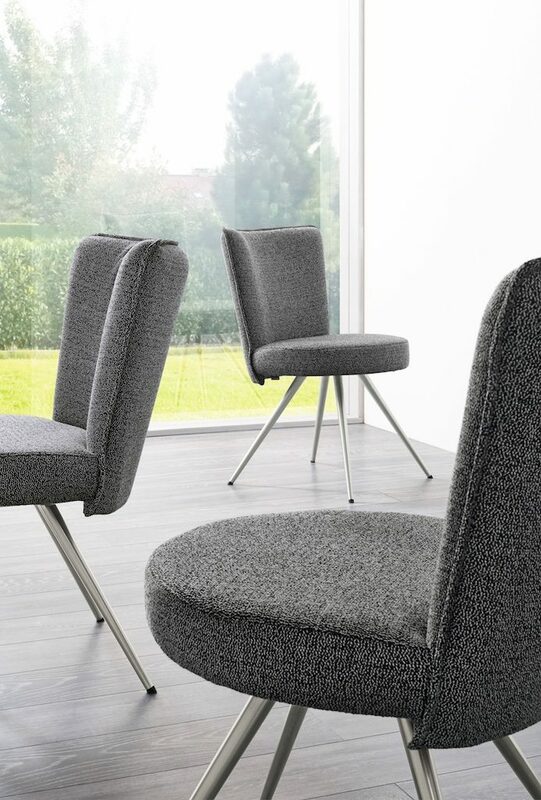 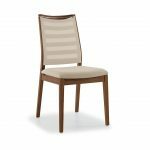 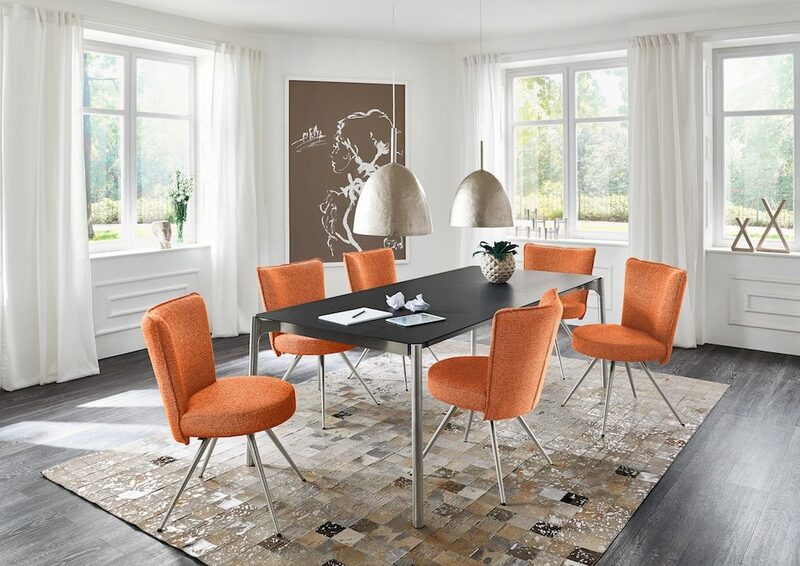 We have a huge selection of upholstered and wooden dining chairs, along with metal framed chairs. 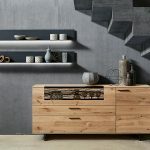 This gallery only shows a small selection. 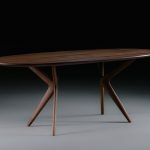 Please visit us to see the whole range. 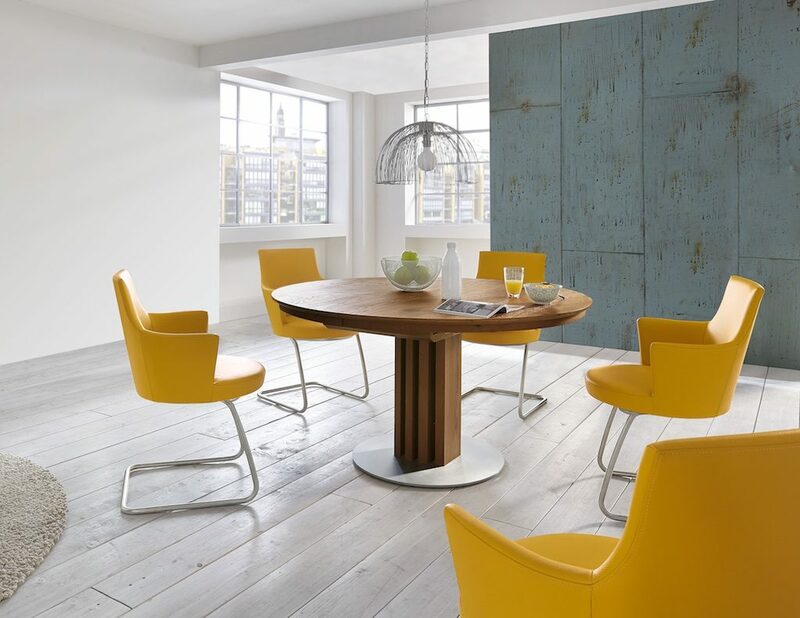 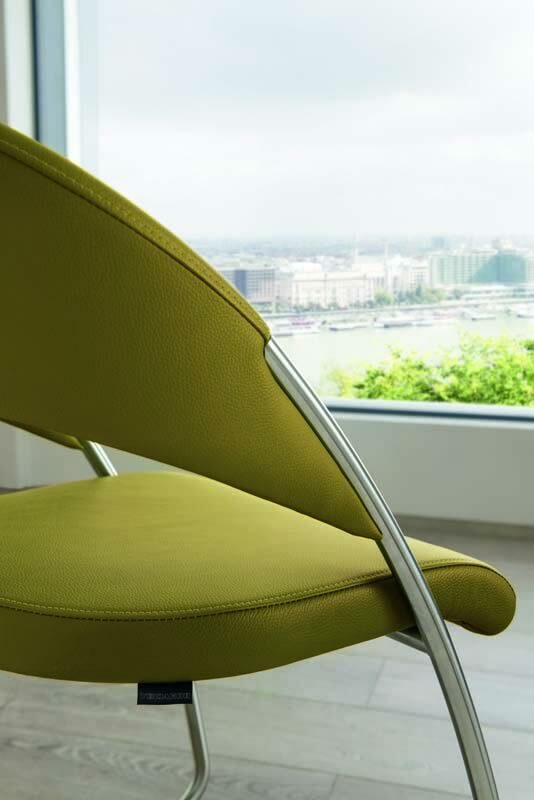 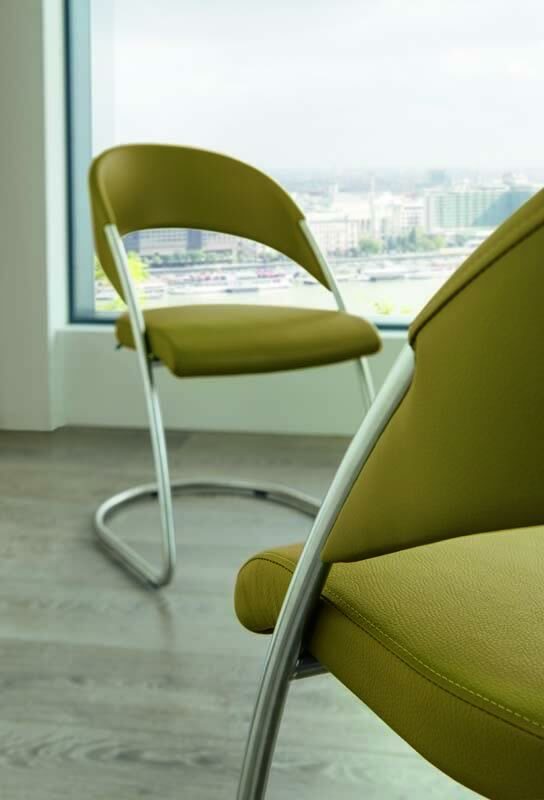 All come in a range of colours and finishes and a selection of fabric or leather coverings. 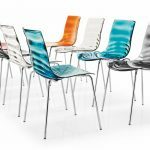 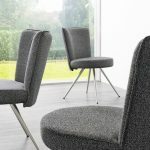 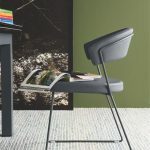 Here is a link to our catalogue where you will see more chairs from our range.